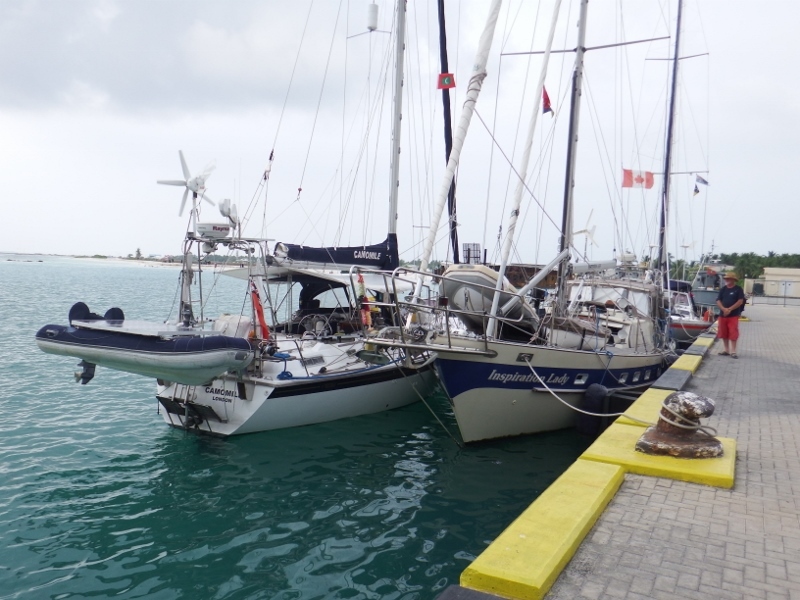 After 3 days in Huhulmale Camomile and Norsa left to explore the north Male atoll. 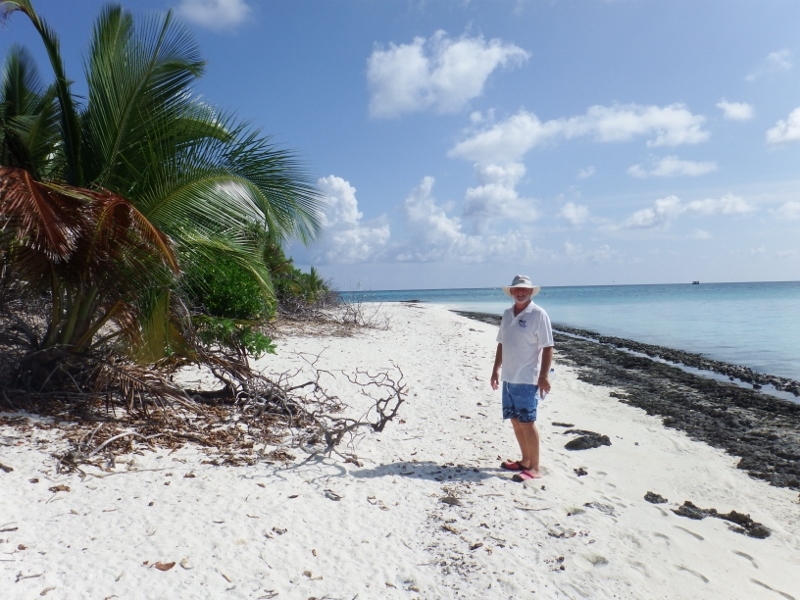 As we had come down the outside of the atoll we hadn’t had a chance to explore inside the atoll so the plan was to spend a week or two doing it together. 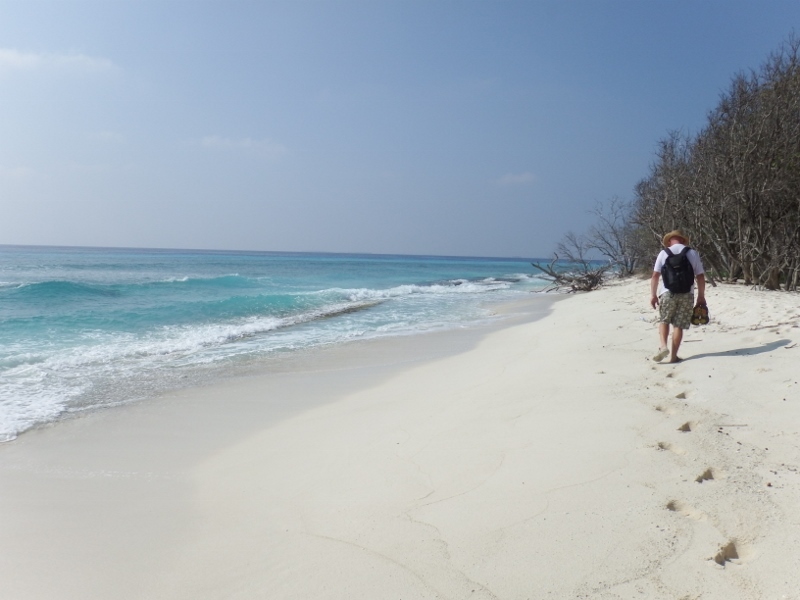 On 23rd March, after a few last minute jobs, we headed north to Masleggihura island. in 12metres of water on sand. 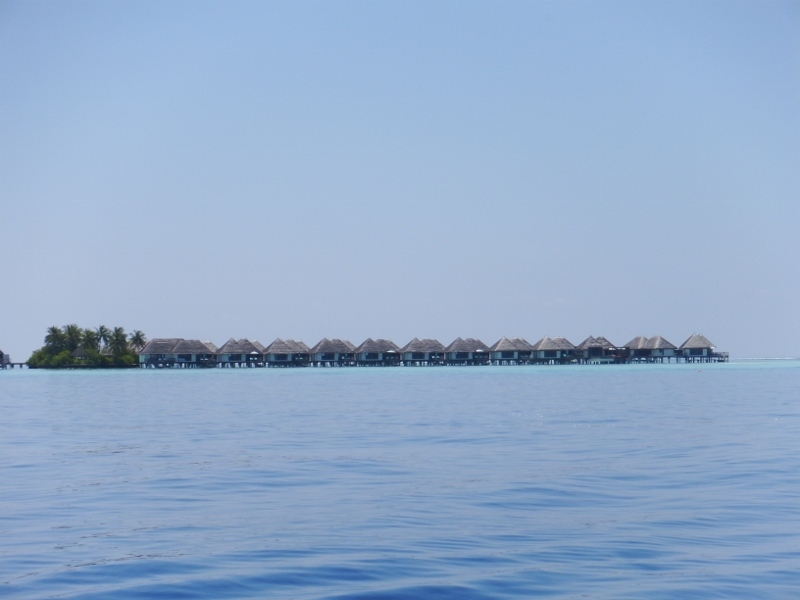 The overwater bungalows of the Four Seasons Kuda Huraa were just in front of us. 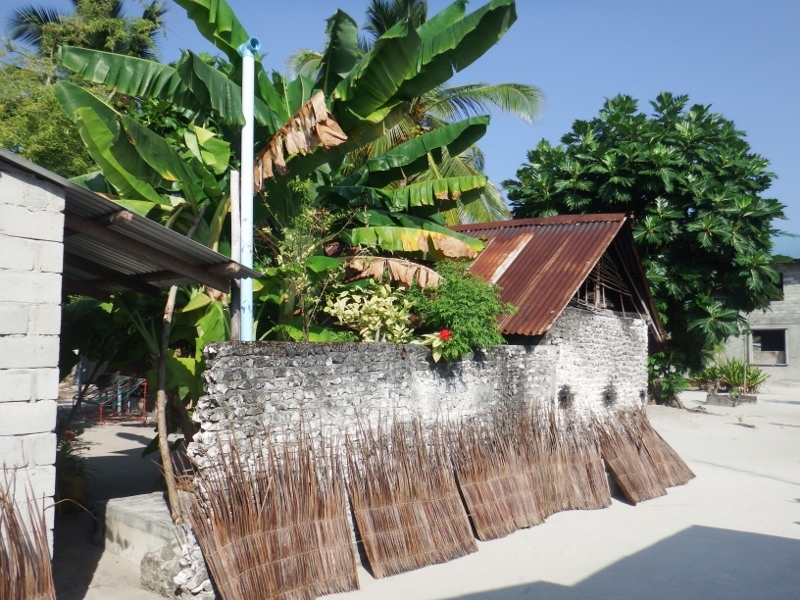 It’s difficult to see in this photo but behind these bungalows are the surfing waves that come across the Indian Ocean hitting the shallows and bringing in a great right hander. It was good to see our sailing buddies across the way from us. 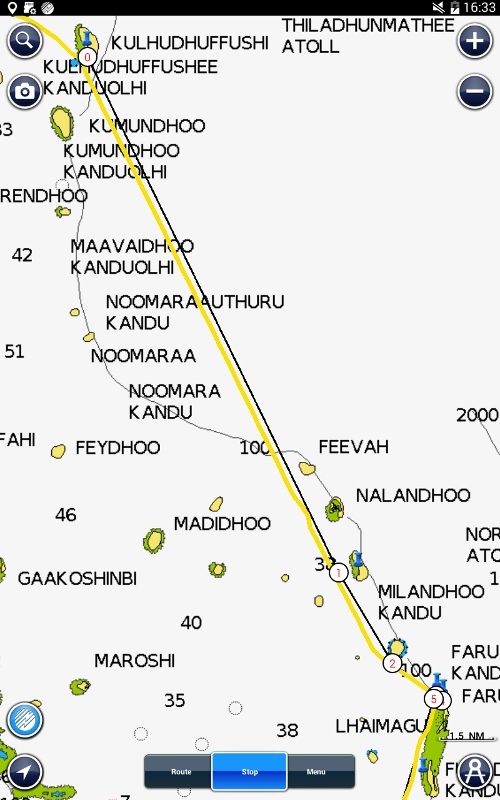 The next day both yachts continued north for about 2 hours to the Asdhoo reef. We were on about 6 metres sand but you need to look at it on google earth first before you go in. a few bommies around but otherwise good. 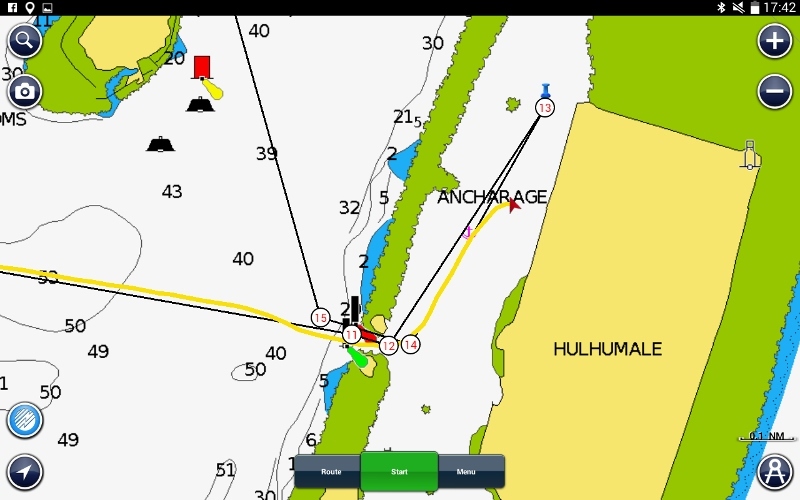 If you don’t feel brave enough to go in there’s a more open anchorage to our west (little blue pin) but we didn’t look at it. 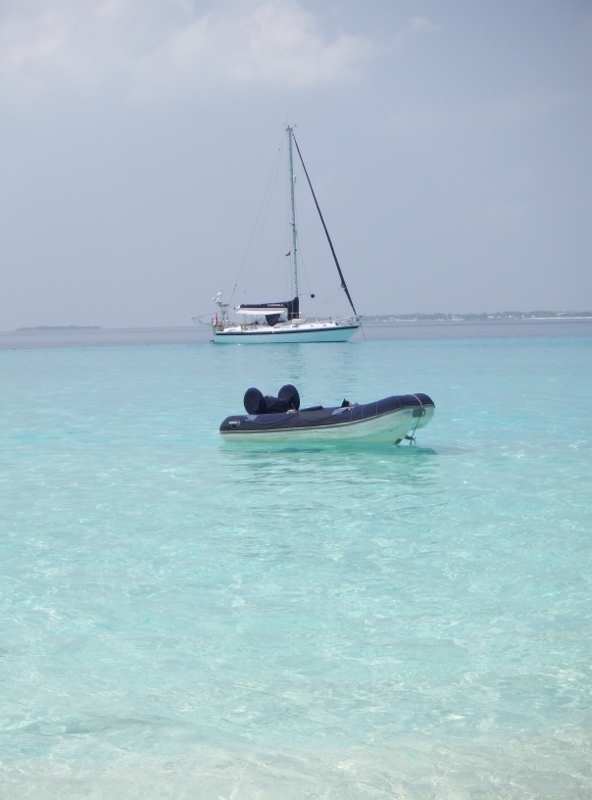 After lunch we took the dinghies across to Asdhoo island. 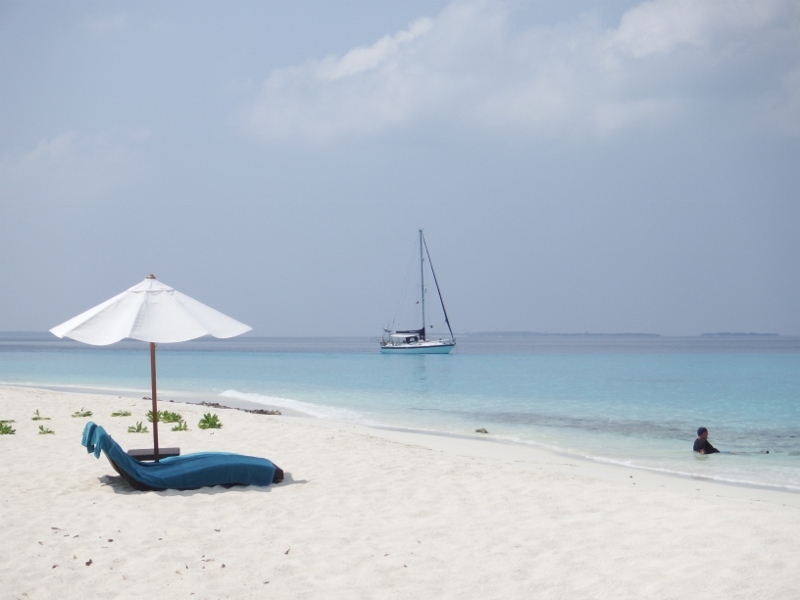 We found a lovely little holiday village called Asdu Sun Island, a delightfully laid back resort without all the trappings of the luxury resorts you normally find in the Maldive BUT also without the costs. 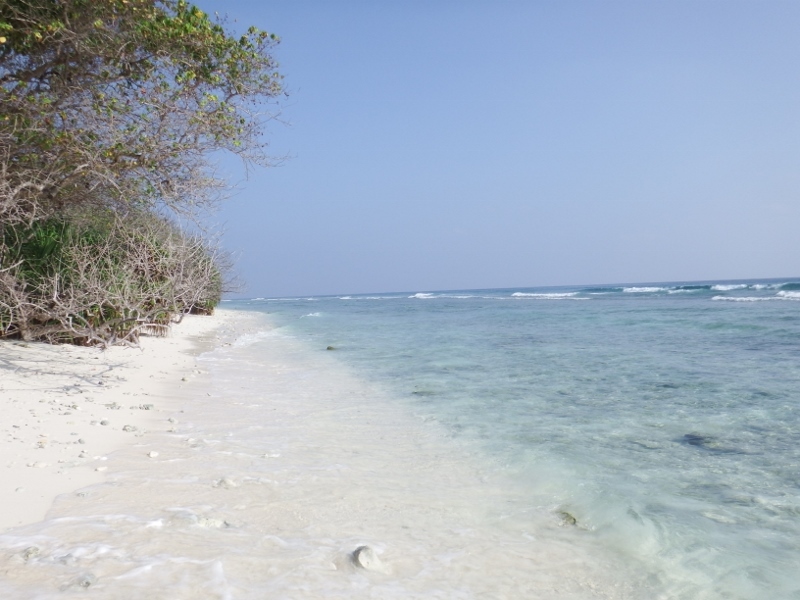 The tiny island has the most gorgeous beach surrounding it with little white painted concrete huts in among the trees. Very yachtie friendly they were quite happy for us to sit and have a beer (US$3.50) at their bar plus they were offering an evening buffet meal for $20 but as they didn’t serve it until 8pm we passed on that one. 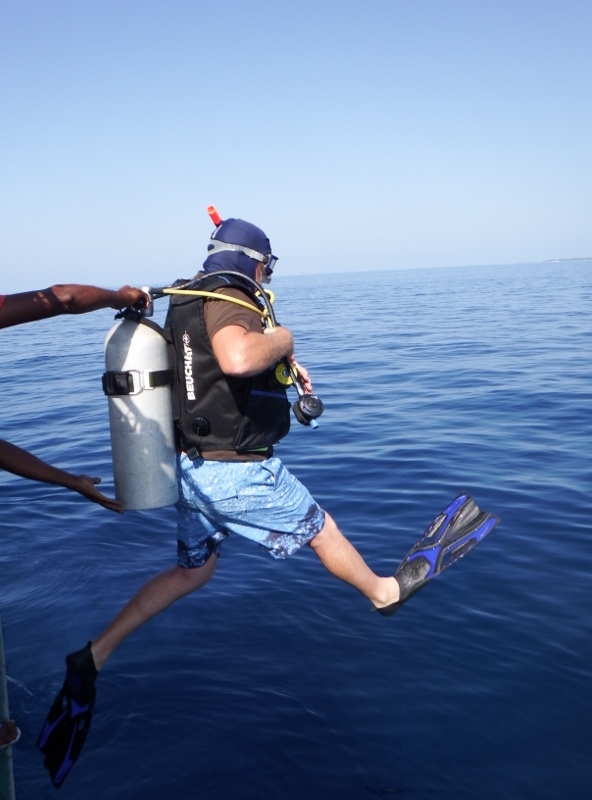 Our main objective was to check out the dive school to arrange a dive. We booked for the following afternoon. 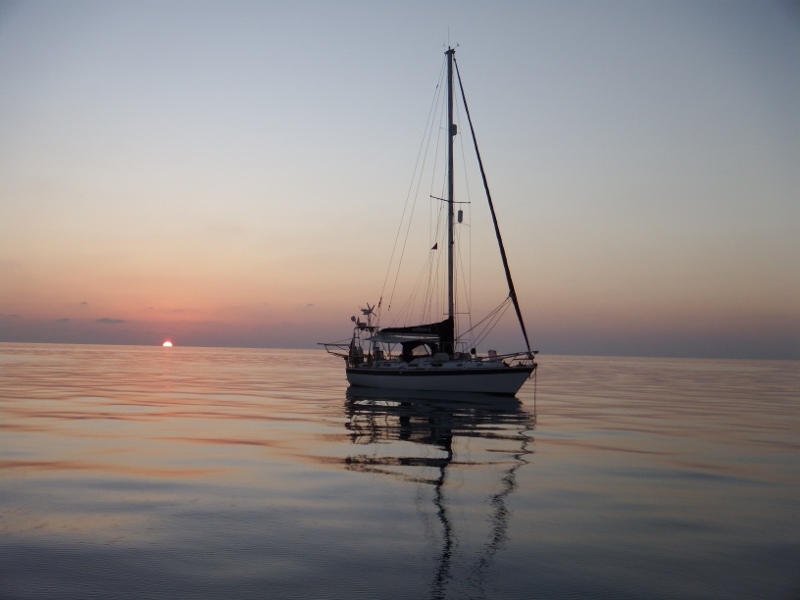 We went back to the boats for sundowners on Norsa. We had a great view of Camomile in the sunset. The next morning there wasn’t a breathe of wind and the water was so clear. This was the view from the bathing platform. 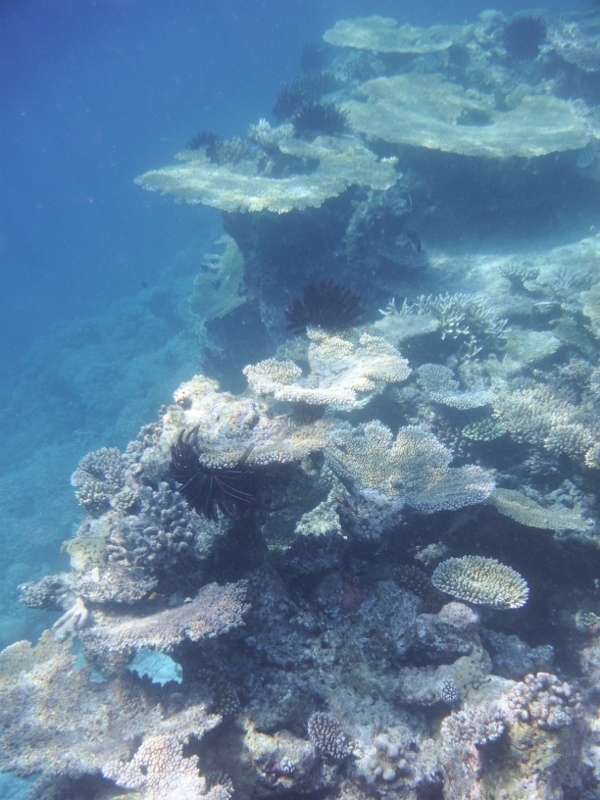 It looked as though the reef was just under the surface but it was 3 or 4 metres below us and not a danger to us at all; amazing to see. You can just about see the rudder at the top of the photo. That morning Bill and Norman got their dive kits out partly to have a practise as it’s quite a few years since Norman has dived and partly because Norsa’s anchor chain had wrapped a bommie overnight and Bill and Norman thought it would be good chance to try out their kit before the dive in the afternoon. The water was nice and clear, all went well and the chain was freed. Sara also had a practise . After lunch we went back to Ashdoo island for the dive. It took about an half hour to get everything sorted and loaded onto the dive boat and we were off. 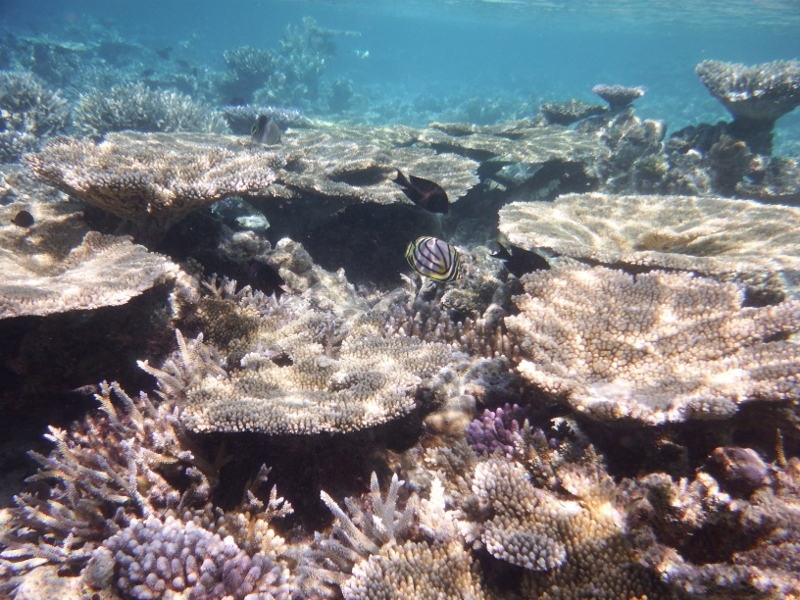 It was nice to be in someone else’s boat and not worry about where the reef was. The dive boat went around the back of the island and you can see the accommodation, it isn’t brilliant but good value for anyone that wants a budget holiday in the Maldives. It’s only about 2 hours on a ferry from Male. After about half an hour we stopped by the Panetone reef. The island has a lot of Italians staying there and the dive master was also Italian. 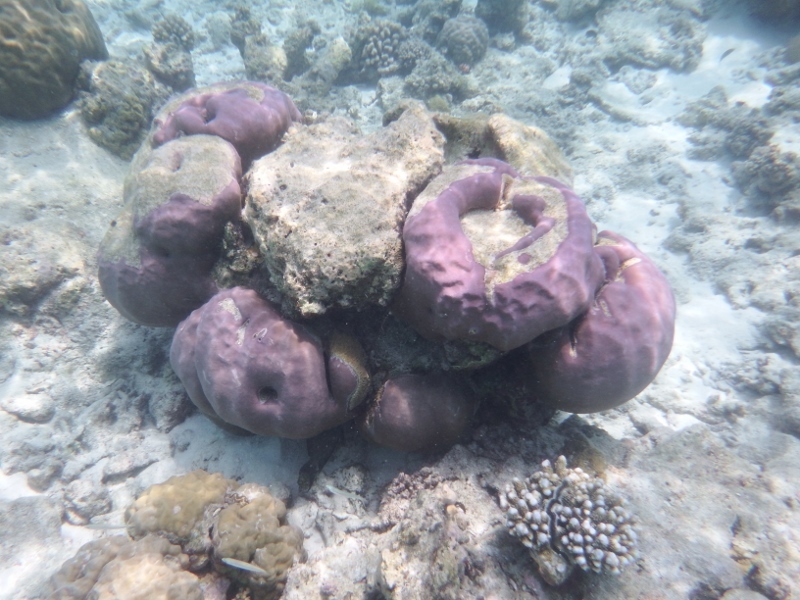 Panetone means cake in Italian and apparently that’s what the reef is like – round with coral all around the edge. 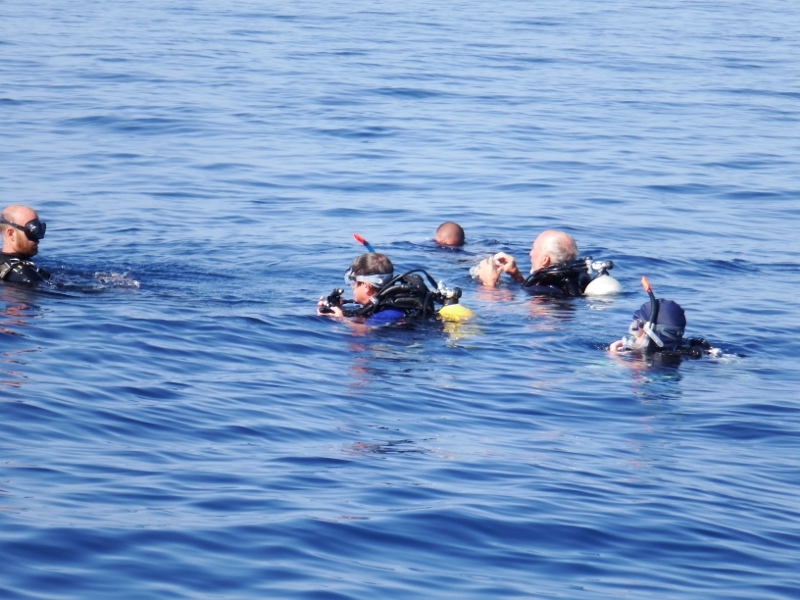 Luckily there was only Bill, Norman and Sara diving with 2 dive masters so it was good for their first dive. I don’t dive but had a bit of a snorkel over the top although it was a bit deep and the visibility wasn’t great. They all enjoyed their dive. After doing a circuit of ‘the cake’ they did a second circuit higher across the top and saw 4 turtles. 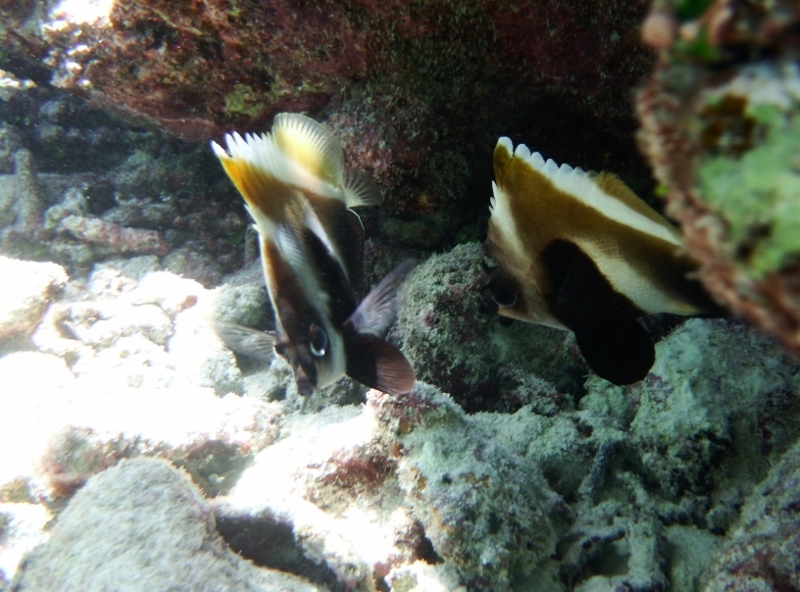 I’d looked for them while snorkeling but hadn’t seen any. 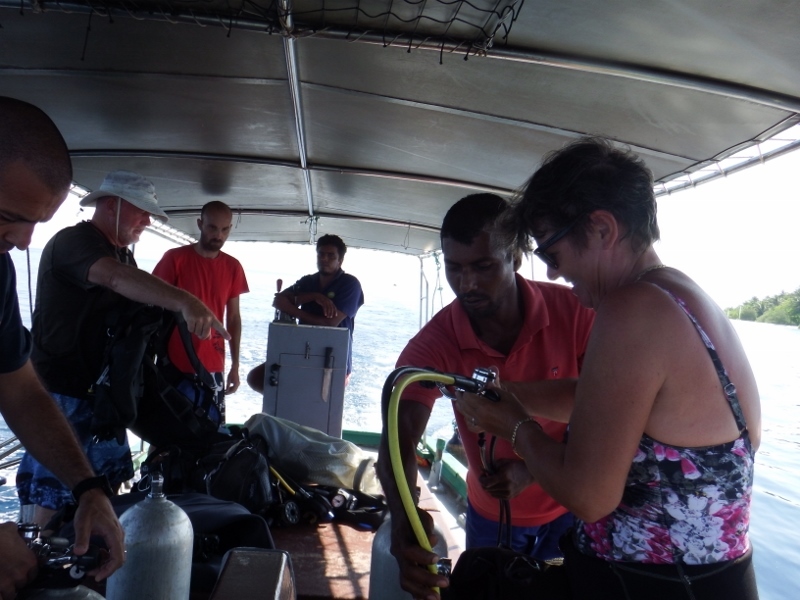 The cost was US$51 for Bill’s dive with his own equipment but Norman and Sara paid nearer $160 because they hired some things as well. When we got back Ken and Eiloo had arrives on Antares II so we all enjoyed a beer together at the bar. It was such a lovely spot we stayed another day. 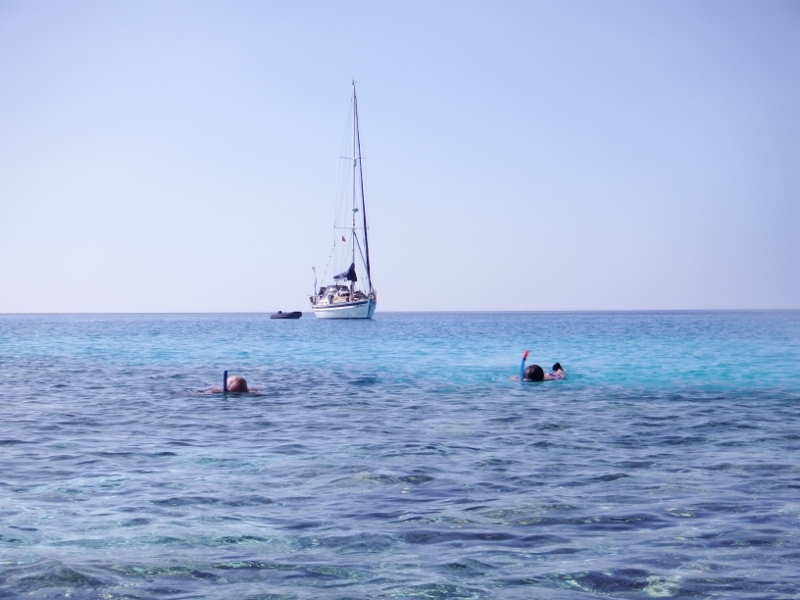 On Saturday 26th, Easter Saturday, we had a wonderful snorkel. 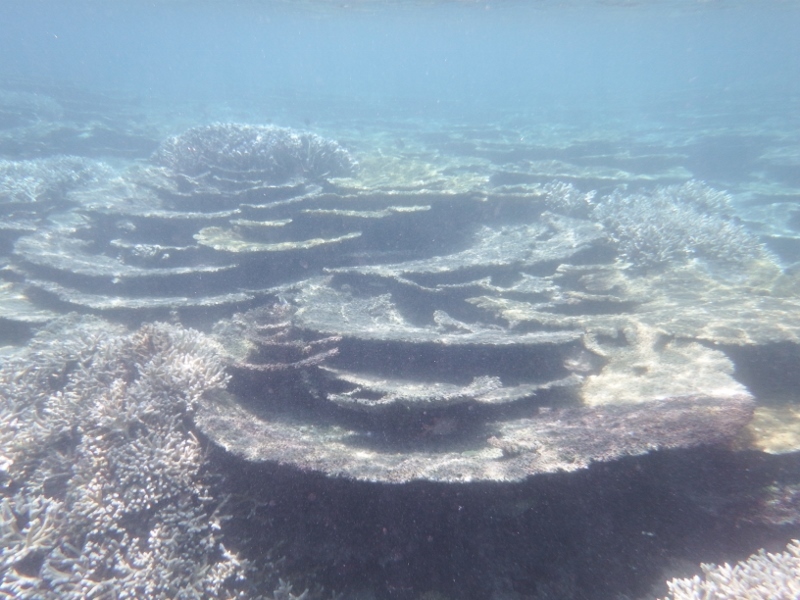 The boats were surrounded by reef on three sides so we were spoilt for choice. 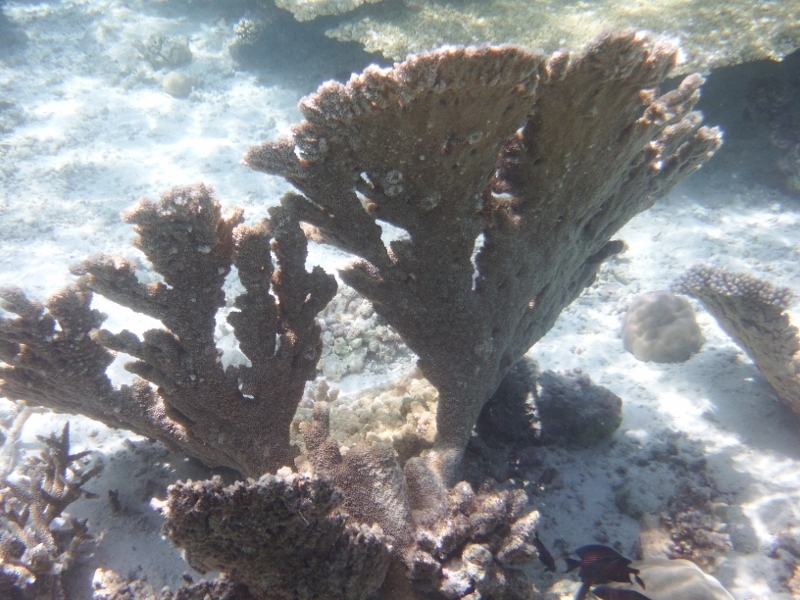 Wonderful coral. 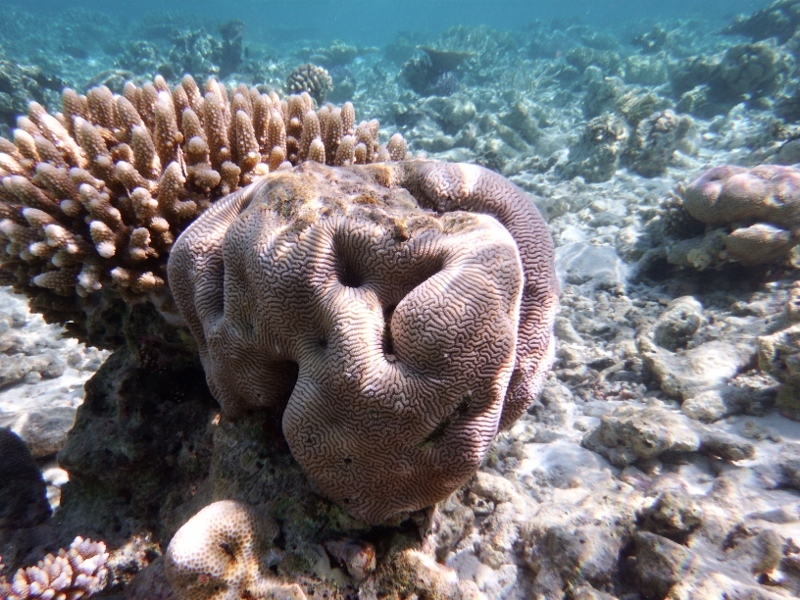 This is brain coral because as you can see it looks like a brain! It was about 2 feet high. 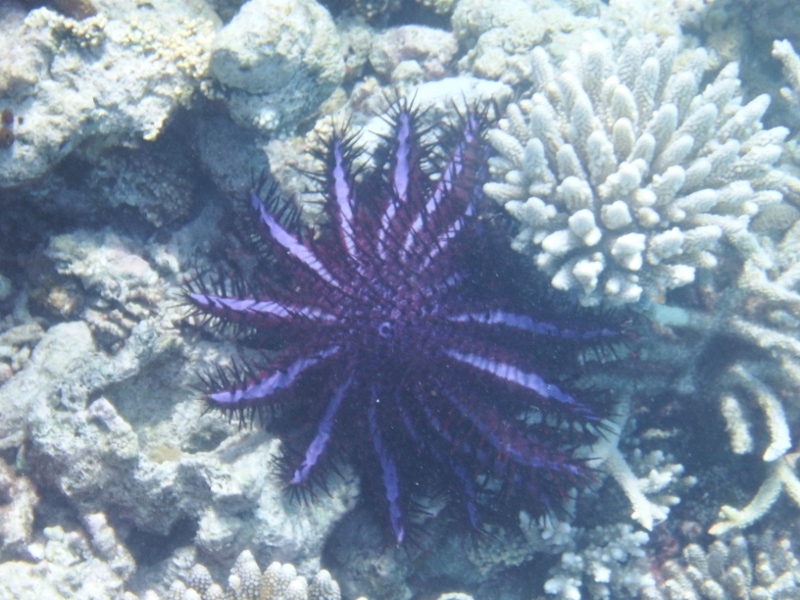 Unfortunately these beautiful starfish are the enemy of the reef. They are called Crown of Thorns because they are covered in spiny thorns and are impossible to pick up. 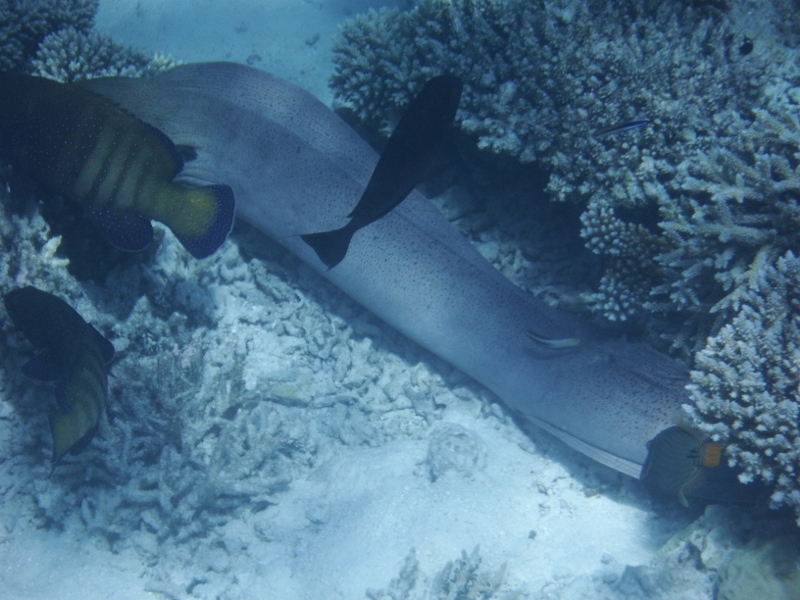 They eat the coral and we’ve seen whole areas devastated by them. 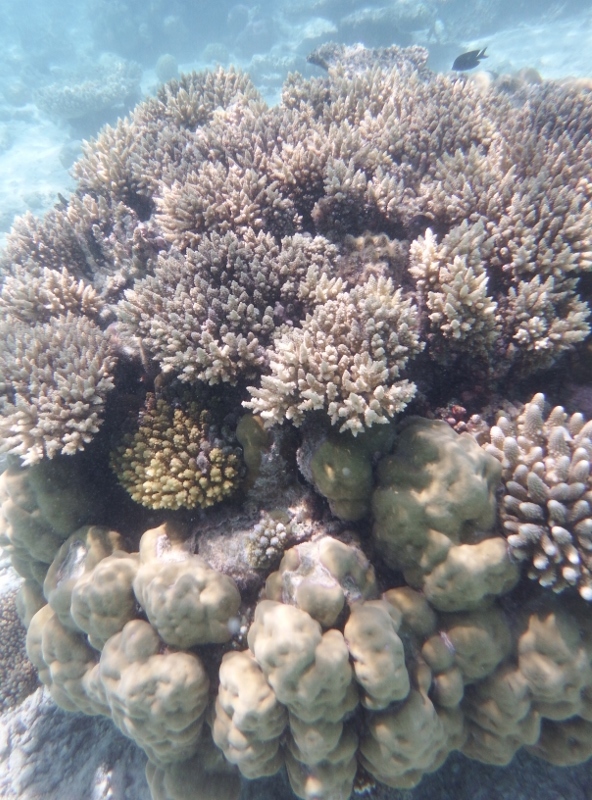 There are more crown of thorns in this photo and you can see the white coral in the middle of the picture is being gradually eaten by them. 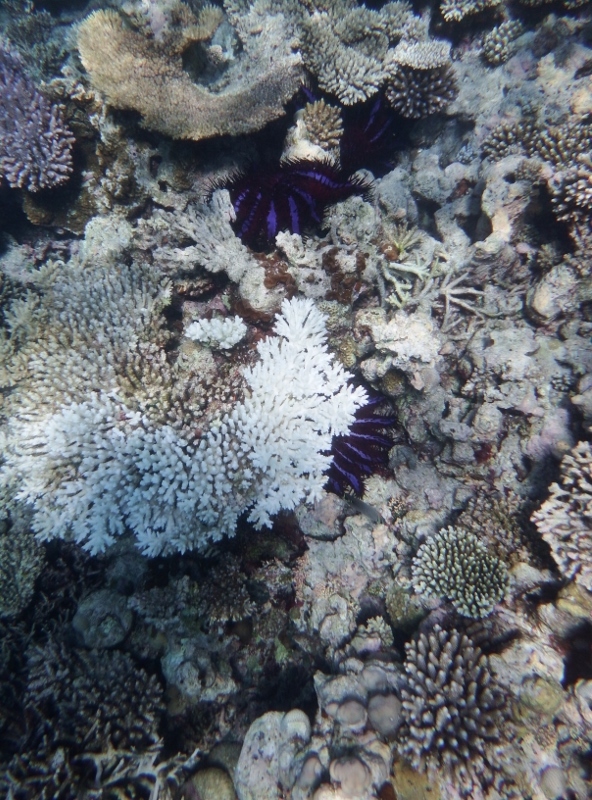 This area is suffering enough with the bleaching of the coral caused by the warm waters of El Nino it doesn’t need these creatures too. Norman and Sara swam over to join us. We stayed in the water for a long time. 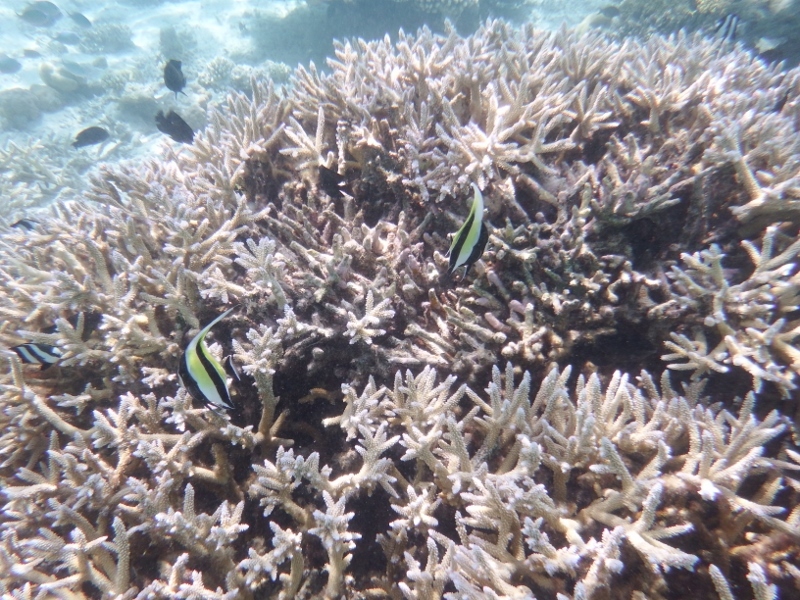 The coral was very pretty with lots of fish but nothing big today. 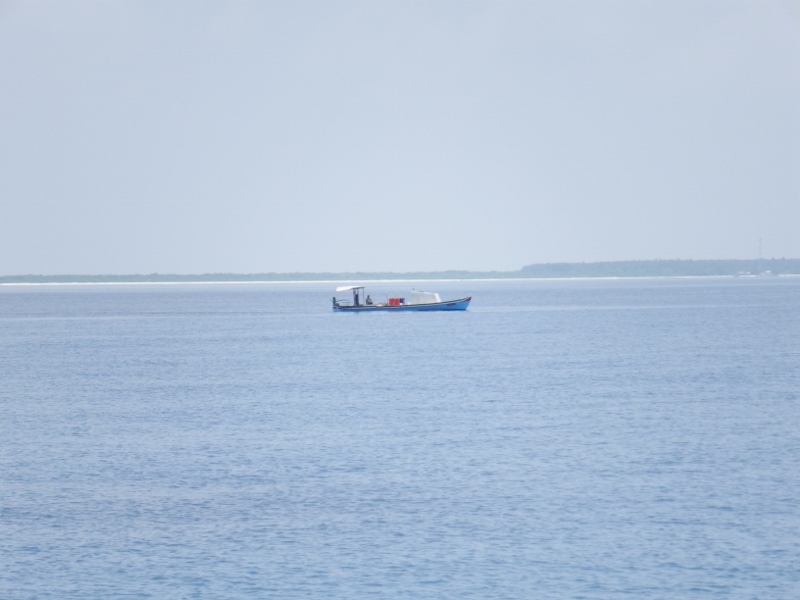 The next day we heard on the net that Tintin and Inspiration Lady were arriving in the North Male atoll and, more importantly, Jacqui had mini easter eggs on board. 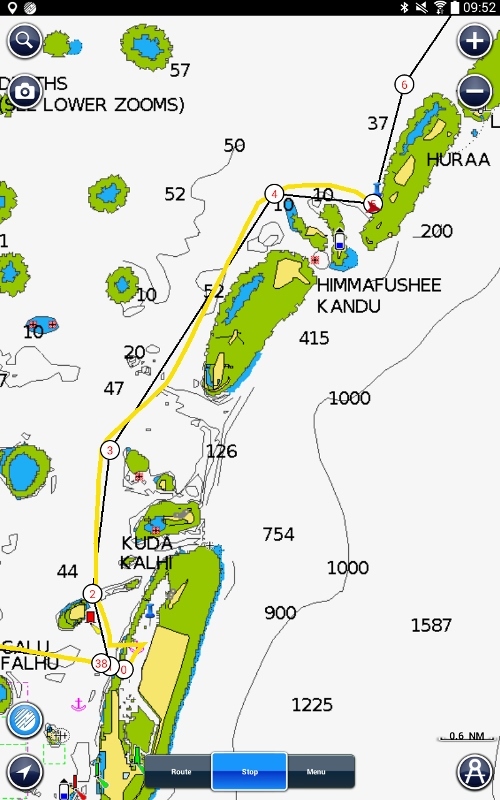 Originally we had planned to go to the resort at Helengeli then into the Maa Haa atoll then over to Himmiya but plans are designed to be changed so Camomile and Norsa went across the atoll to Himmiya instead. 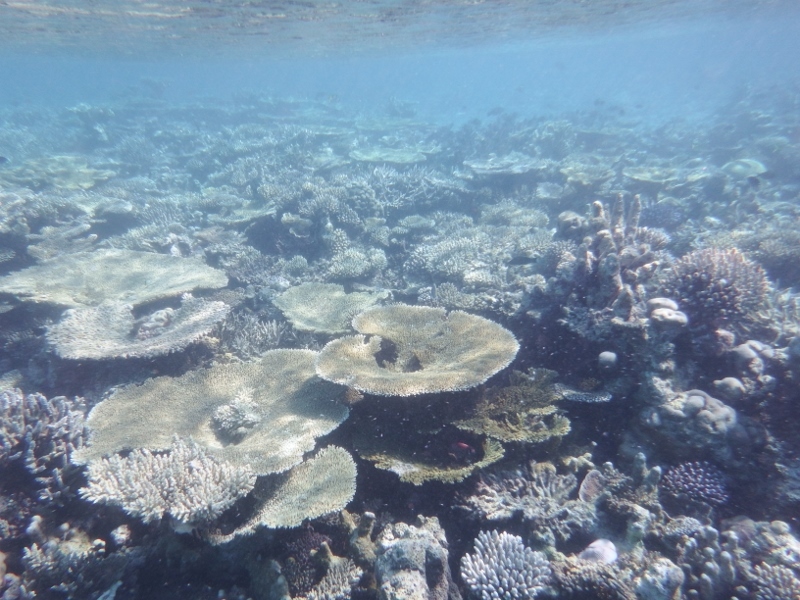 As we arrived I stood up on the bow watching the coral under us. 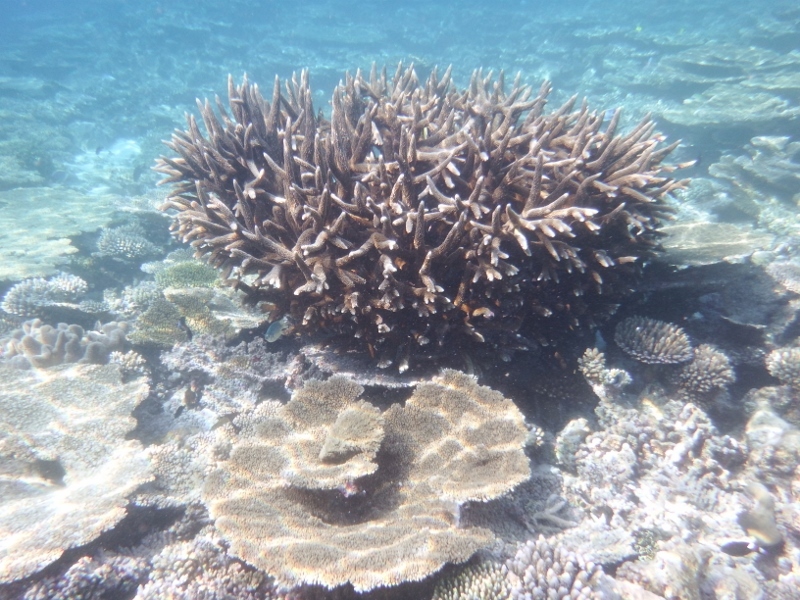 The dark patches are coral, the light patches in between is sand. Fortunately nothing less than 6 metres and all good. It looks as though all of the northern area is open but it isn’t. 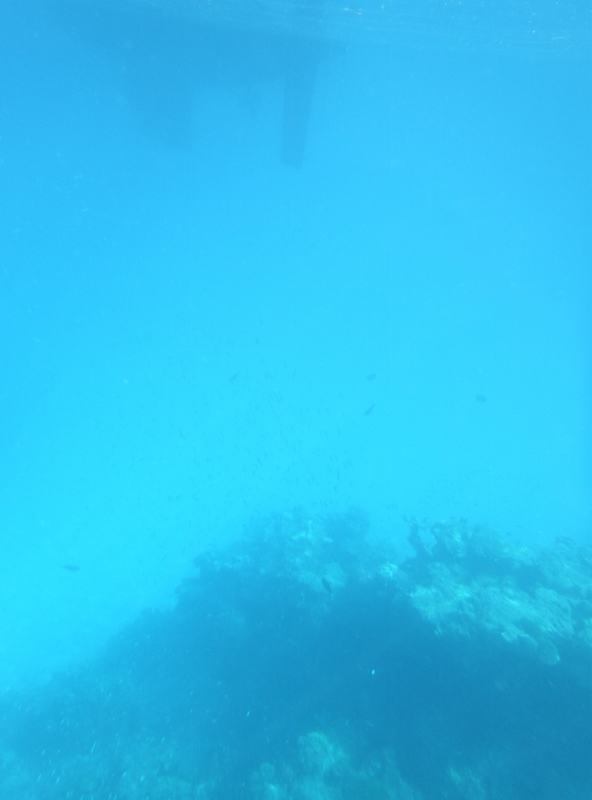 There was a semi circle of coral right around the top and we crossed the reef just as we turned to port. There was an area there that was deeper than the rest. The chart is out again. Norsa arrived just ahead of us. Inspiration Lady just behind them. Norman and Sara haven’t seen Jackie and Gary or Jacqui and Kevin in almost 2 years. After the anchors settled we all headed across to a nearby resort for lunch. We shared a club sandwich. Great to have everyone together again. The resort was very nice and allowed yachties in (a lot of them don’t) but it was fairly expensive with beers at US$6 and that was only a can. Jacqui treated herself to a cocktail but we just drank water. 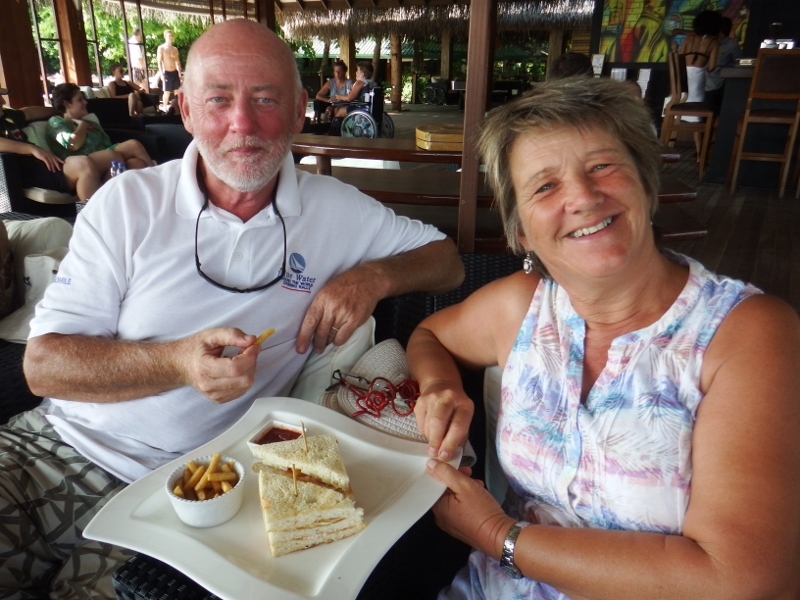 We shared a club sandwich and even that was $20++ I can buy a lot of groceries with that sort of money. The resort was very relaxing though and we sat and chatted for the afternoon. Jacqui doing her impression of the Easter bunny. 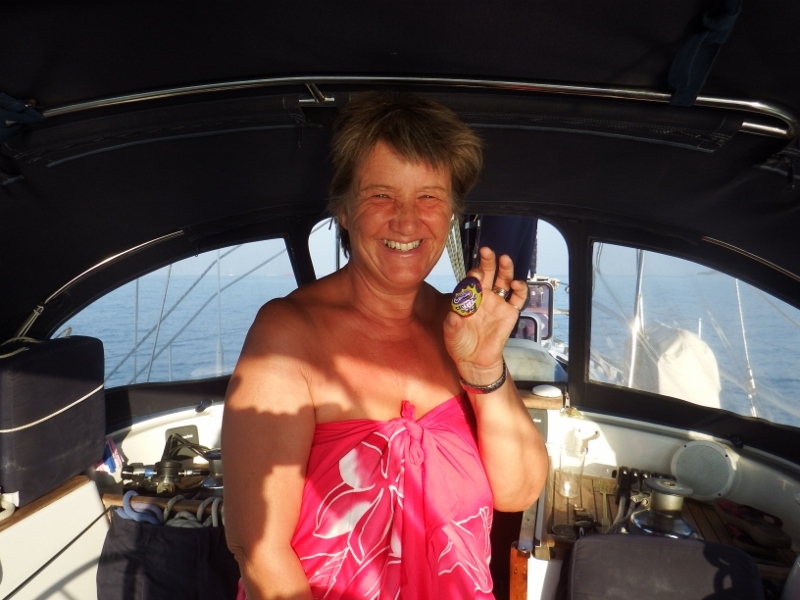 When we got back to the boats Kevin and Jacqui came round all the boats with Jacqui doing her Easter bunny impression and handing out Cadbury’s creme eggs. As I haven’t had so much as a sniff of an Easter egg this year or even any chocolate, it was very welcome and gone before they got back to Tintin! 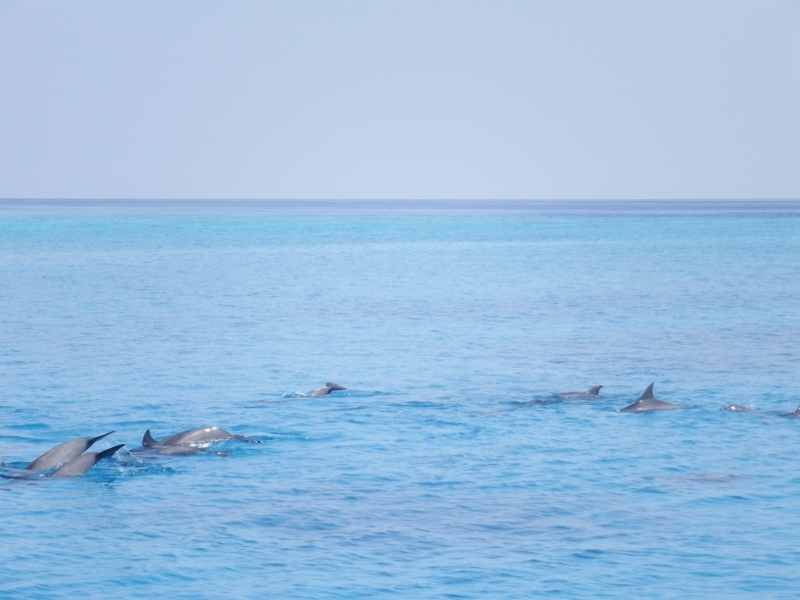 The next morning we were all going about our jobs when not one but three different pods of dolphins came dancing through the anchorage. I was out there watching for about an hour. So wonderful to see. 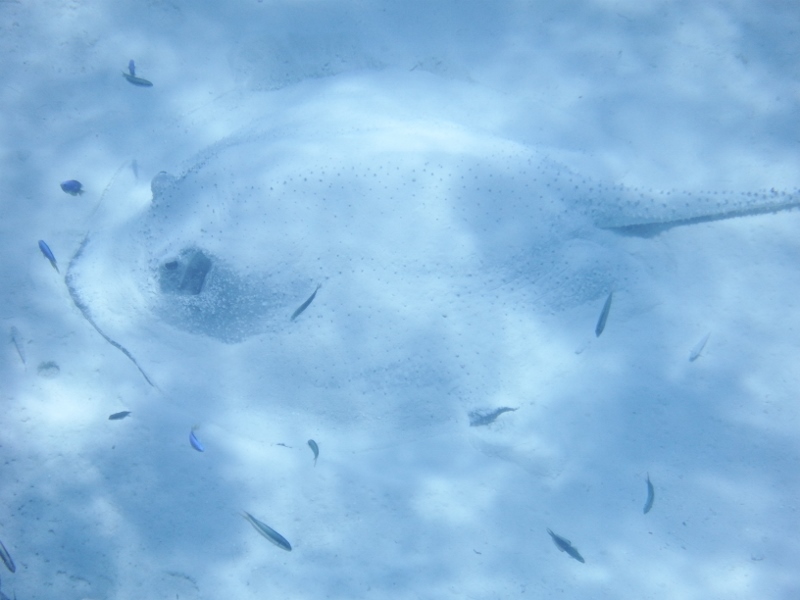 Later that afternoon we all went snorkeling and as well as the usual fish darting about we spotted this big sting ray laying on the seabed trying to pretend he wasn’t there. It must have been 2 metres nose to tip. It’s difficult to make out but it’s laying across the picture with his nose and eyes on the left and his tail to the right. 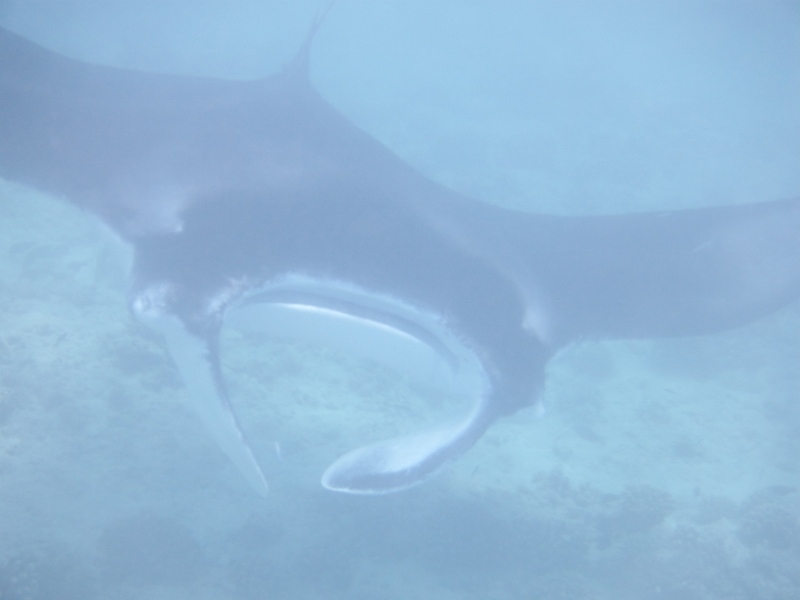 It didn’t seem to bother about us swimming around him. If anyone is following behind us the weather needs to very calm to stop here because there’s no protection. There was only room for one boat on this patch but there were some more sand patches a bit further south. 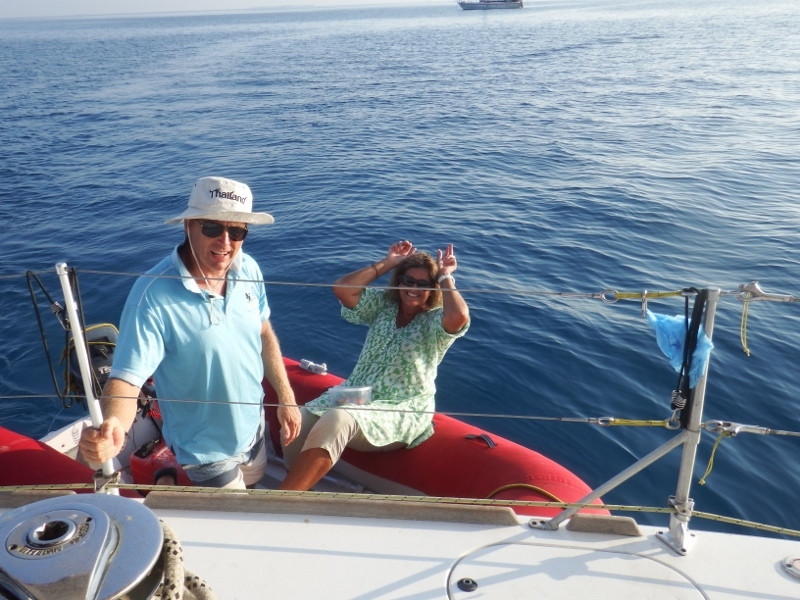 Once Bill was happy our anchor was holding Norsa came to tie onto us. The area is a well known ‘cleaning station’. 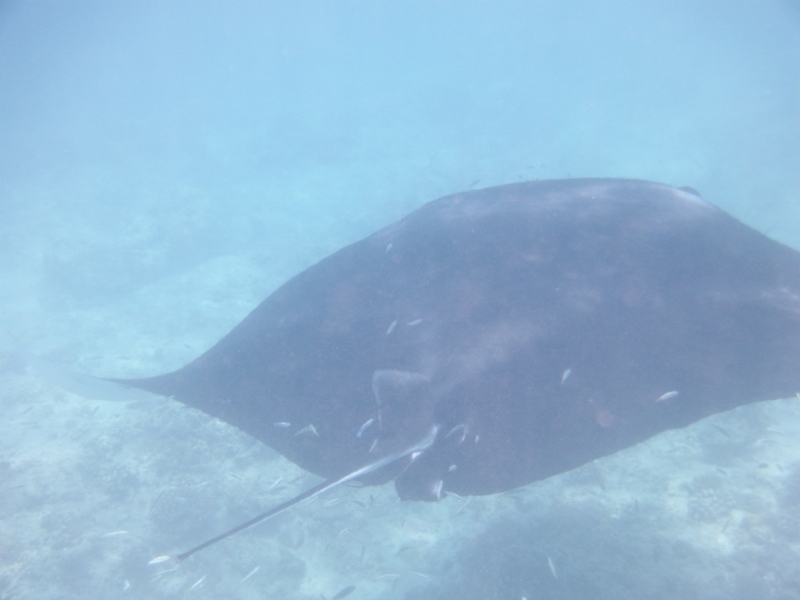 The mantas come into the shallow water so that the little carnivorous wrasse fish can eat the small parasites that live on the surface of the mantas. 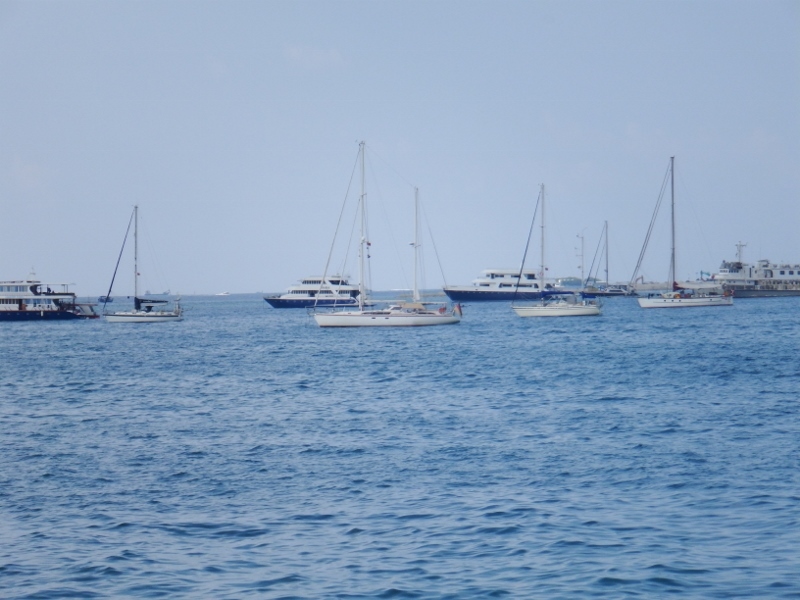 We took the dinghies north of our position and got in the water to drift snorkel back towards the boats. We were almost back to the boats when we saw our first one. 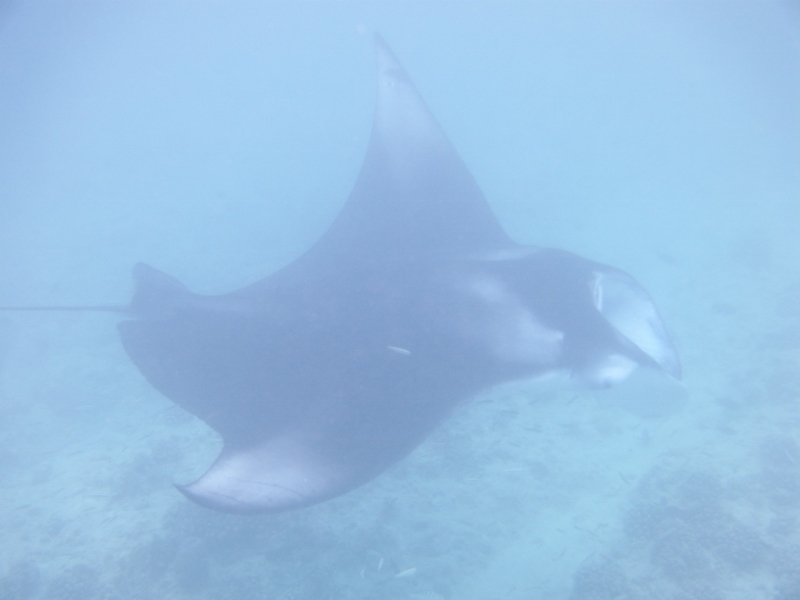 Among the most dramatic creatures in the ocean, mantas are cartilaginous fish – like flattened sharks. 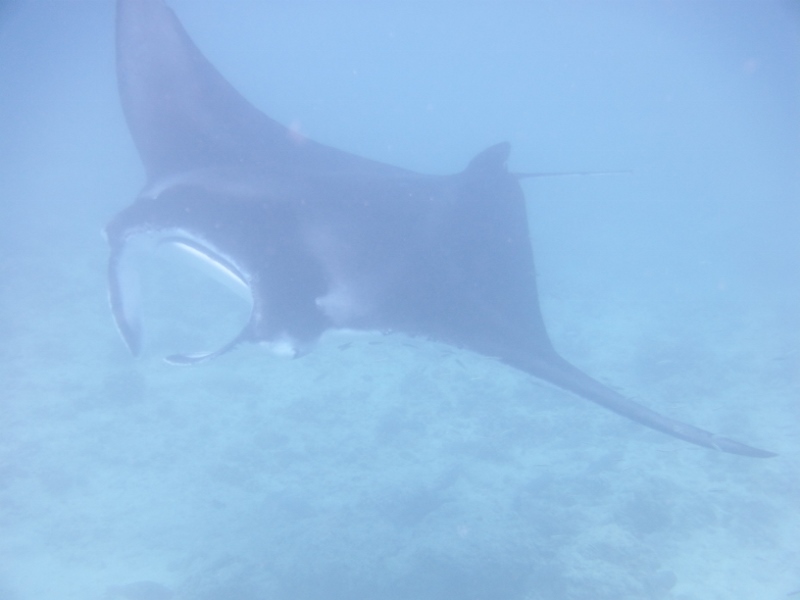 With a wingspan of about 4 metres these were quite formidable in the water. They are quite harmless although the barb on their tail is what you have to watch out for but you can’t get close enough for it to be a danger. 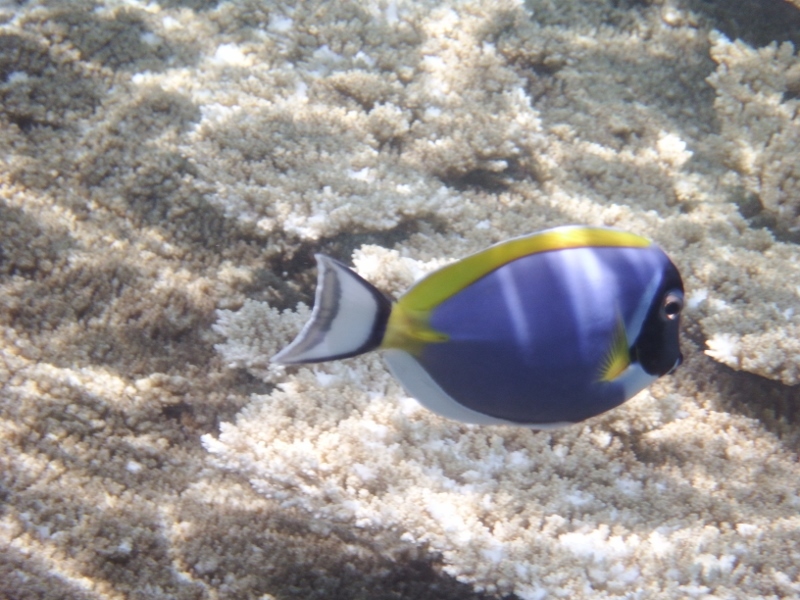 There were several of them swimming around us. 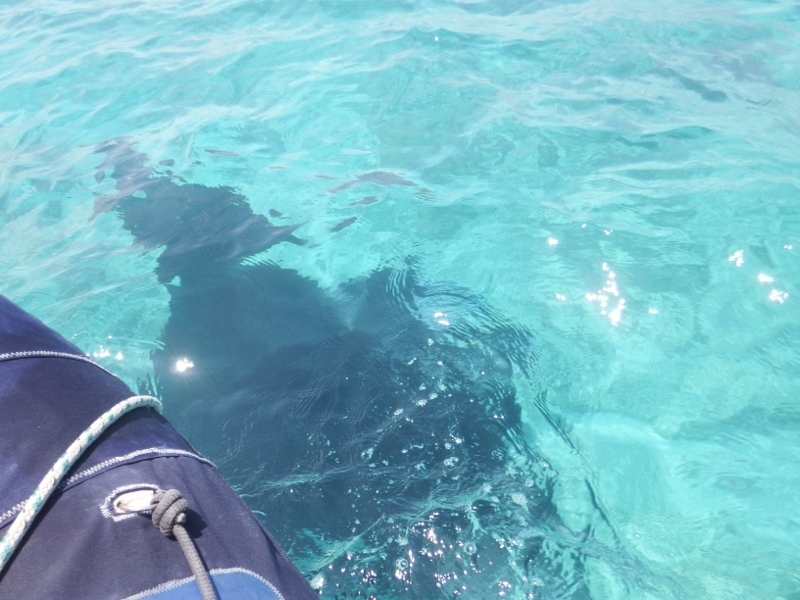 I managed to get several really good videos but Bill was worried they were getting too close so we got back in the dinghy and they continued to swim around us. We counted 4 altogether, several around us and one by Norsa’s dinghy. We spent about an hour watching them then headed back to the boats and left. there were a few bommies around but plenty of sand to anchor in. 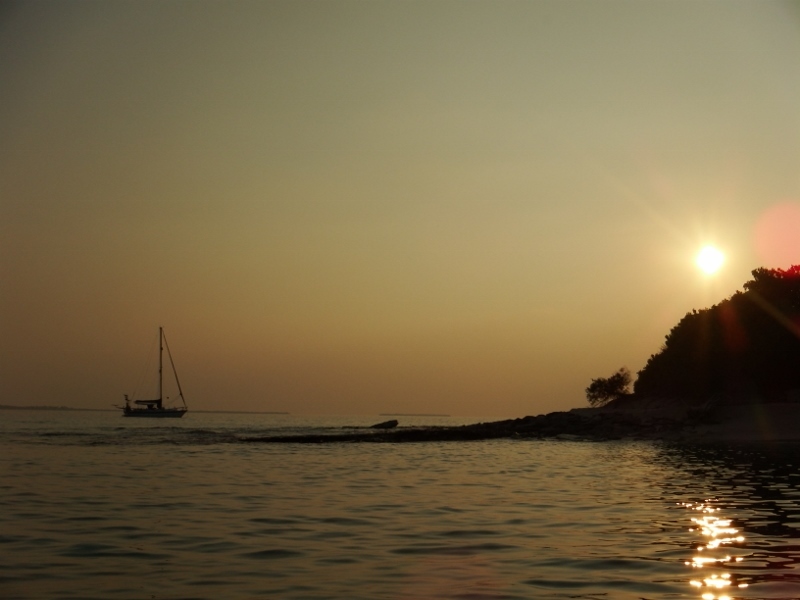 The little island is home to the local phone mast. 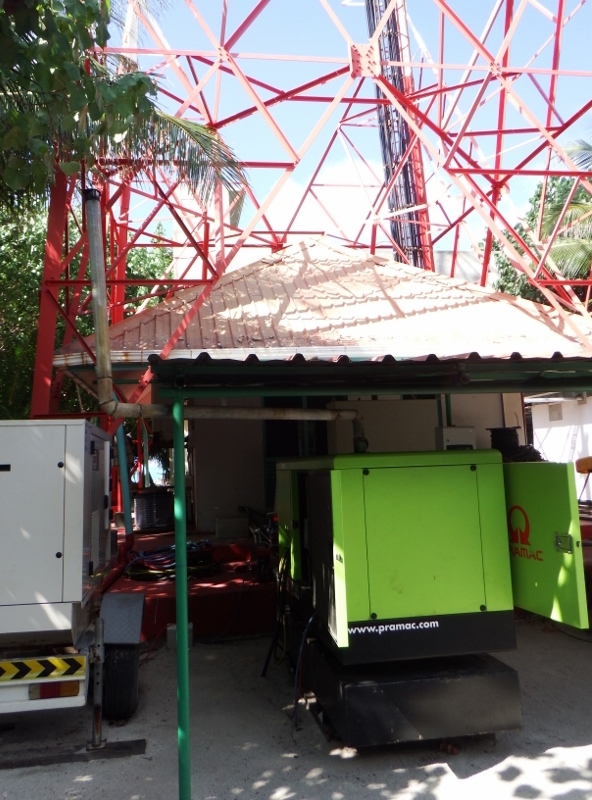 There are an assortment of generators surrounding it and about half a dozen men maintaining it. What an amazing place to work. 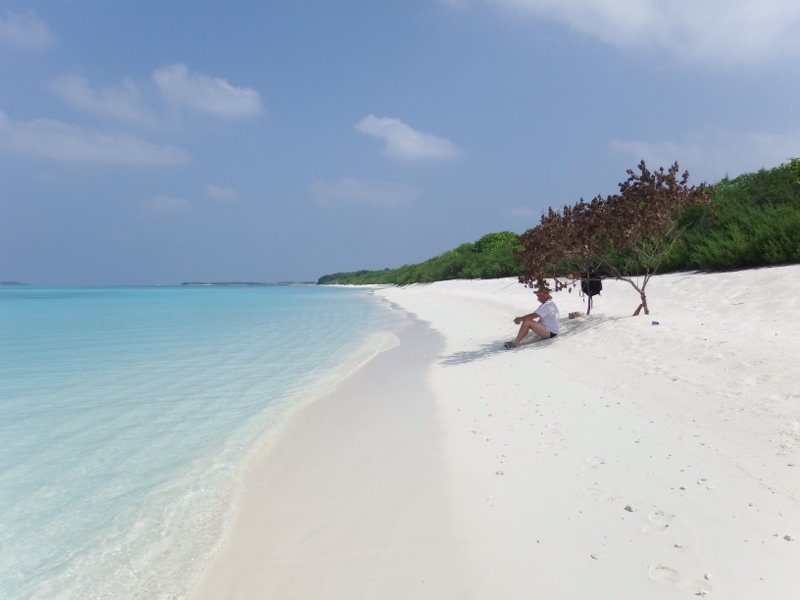 The island was tiny but beautiful with a scenic sandspit on the southern end. a great place to take a 360 degree panoramic shot. 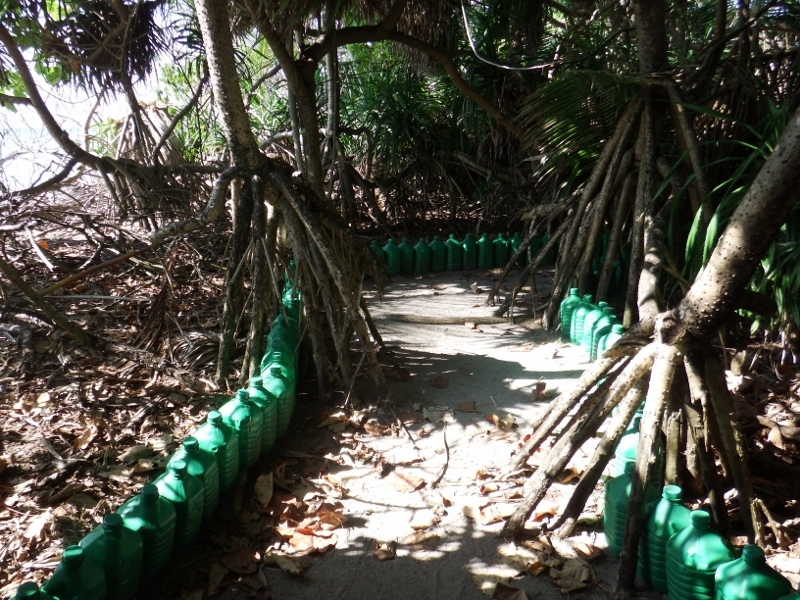 We walked back through the middle of the island along the little path the men have created out of plastic containers. They had rabbits and chickens running about although I’m not sure if they were pets or if they were going to eat them – everyone said it was the latter. Inspiration Lady had headed on into Male but Tintin, Norsa and Camomile stayed one more today. It was a lovely spot. 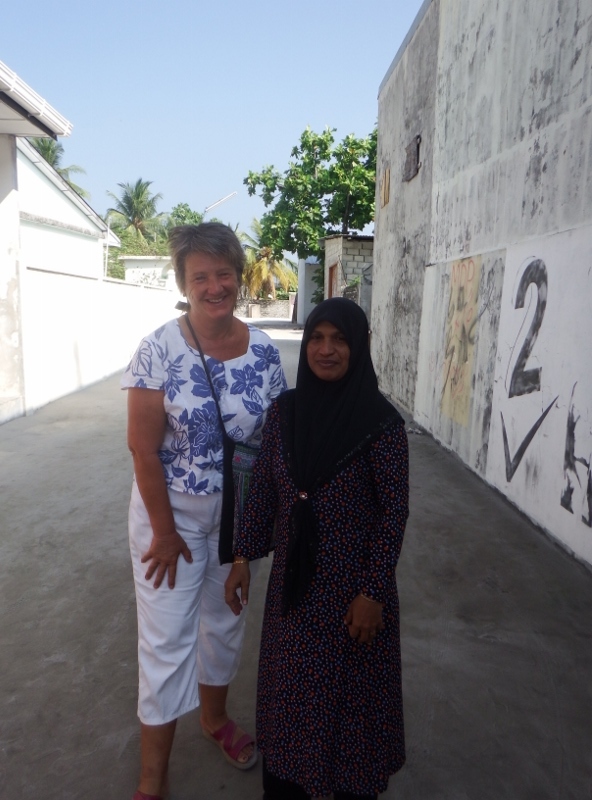 On the 31st March we arrived back in Male for more shopping, washing and general jobs. 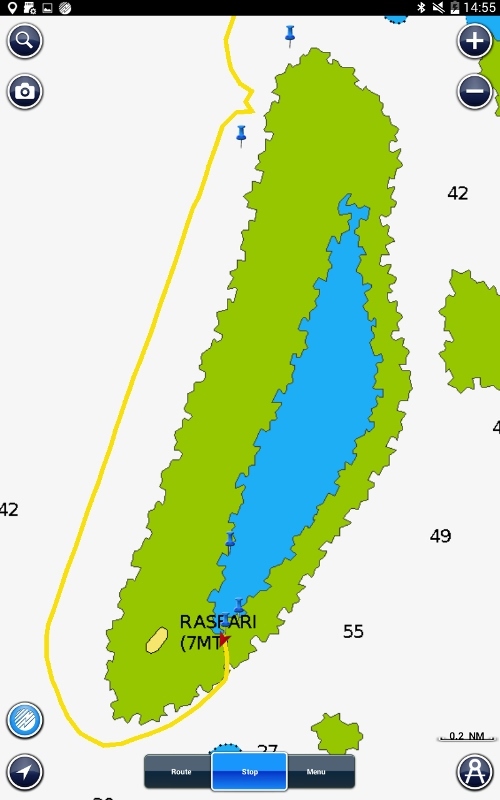 Tintin, camomile and Norsa off Rasfari island. 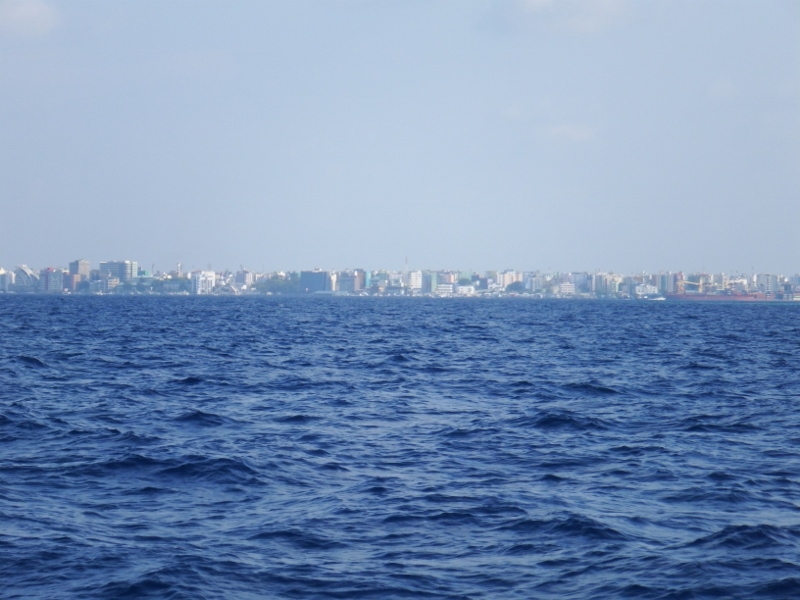 It took us 2 more days to get to Male. Would have liked to have gone ashore but we needed to press on. 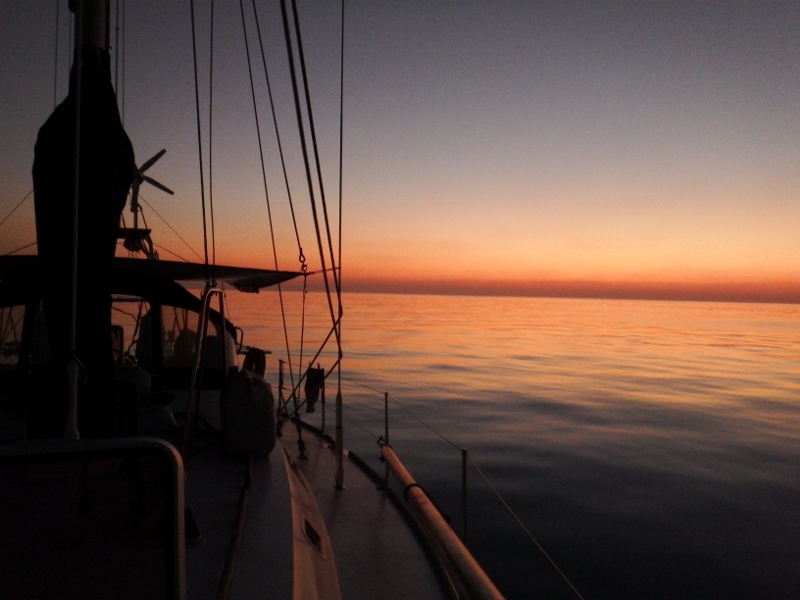 The next day we carefully motored back through the reef at 06.00. By 09.30 the wind started to blow so up went the sails in time for my SSB net and we sailed for the rest of the day. 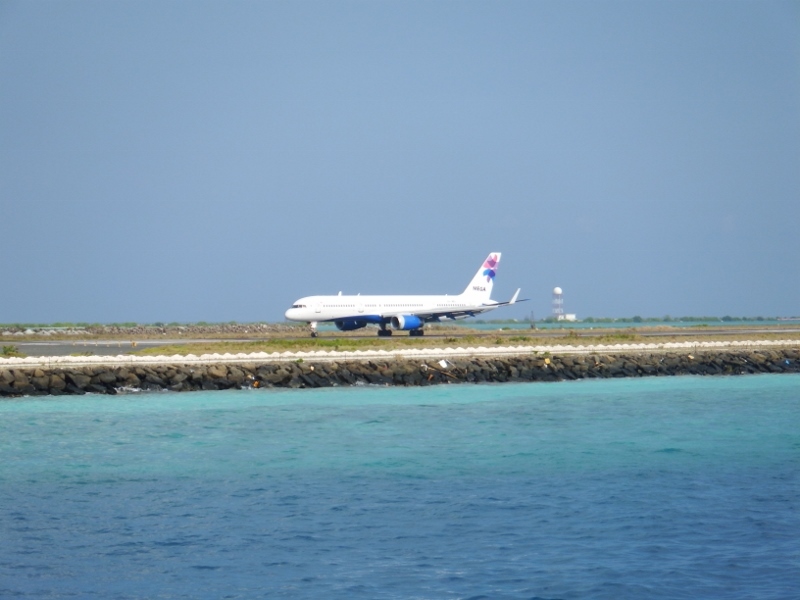 Norsa had reported they had arrived at Hulhumale but were having some serious electrical issues. 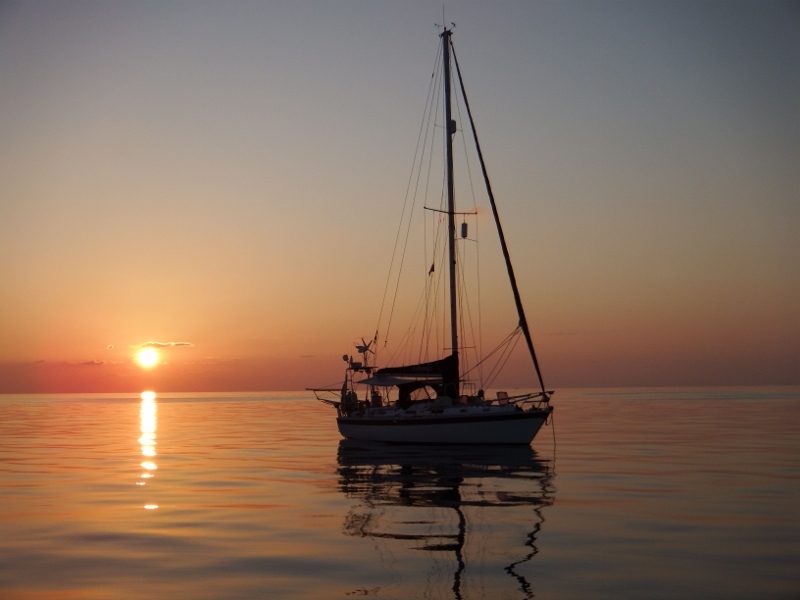 We had a wonderful sail and went further south than we had planned. 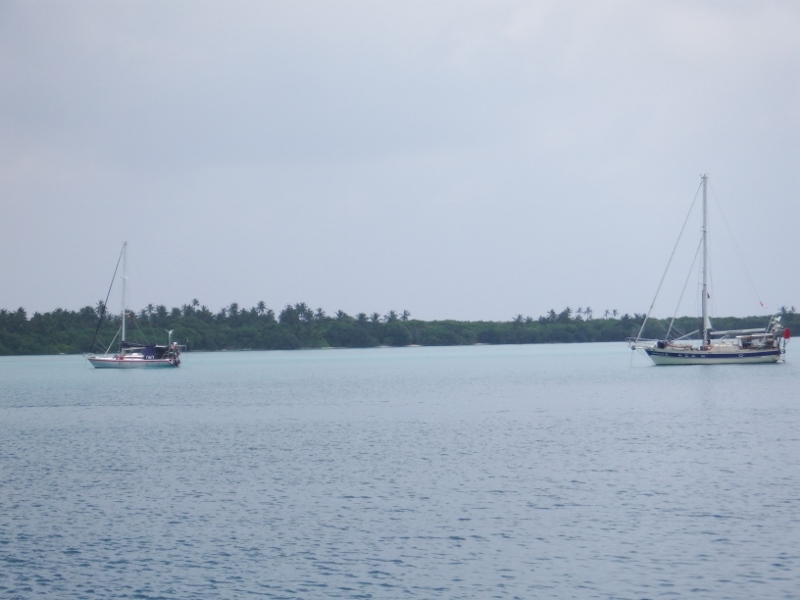 At 15.00 we took the sails down and put the engine on to motor across the bottom of North Male atoll. 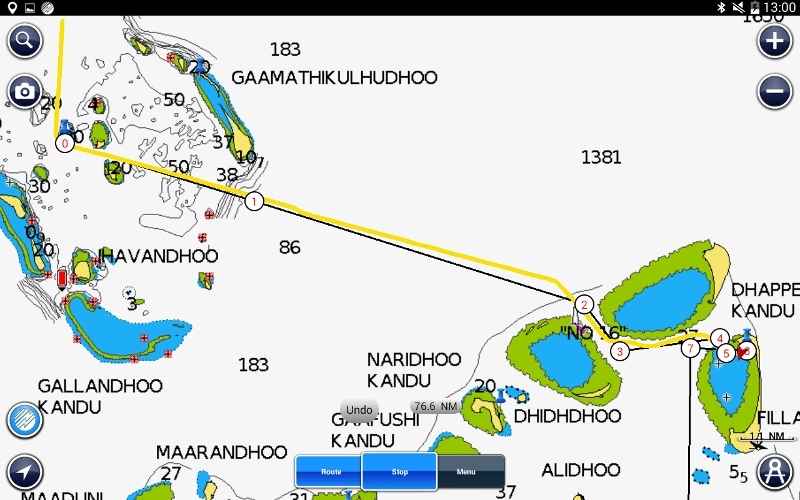 The plan was to stay in Male for 4 or 5 days then do a circuit of the atoll with Norsa and hopefully meet Tintin and Inspiration Lady on their way down. 073 32.17E on sand and about 10 metres. It was great to see Norman and Sara on Norsa again. The next day Bill and Norman managed to get Norsa sorted out and it wasn’t as bad as was first thought. 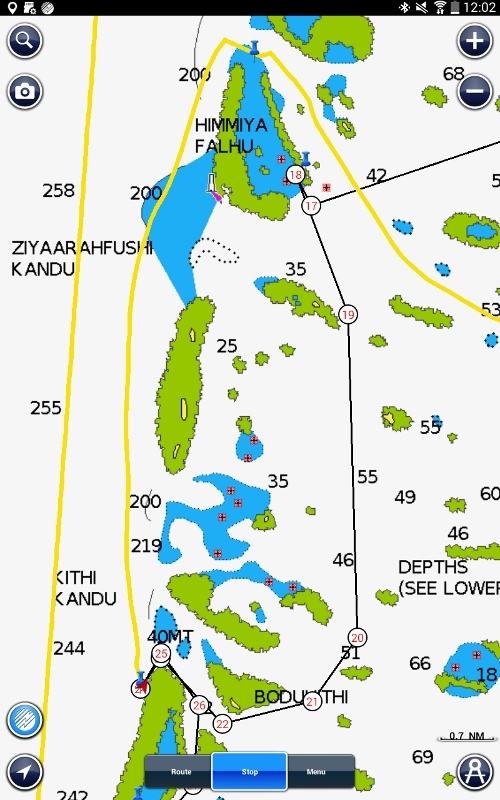 Looking at the screenshot of Hulhumale again there is a dinghy dock right next to where Camomile is anchored (red arrow) and 100 feet from that is the ferry into Male. 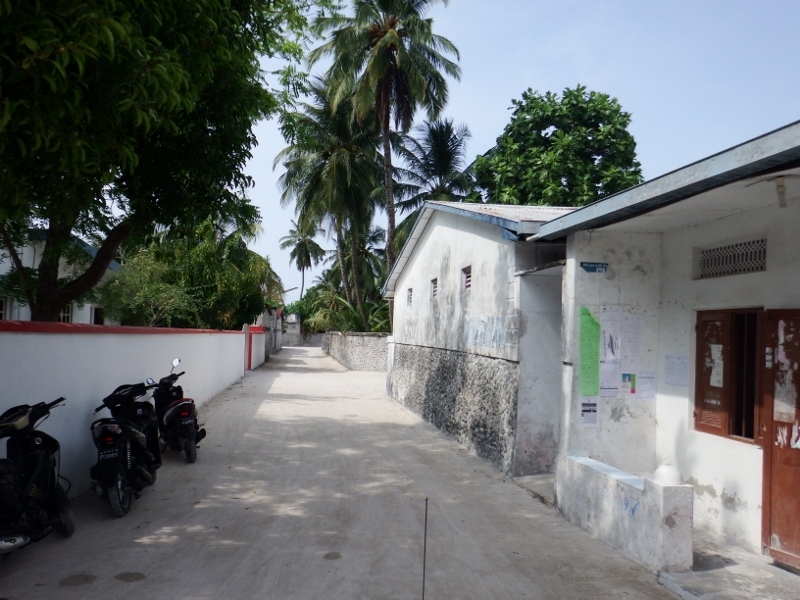 It cost about 50p and is the only way to get into Male. You can’t take your own dinghy, there isn’t anywhere safe to leave it. 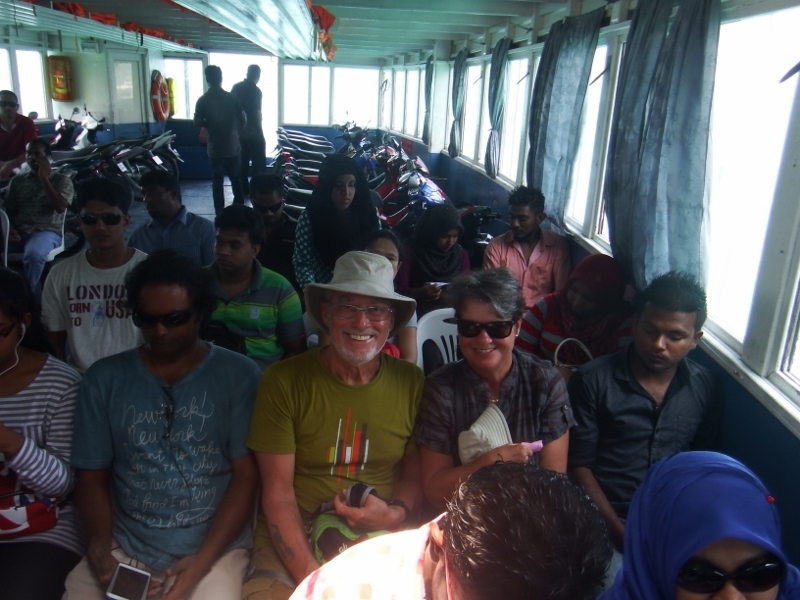 On 21st March the four of us headed for the ferry to take us into Male. It was a bit of a scramble for seats but we all got in and sat down. 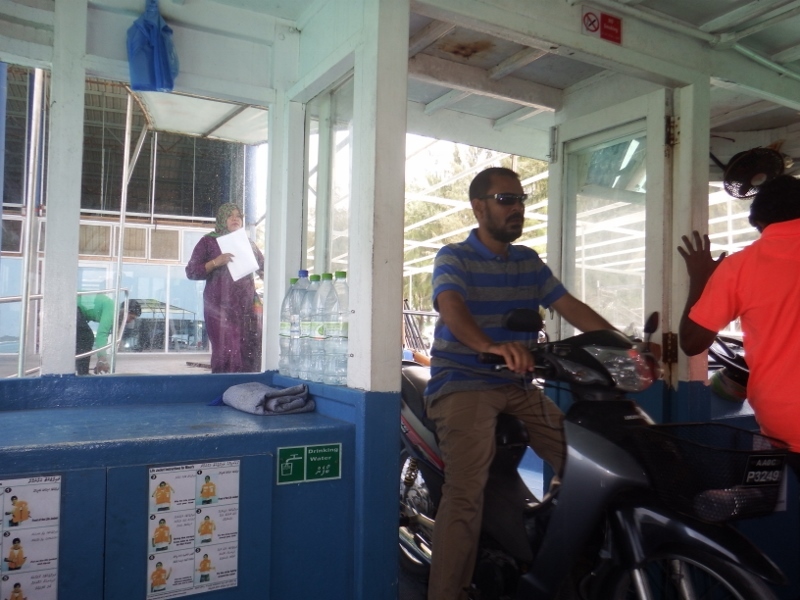 Note the motorbikes at the back of the ferry. No – there wasn’t a safety briefing! The chairs were just plastic garden chairs screwed to the floor. Once it was loaded it took about 20 minutes to make the passage. It was quite a nice way to arrive in the capital. There were some nice views of the city as we approached. Back in the 1920s the population was estimated as just 5000 but as tourism grew from the 1970s the growth emerged as a problem. 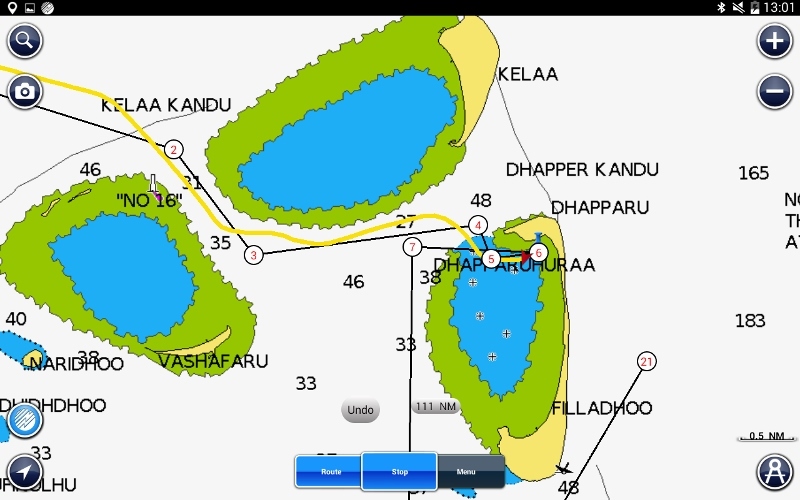 Male has been extended as far as it can with land reclamation so now Hulhumale is being developed to accommodate the overspill. The first job was to find a hardware store – can you believe that?! Although Norsa’s electrical problems were sorted out Norman wanted to get a spare engine start battery. We had been given various addresses and eventually we found one. 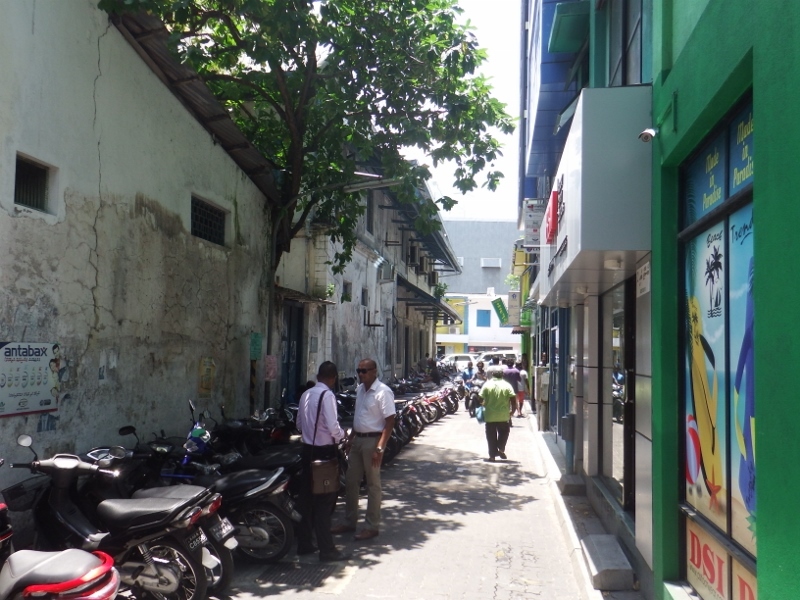 There’s a surprising amount available in Male. 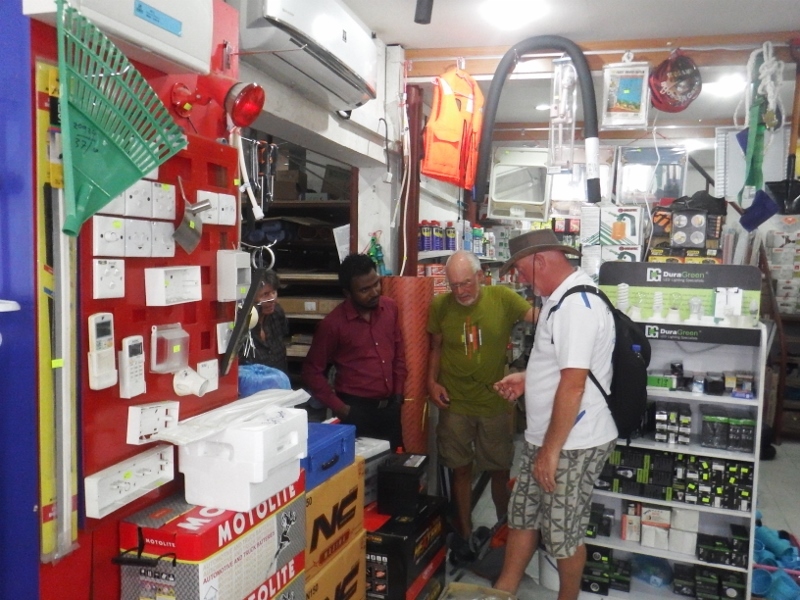 There were lots of hardware stores, a couple of chandleries and several really good supermarkets. The fantasy supermarket sold lots of western products although it was a bit expensive. We also got the dive tanks serviced and filled during our stay. This photo shows the contrast between some of the buildings. 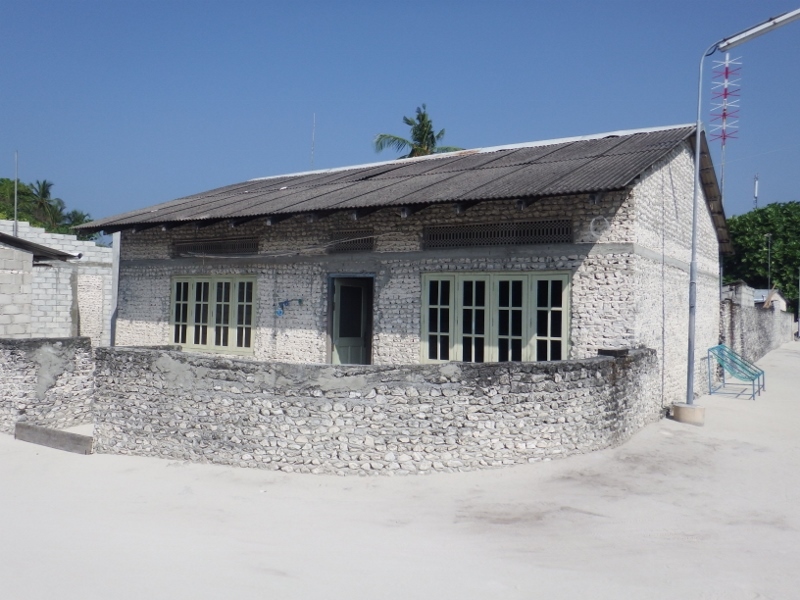 A lot of Male has been rebuilt or in the process of it but there are still some old properties around. Motorbikes, motorbikes, motorbikes everywhere! This line of them seemed to go on for ever. They are a real problem but just imagine if the owners all owned cars. 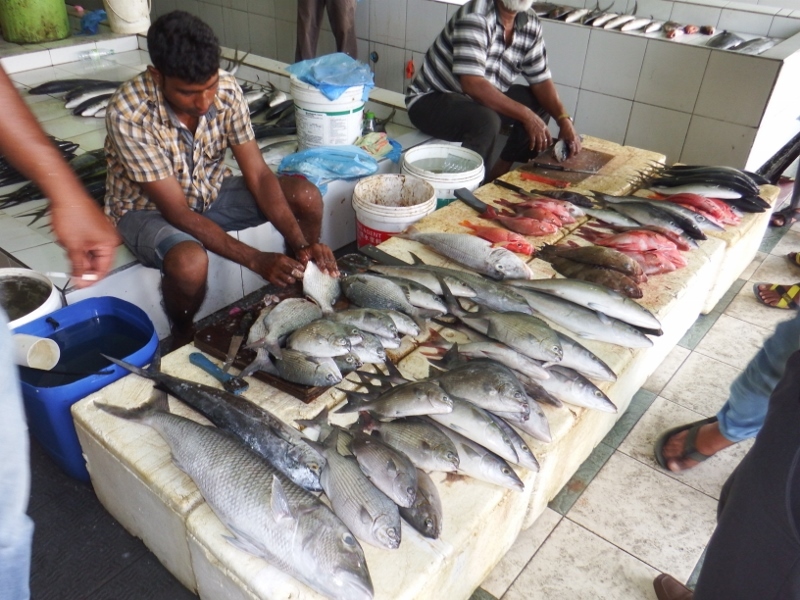 There were several good markets on the north side of Male. 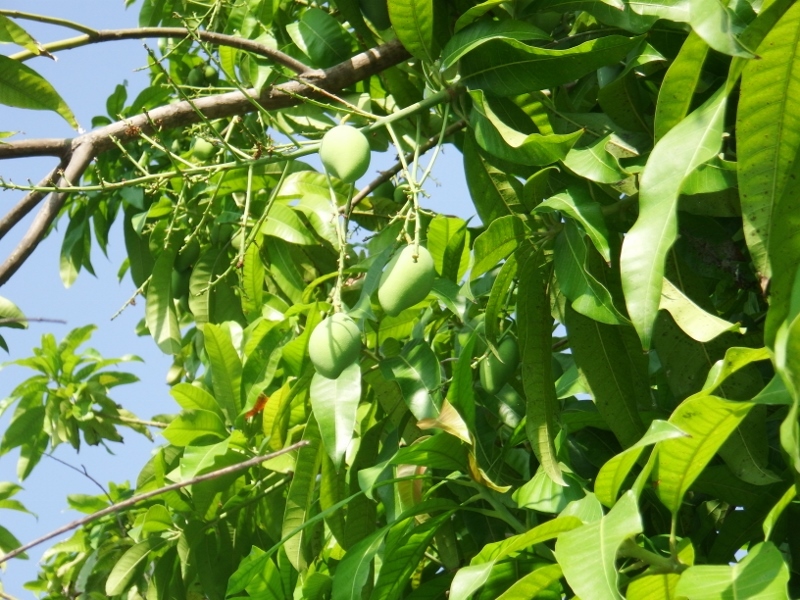 A fruit and veg one…. Norman and Sara inspecting the veg. …..and a huge fish market next door. The local boats backed onto the quay in front of the market and unloaded their wares straight onto the stalls. Fishing and the fish market is a man’s world here, woman don’t usually venture into these areas. Very wise the sight of all the entrails was a bit disconcerting. Surprisingly it didn’t smell. I don’t think you would be able to buy fresher fish. 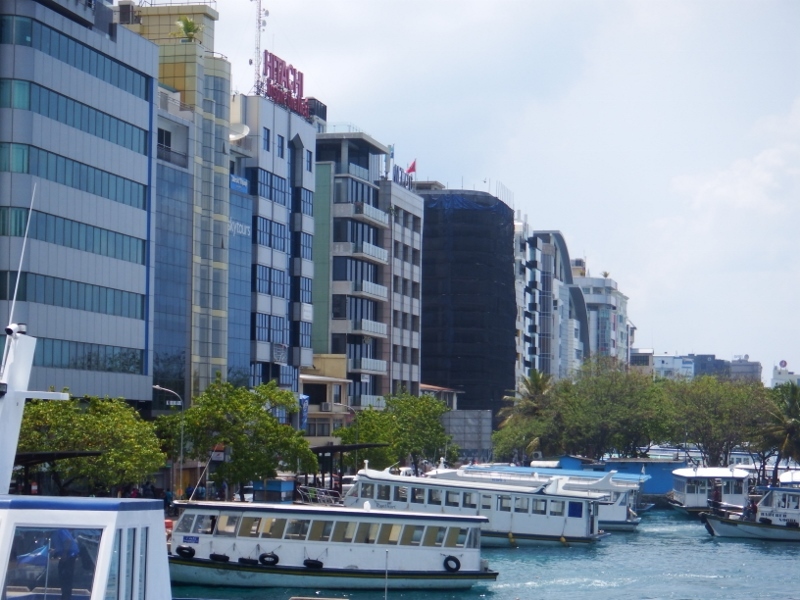 Male has been referred to as ‘The Venice of the South’. I’m not sure I would go that far but it’s an interesting city. This is the great view of the boats in the harbour from the Seahouse, a very nice cafe above the ferry terminal. 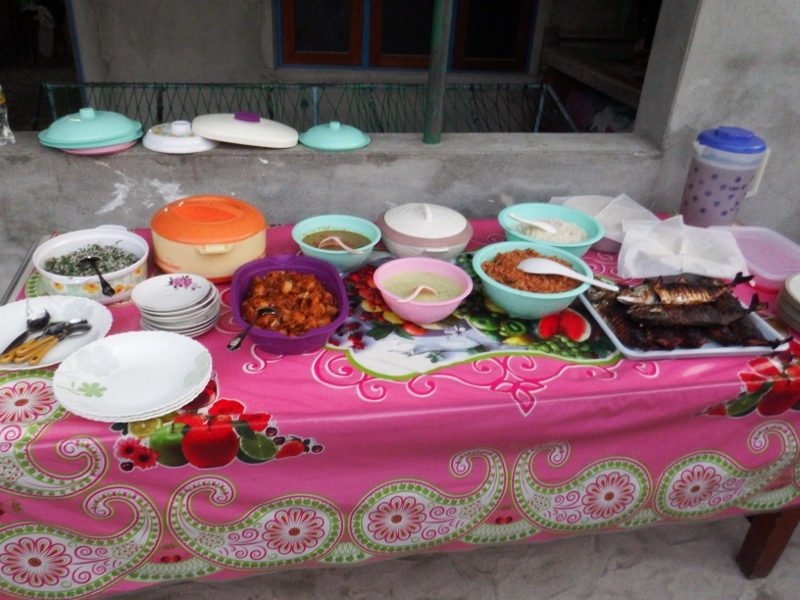 They do a very nice and reasonable buffet lunch Sunday to Thursday and reasonable evening meals. It’s not cordon bleu but for good value local food you can’t go wrong. It doesn’t have windows so it can get a bit breezy but as far as I was concerned that was a plus. 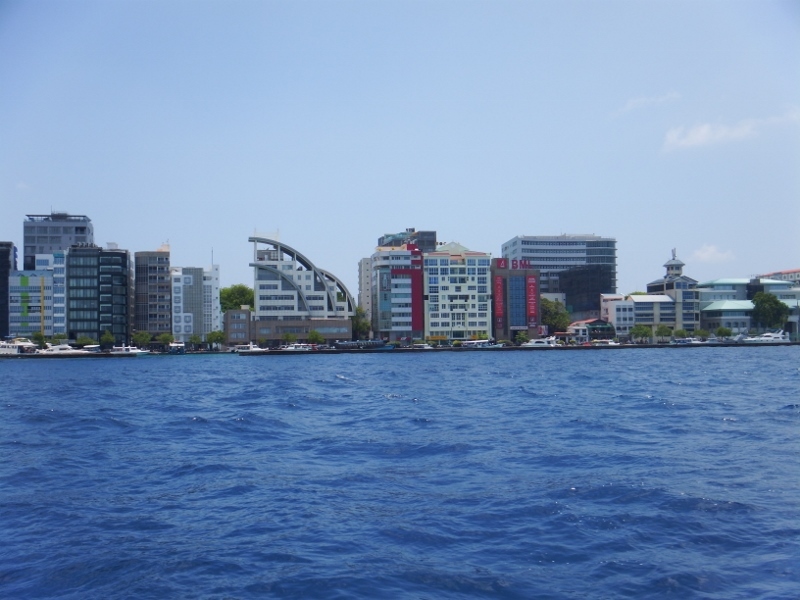 After our busy days shopping we took the ferry back to Hulhumale. 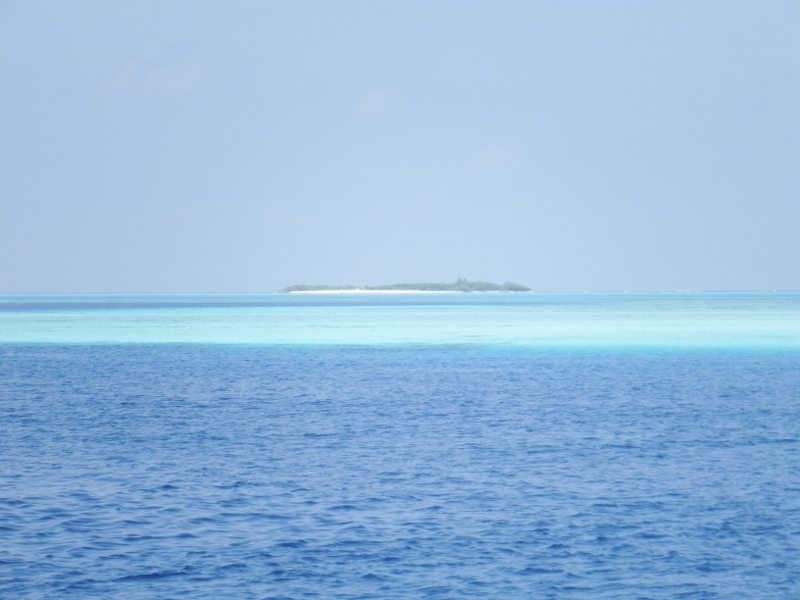 The island/reef in between Male and Hulhumale to home to the international airport. Must be a great place to land if a little nerve wracking because the runway is literally right on the edge of the reef. We watched the planes coming and going from the ferry. Back in the anchorage the boats were waiting for us. 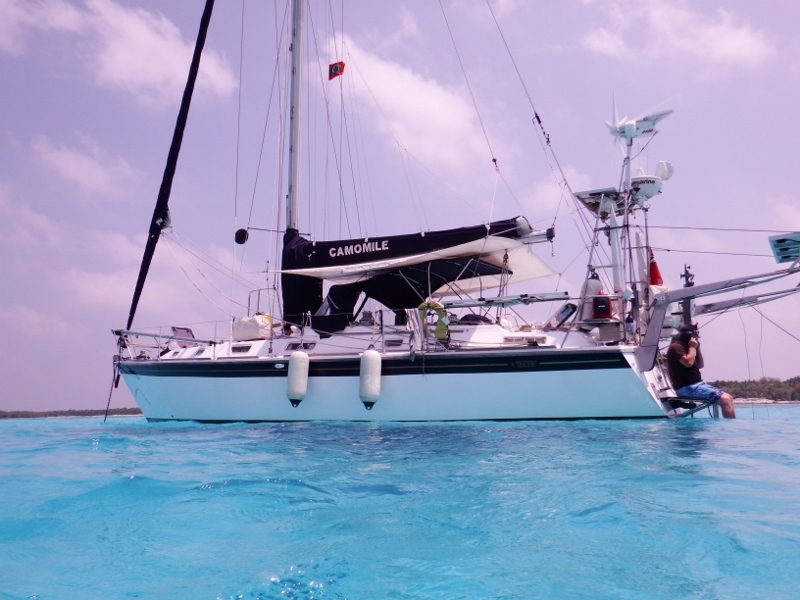 Camomile, Tintin and Inspiration Lady left Kulhuduffushi harbour in the Thiladhunmathee atoll on 14th March. Once into the deep water we put the genny out and sailed south. Makes a change from motoring. 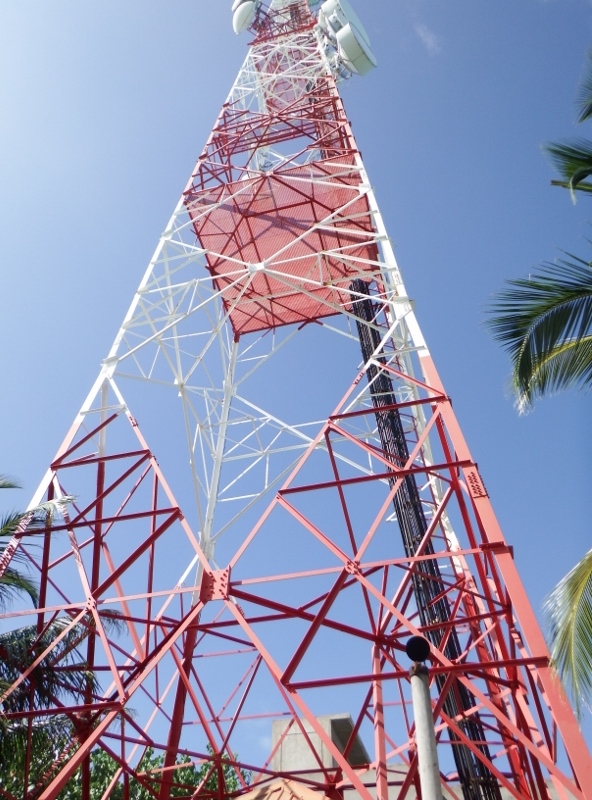 I run a net on the SSB radio on 4036 (the old BWR 4A) every morning at 05.00 utc or 10.00 Maldives time and I can hear vessels calling in better with the engine off. We managed to chat to Sara on Norsa this morning. It was good to hear her voice. 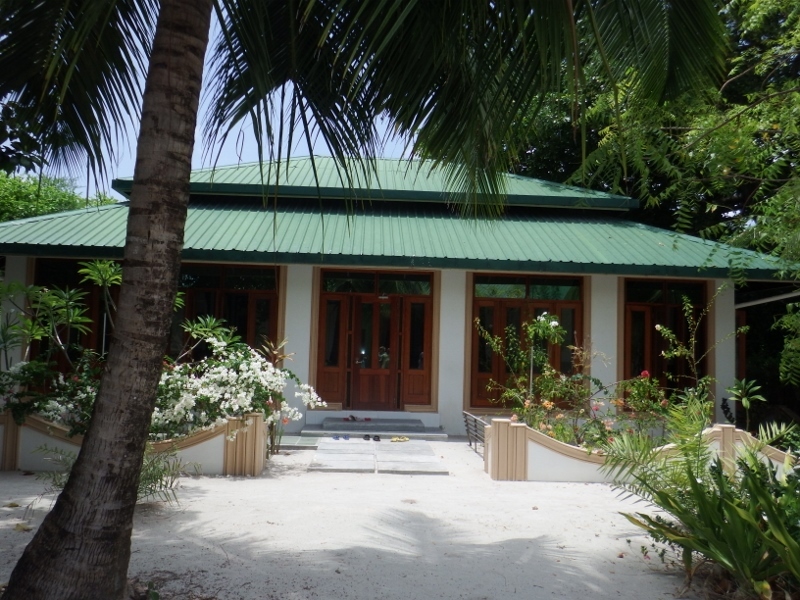 At 13.00 Camomile arrived at Farukolhu in the Miladhunmadulu atoll. 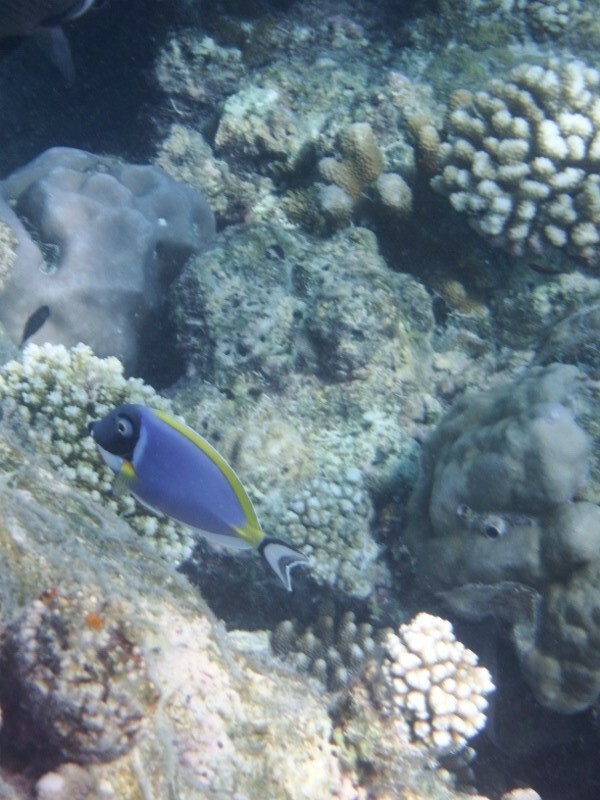 I had looked at it on google earth and we had waypoints for a passage across the reef. 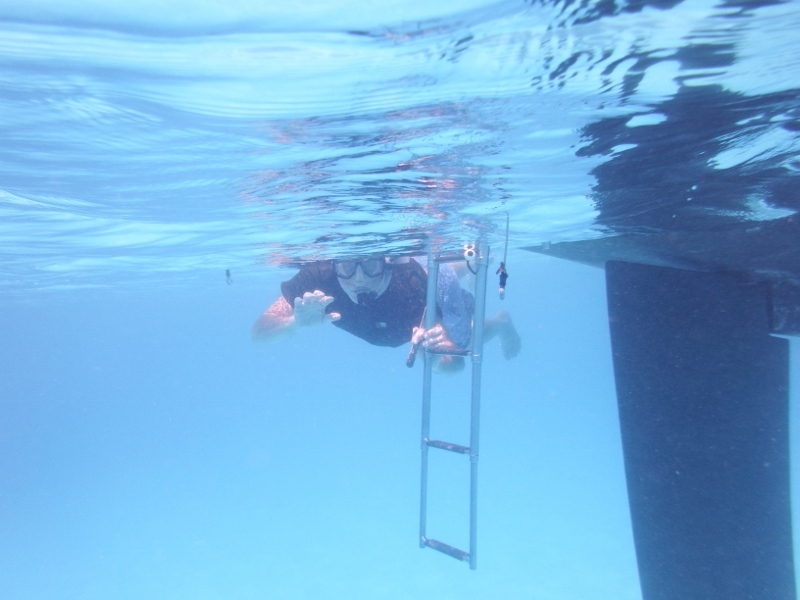 Bill started to manually steer us in while I stood on the bow watching the coral getting closer under the boat. We were down to 2.8 metres of water with .8 under the keel in a half metre swell when Bill decided it was too dangerous. We could see clear water up ahead and the lagoon looked superb but it wasn’t worth putting Camomile on the rocks for it so Bill carefully reversed out. There might have been a way in a bit further north but the swell was more there so the entrance was aborted. 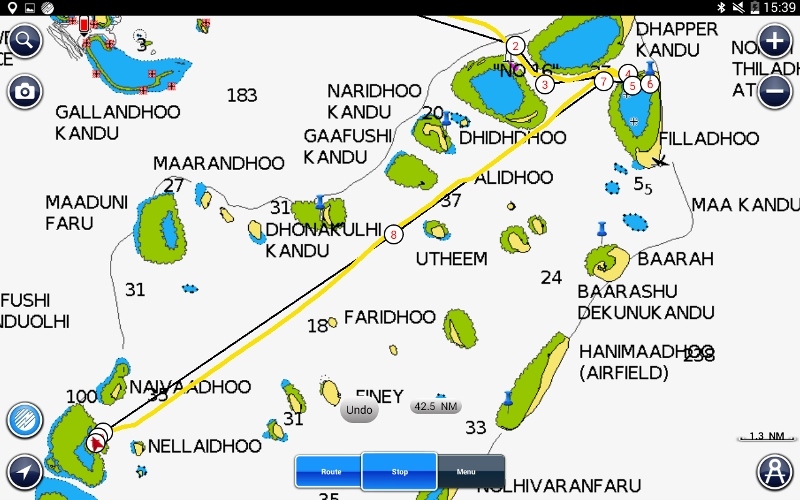 We continued south to Dholhiyadhoo island. 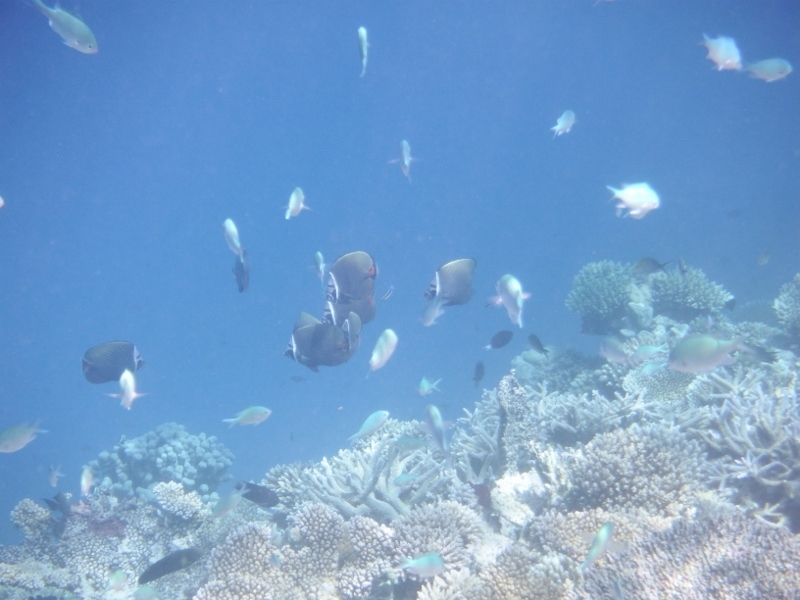 There was an extensive reef to the south which we skirted round and then headed north when we could see clear water. 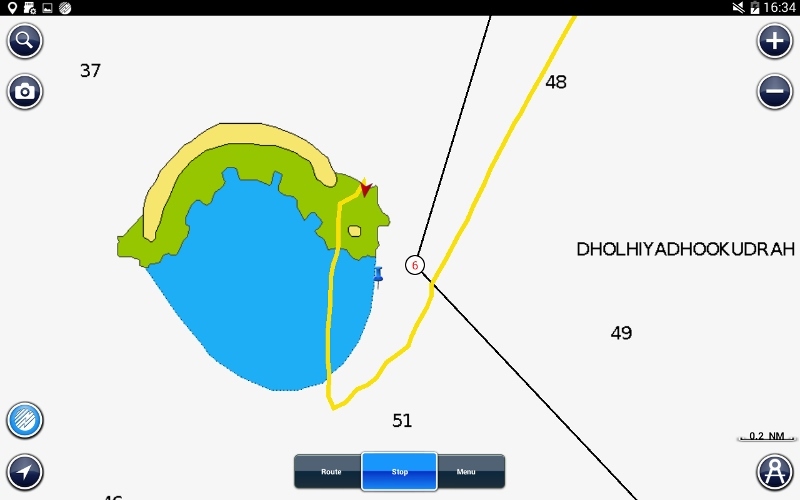 You can see by this screenshot that the chart is out because we were anchored south of the island in front of the derelict resort and the screenshot puts us out to the east. You need mark one eyeball to navigate here. 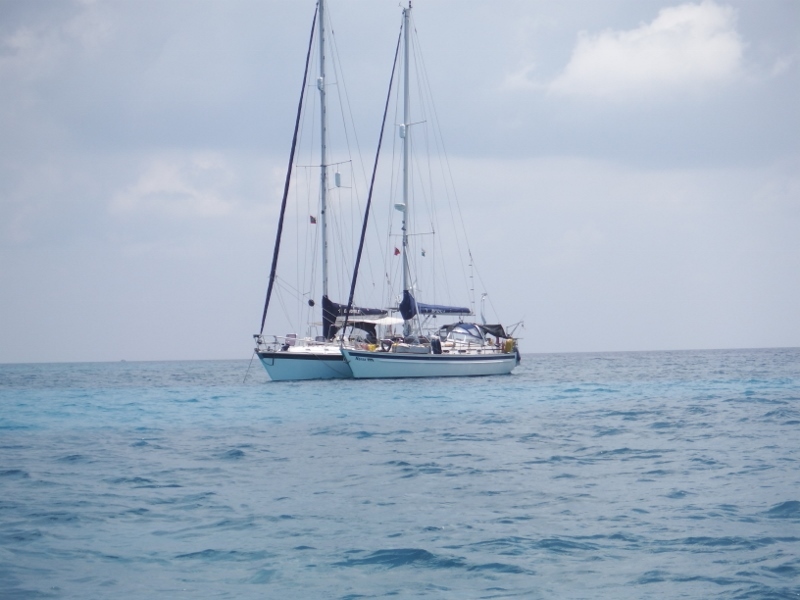 Tintin were in first so they were able to let us know on the vhf what the anchorage was like. 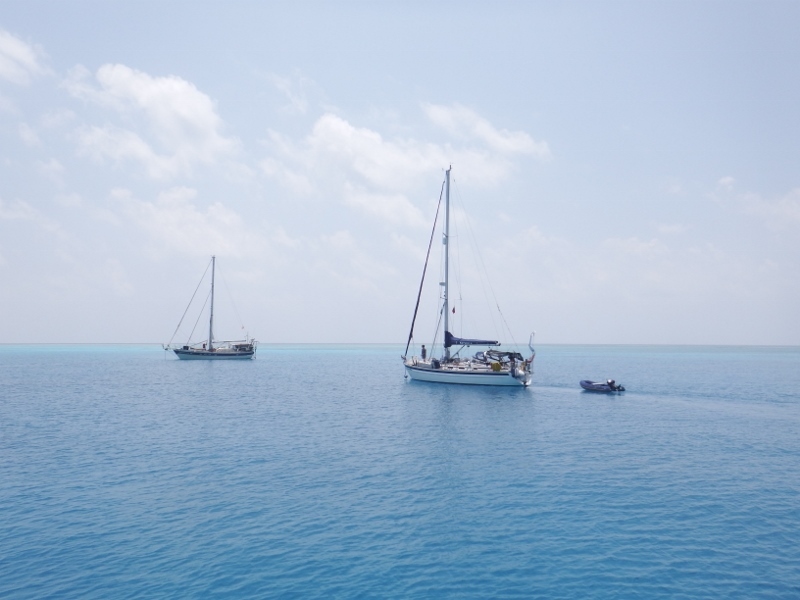 Inspiration Lady and Camomile crossed the reef together and anchored either side of Tintin. Then we had a problem. Bill had dropped the anchor but when he tried to reverse the engine to get the anchor to set he had no control of the steering. At first he thought the gearbox had broken! Bill looked in the engine bay and said the gearbox looked ok and it must be further up. When he opened the side of the binnacle where the throttle and gear cables are this is what he found. The tube on the right is supposed to be straight. It was the gear cable. As this has happened before we carry a spare so Bill set about fixing it. 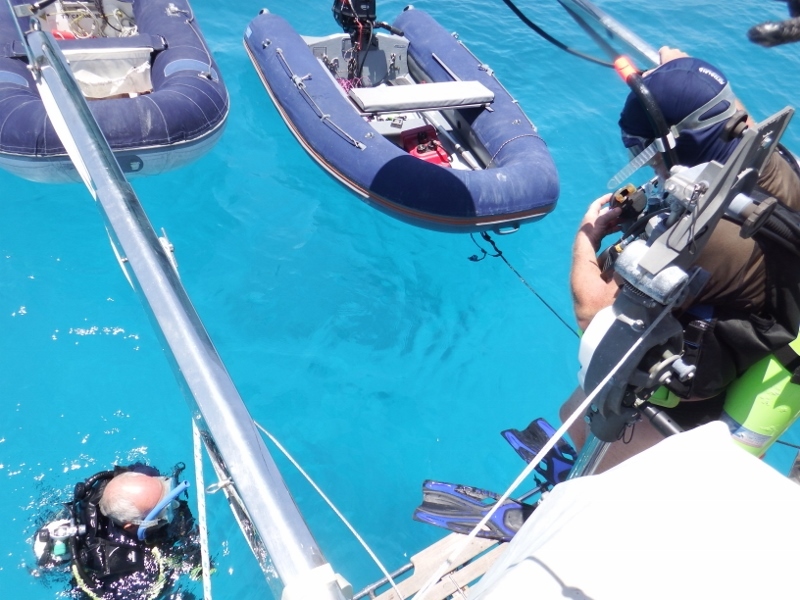 At that moment we had no control of the boat and if the wind picked up overnight or the anchor dragged onto the reef there would be nothing we could do so it needed to be fixed straight away. Bill and I spent the rest of the afternoon and into the evening trying to route the cable through into the gear box below. Unfortunately as the old one was broken it was really difficult to thread it through. I was trying to poke it through the hole and Bill was trying to catch it coming through into the engine bay. Sounds easy but as you need to be a deformed midget to do anything inside the engine bay it wasn’t. The cable kept going behind the fuel tank and as usual a 0ne hour job became a day and a night job but we managed it eventually. While Bill was grovelling around the engine he noticed another breakage. This should be around the stern tube and is the only thing stopping the boat flooding and sinking. 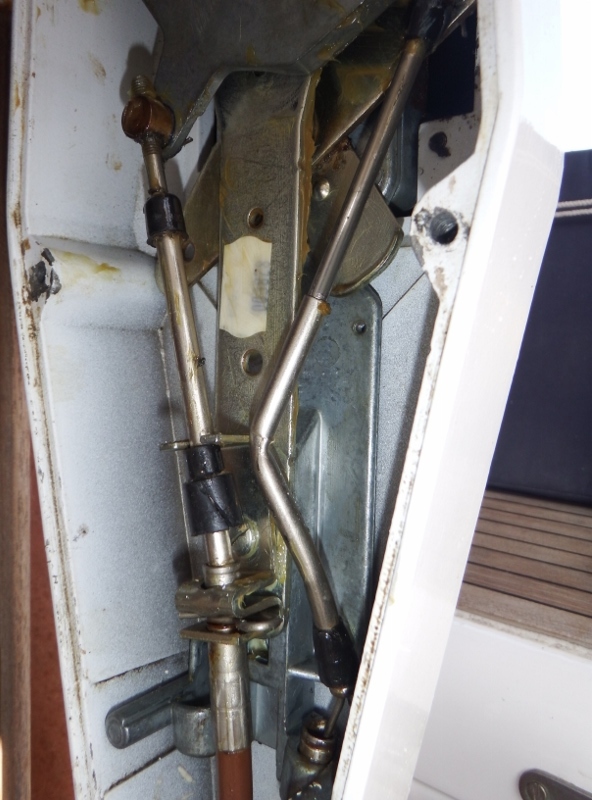 Fortunately Bill always has 2 jubilee clips on all the external hoses so we weren’t in danger of sinking but it will need to go on the shopping list for Male. Having spent a day and a half sorting the boat we decided to go for a walk. 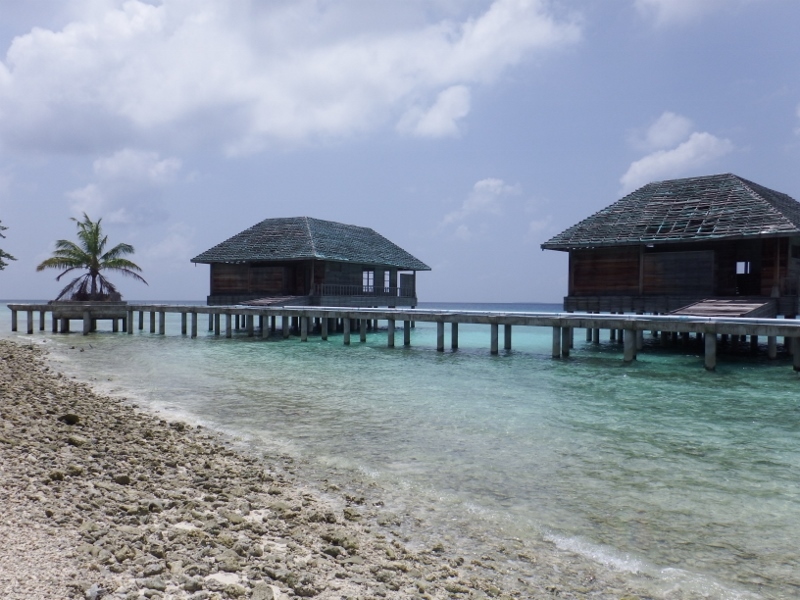 The beautiful crescent island of Dholhiyadhoo has a half finished resort on it which was probably started about 6 or 7 years ago looking at the timbers on some of the buildings and the dilapidation in general. 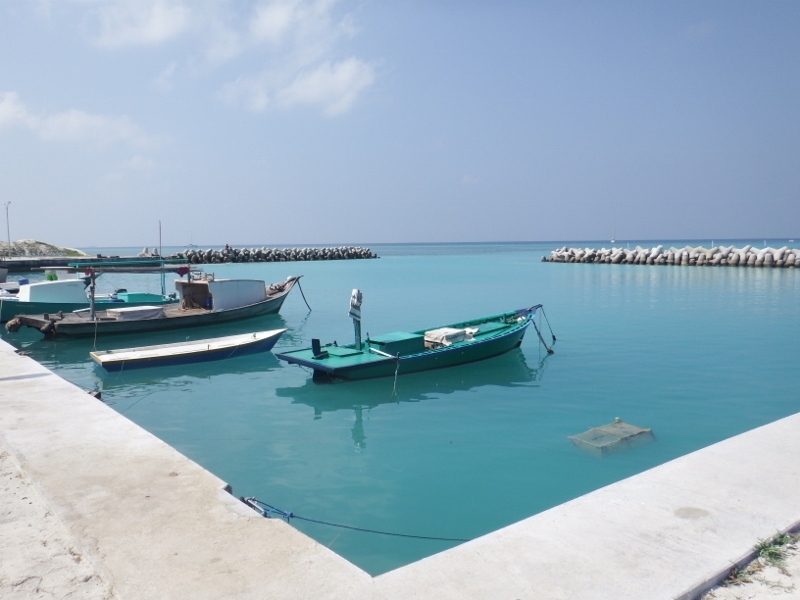 Tintin and Camomile took their dinghies to the jetty on the west side of the island. This is where the staff quarters are built and it looked fairly finished. The little mosque taking pride of place. 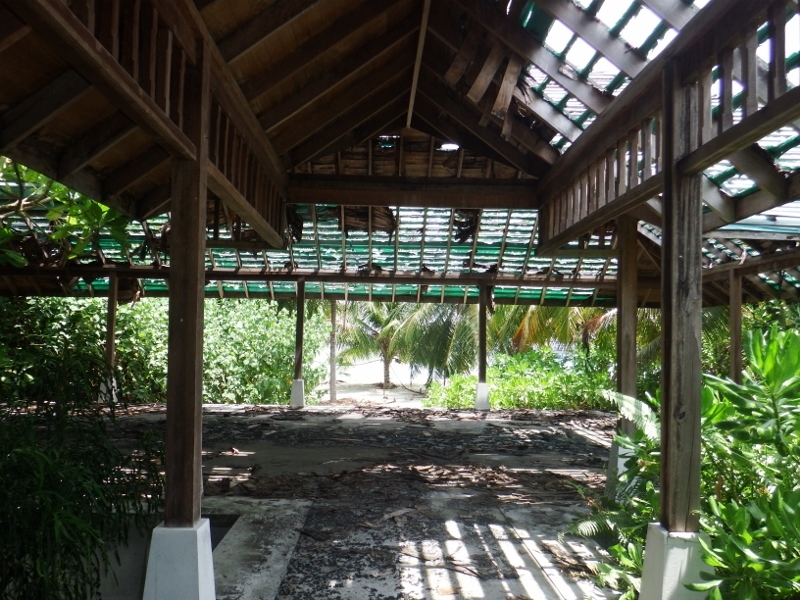 As we walked further into the resort it was obvious it would never open. 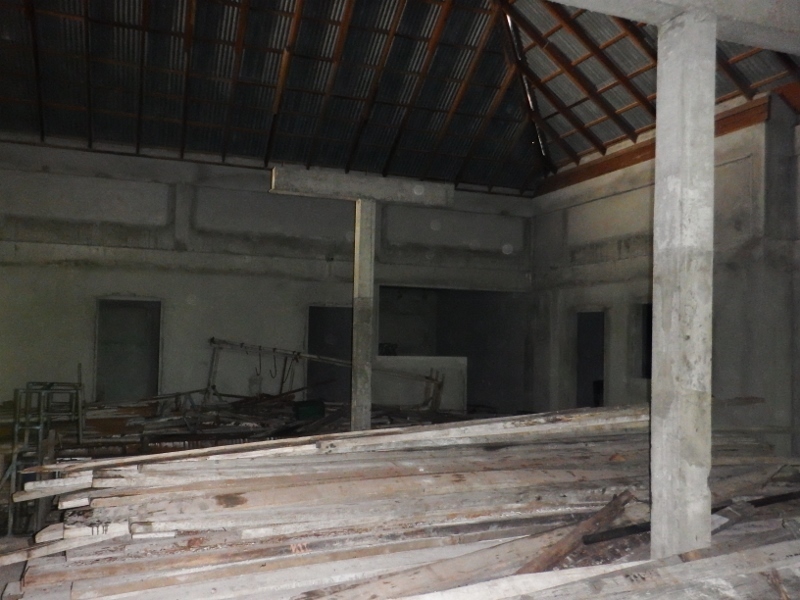 The buildings were so derelict that a new owner would need to take them to ground level before they could rebuild. The restaurant had gaping holes in the roof. The kitchen, the only building with a metal roof, was just being used for storage. 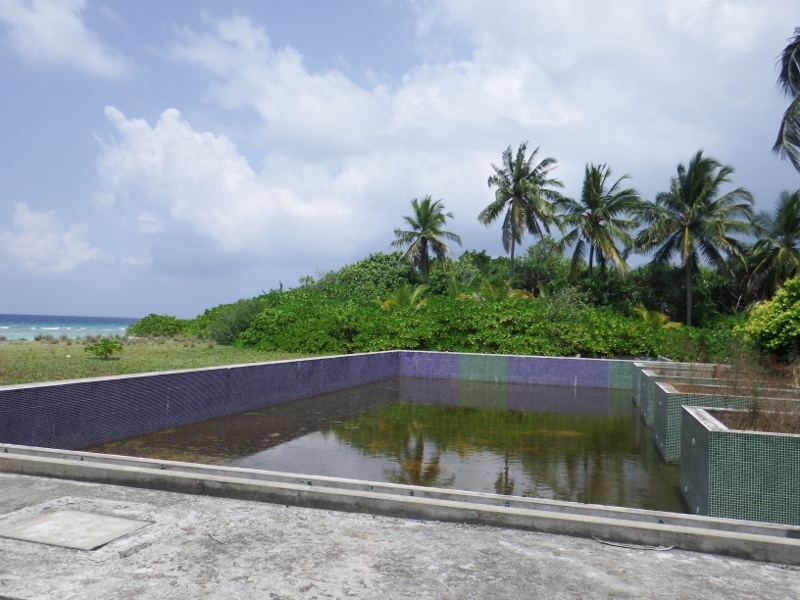 Even though it looked like everyone was going to have their own pool there was still a big pool that faced north which had a number of buildings surrounding it that were probably intended to be a bar and spa. 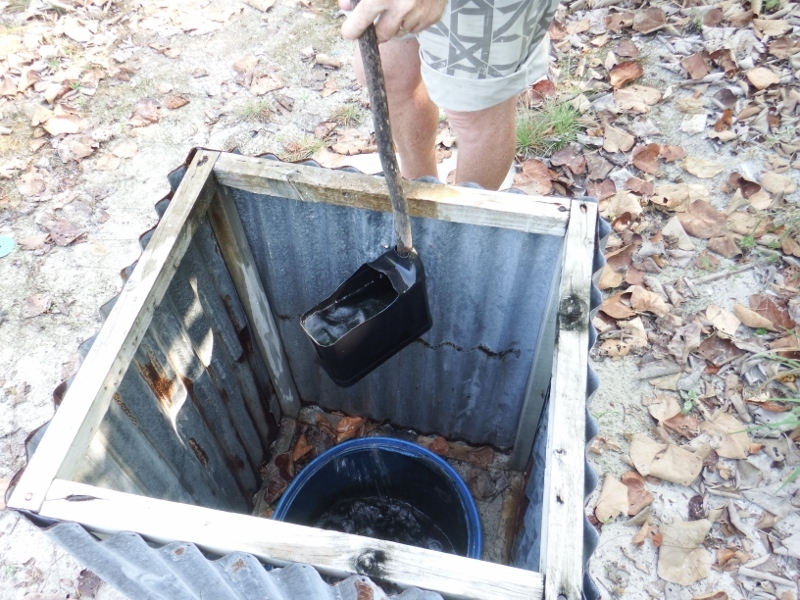 The rainwater that had collected in it was full of mosquitoes. The accommodation built on the north side of the island was based on land and not overwater so it was possible to look inside them. They were all derelict except villa No 2. It had been finished to presumably show potential buyers what they could look like. 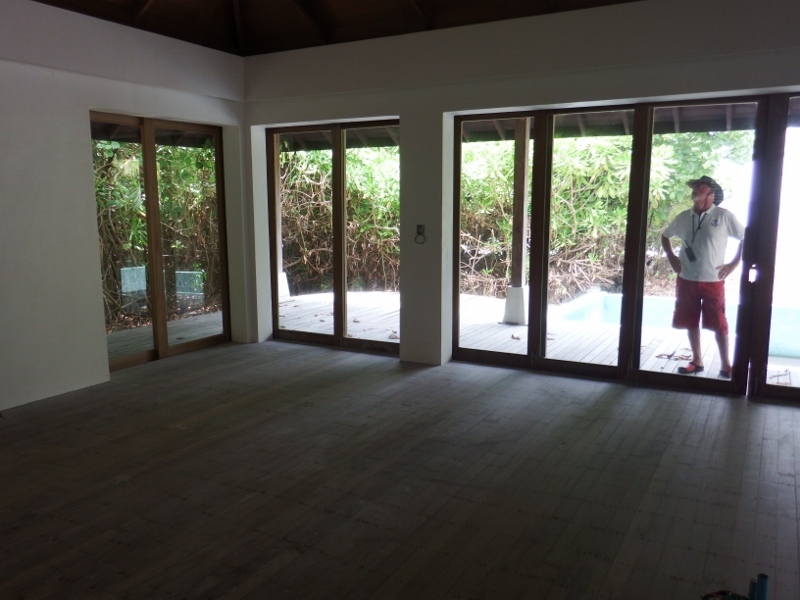 It seemed futile considering the state of the rest of the resort but it was an indication of how the finished buildings could look like. 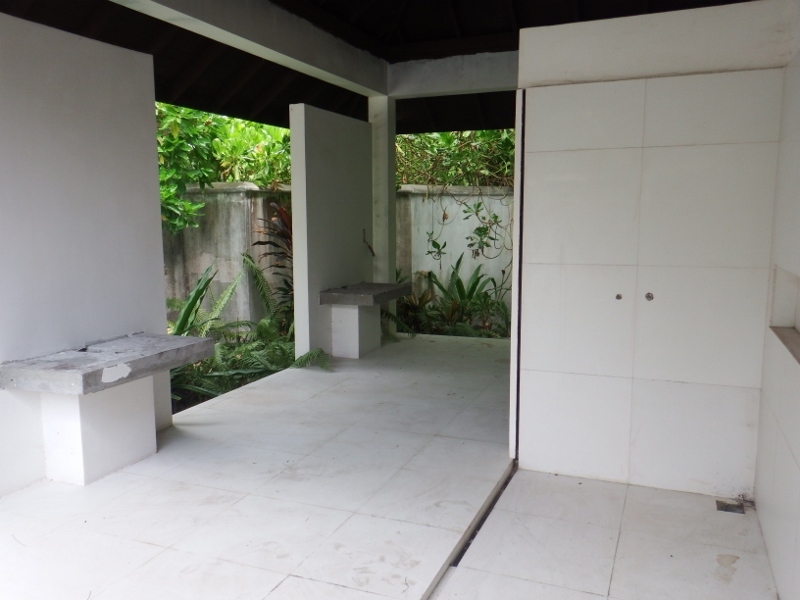 The photo above shows how most of them looked but this is the finished outside bathroom with his and hers basins. The photo above is looking out across the bedroom. 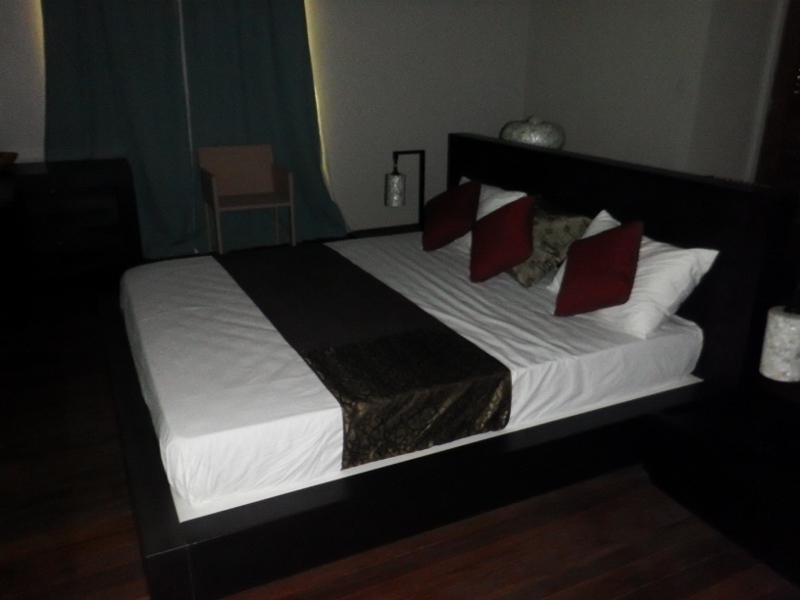 This photo is taken from the corner looking across the room to the bed. The curtains were drawn to prevent the sun getting in. Also behind the wall behind the bed was an amazing dressing room with an enviable set of wardrobes. 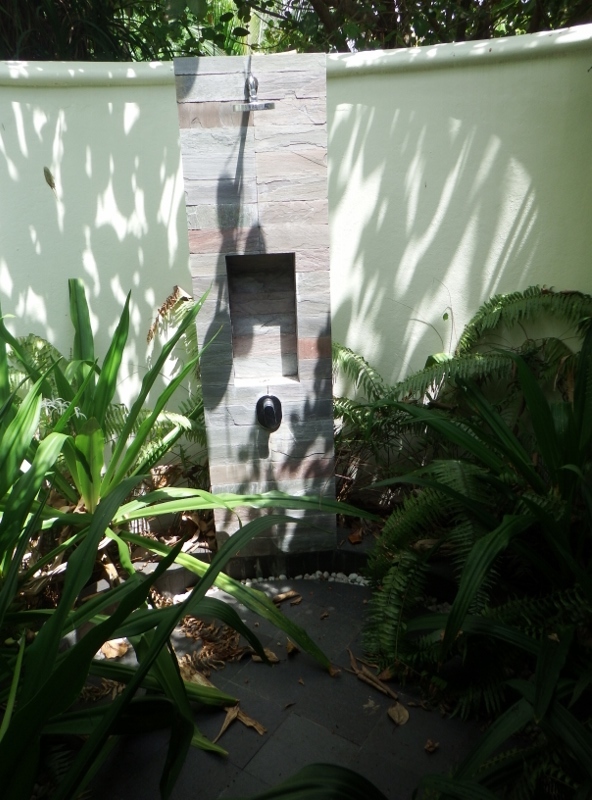 Each villa was going to have it’s own pool but most of the pools were full of dirty water but at villa no 2 it was being kept drained and clean. It looked out onto the beach. 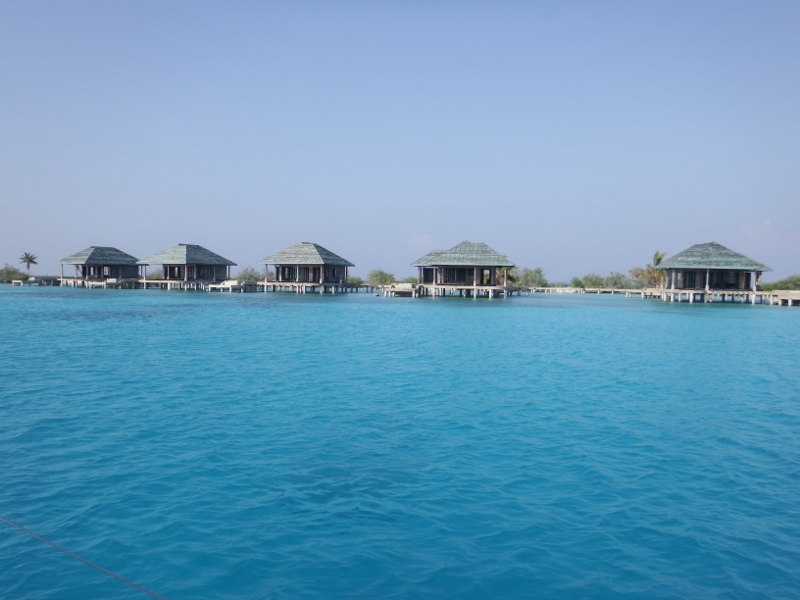 All the overwater bungalows were derelict and you couldn’t get any where near them. The anchorage was good for an overnight stop. 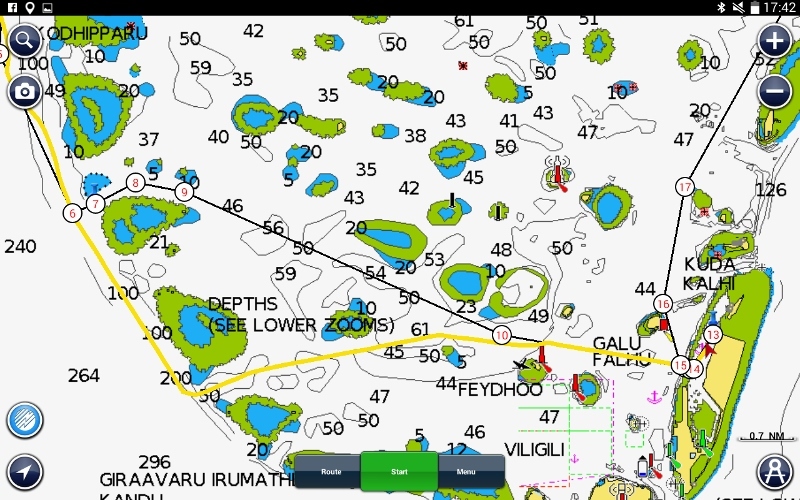 Wednesday 9th March we weighed anchor and left our beautiful island passing the Waldorf Astoria resort on our way out of the Ihavandhippolhu atoll and heading in a southerly direction from now on. They had certainly made good use of the mother island. 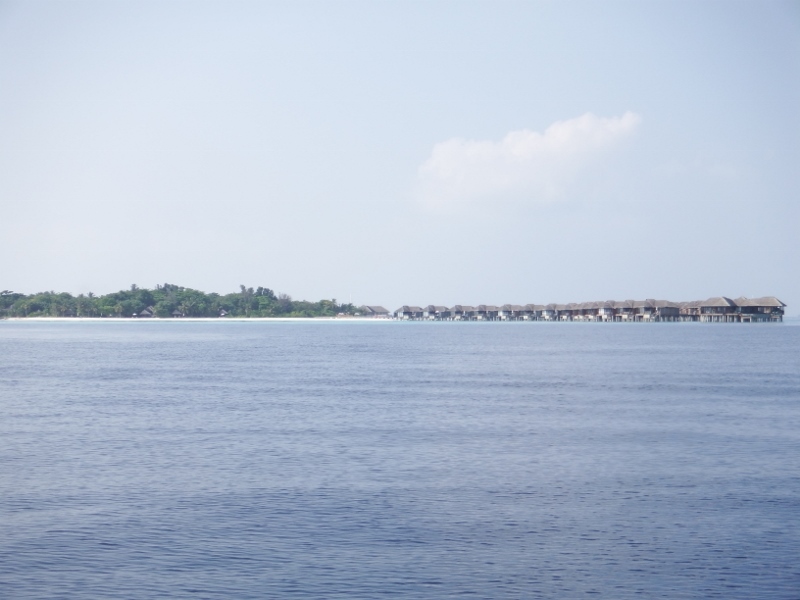 There were over water bungalows coming out of the north and south sides of the island and jetties coming out of the east and west, it probably depends on the weather on how they land their clients or there’s always the bright red sea plane that was sitting there waiting for passengers. How the other half live! 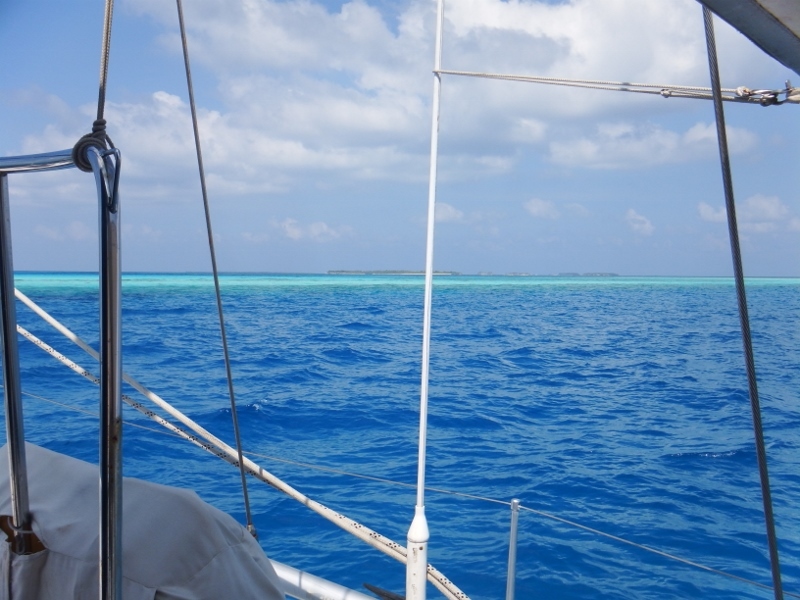 We sailed, or motored, back into the deep water and on towards the Thiladhumathee Atoll. The numbers on the chart are depth of water in metres. Once we go over the edge our depth gauge won’t pick up depths much more than 150 metres and just flashes in a ‘computer says no’ sort of way. 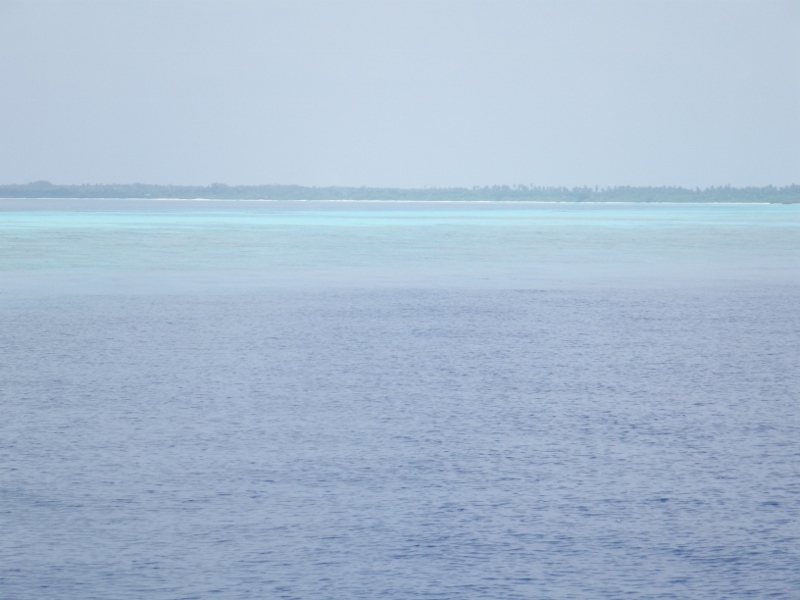 Coming back into the next atoll is a bit unnerving but the reefs are quite clearly visible as we approach. 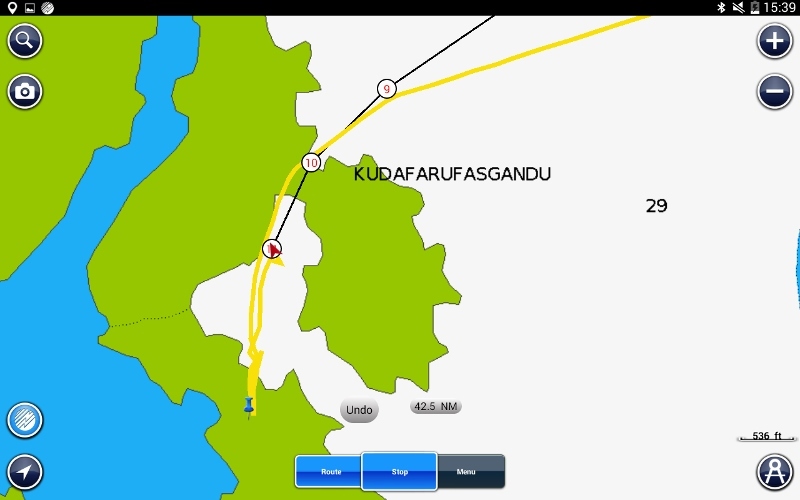 The straight black lines are our planned route and again the yellow line is the track we took. The islands are just basically sand bars and don’t have any height so you don’t see them until you’re quite close. It would be dangerous to do a night sail around this area. 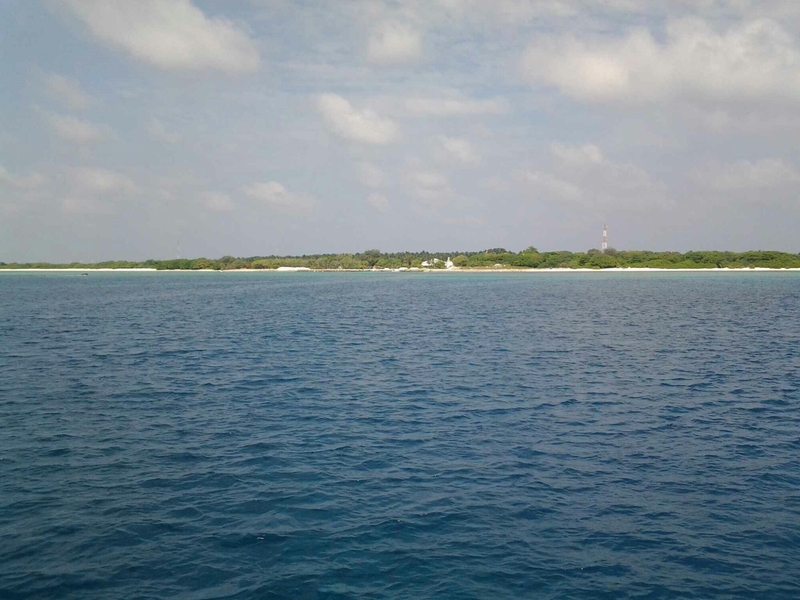 The island just above where we stayed is called Kelaa and was the northern British base during WWII. 073 13.6E in 10.8 metres sand. 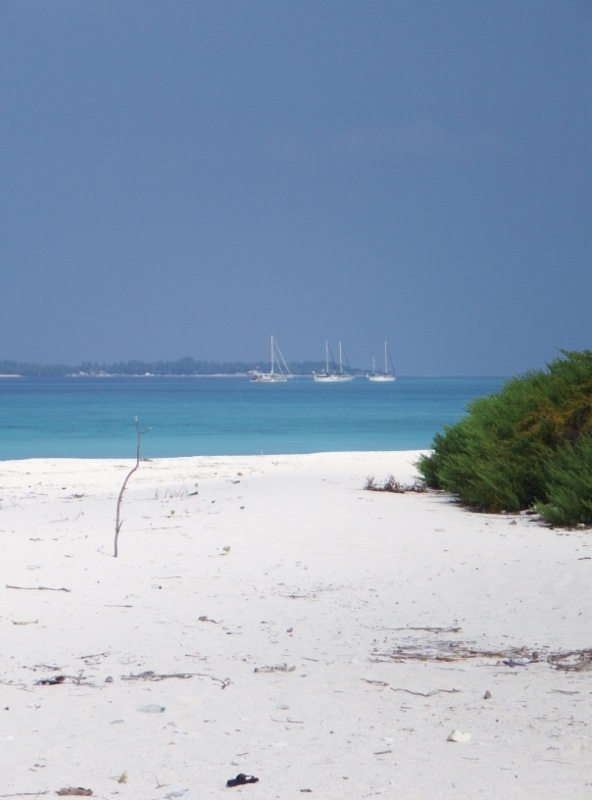 Not sure I would recommend this anchorage because the snorkeling wasn’t very good and the beach is full of mosquitoes but Inspiration lady and Tintin had a nice visit at the village on the island of Filladhoo to the south east of the anchorage. 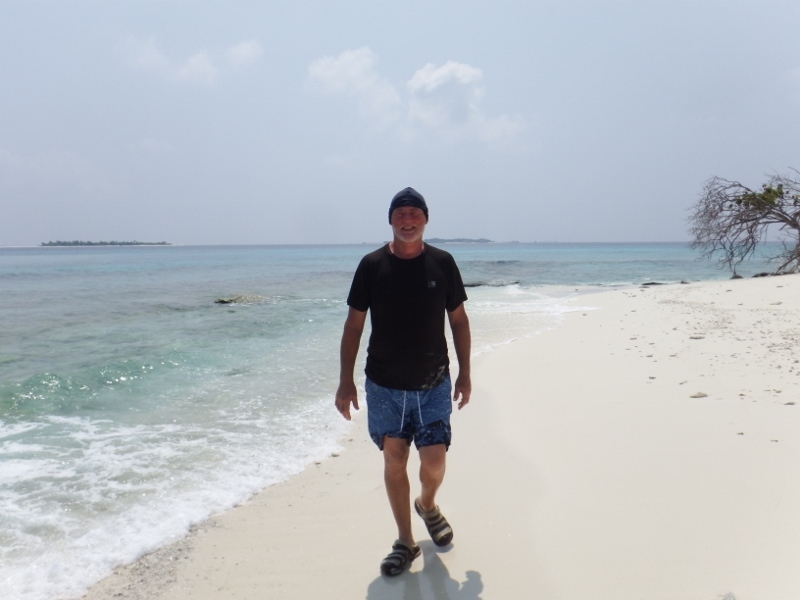 Thursday 10th we left Dhappura and headed southwest to the Rasfari reef. There was a gentle breeze from the north east so we put the twin headsails out and sailed there. 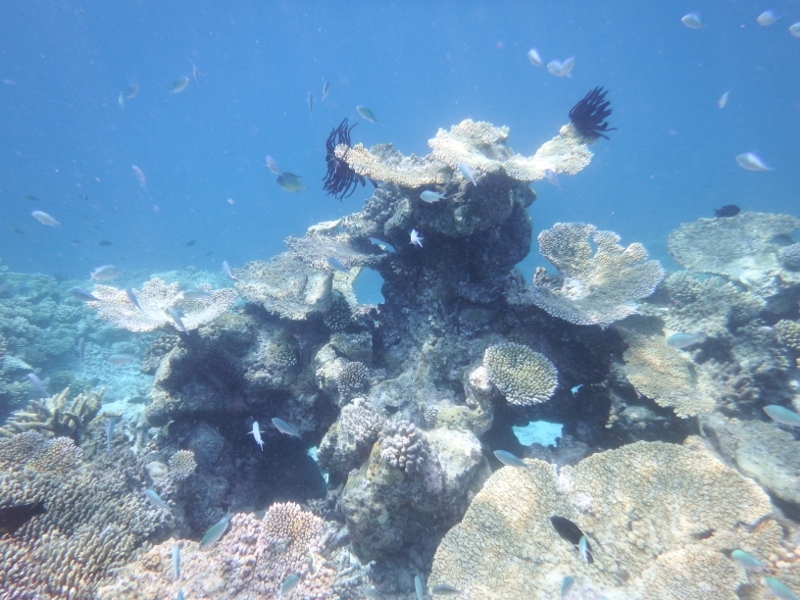 So far we haven’t come across any uncharted reefs and the charted reefs are easy to see with the change in the colour of the water. Some of the islands have been a bit off set according to the radar. 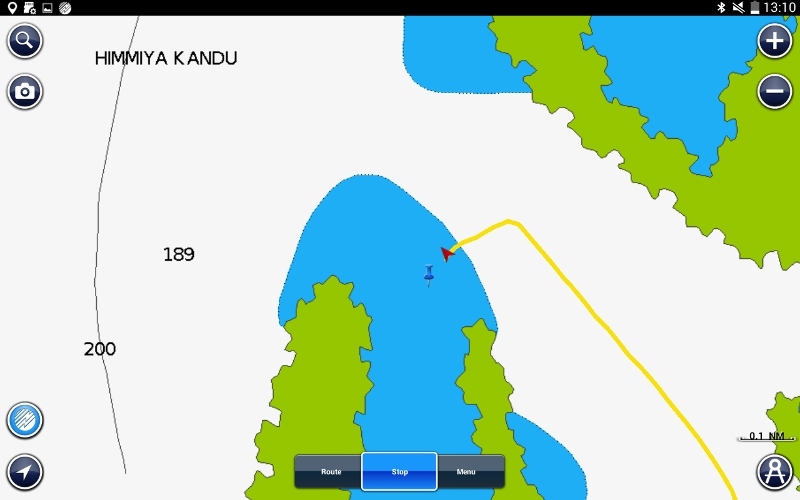 This photo shows our track over the edge of the Rasfari reef, the green area is reef which means we shouldn’t cross it but you can clearly see our track takes us straight across it. 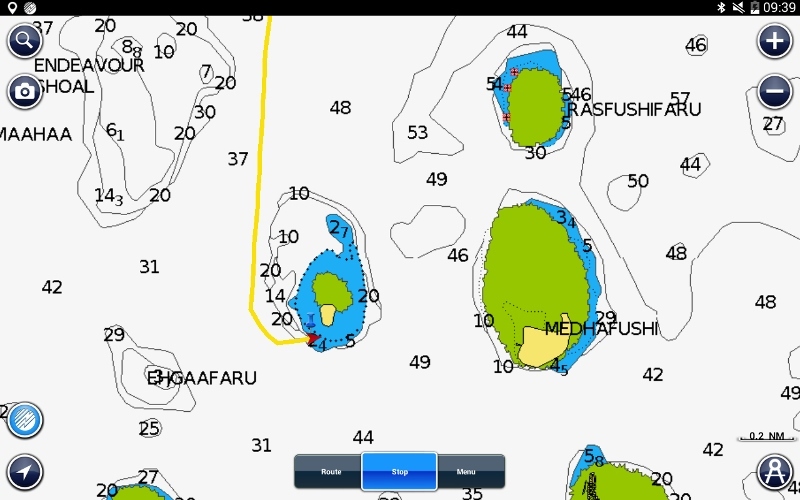 I had checked it out on google earth which showed a clear passage through the reef plus we had some waypoints from other cruiser that had already visited. When we arrived I stood on the bow looking out for the deep water. The passage was narrow but there was plenty of room for us. It is a deep anchorage but we managed to find one of the few 18 metre spots there. 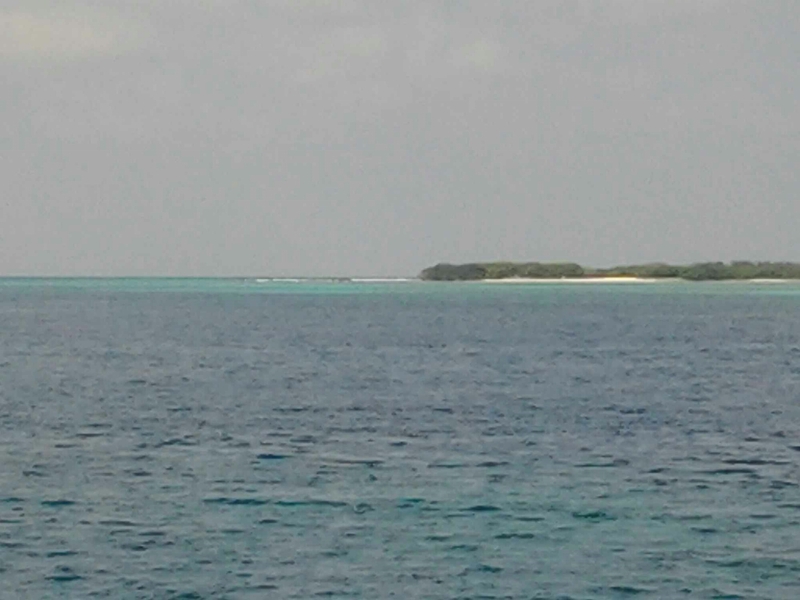 Looking across the reef to the nearest island. It was a stunning spot. 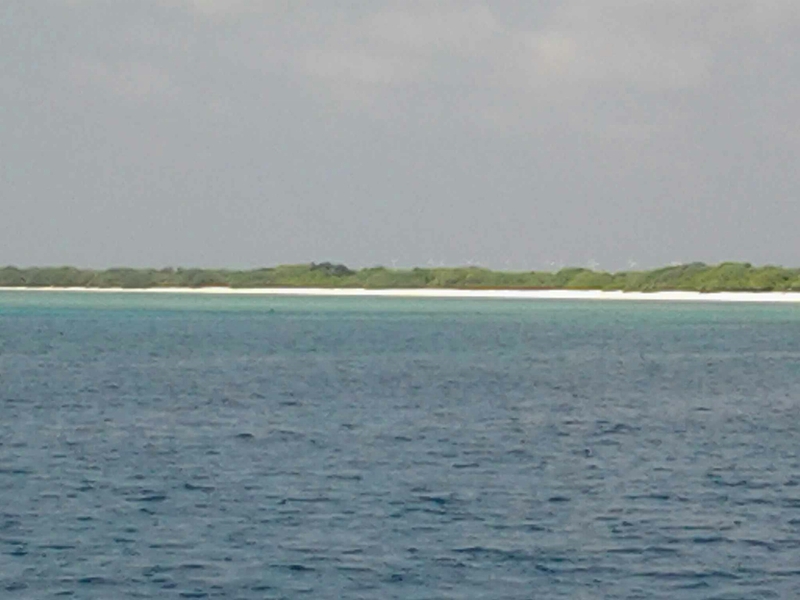 We were over two miles from the nearest island but the reefs were giving us protection. 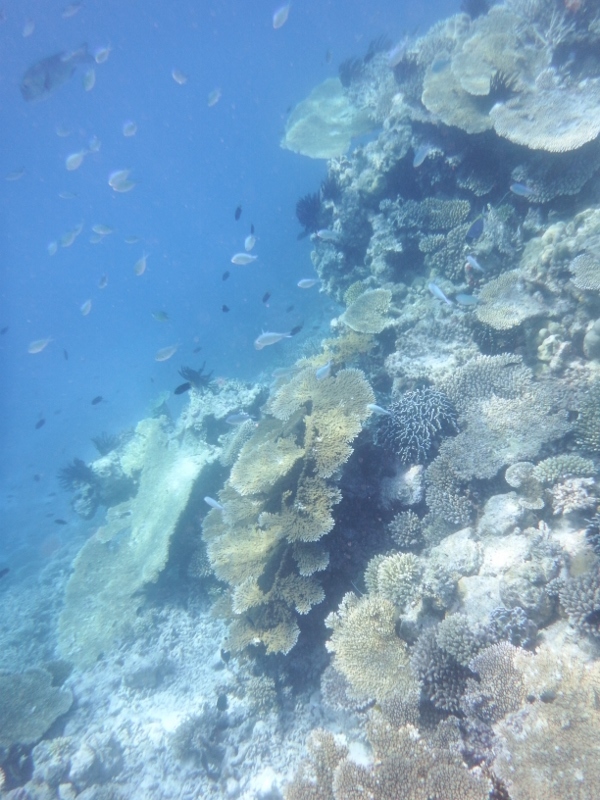 There was a reef to our port and starboard sides and a few hundred metres in front of us. So the dinghy was lowered and off we went. 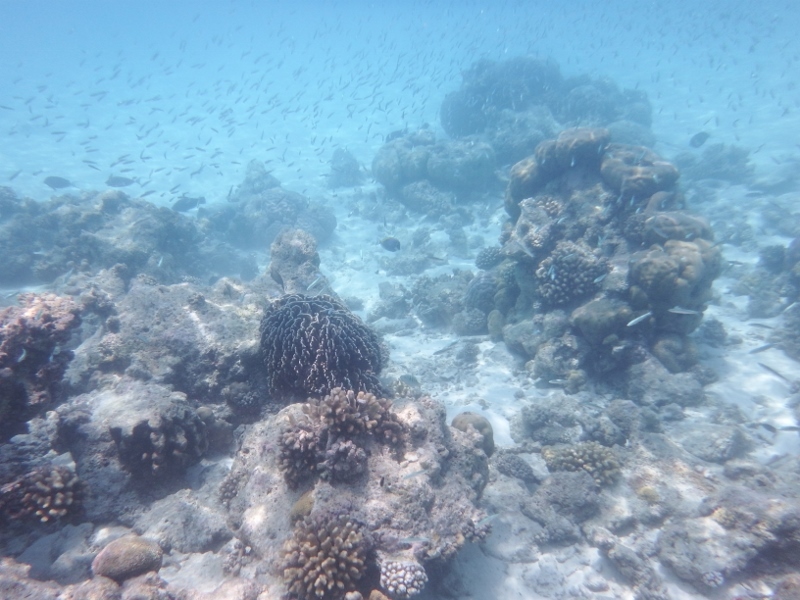 WOW the snorkeling was amazing. I have so many photos and found it difficult to choose which ones to post on here so I’m just going to post lots of them. 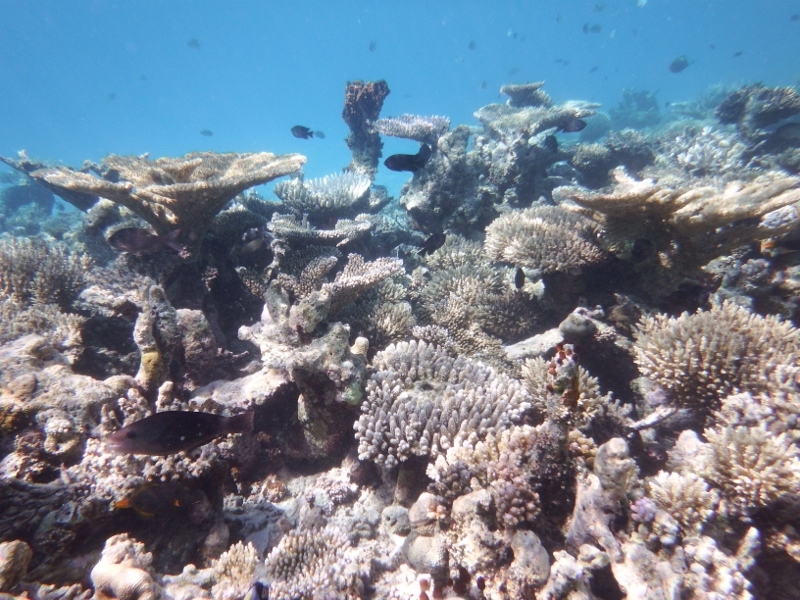 Lots of stag coral too. 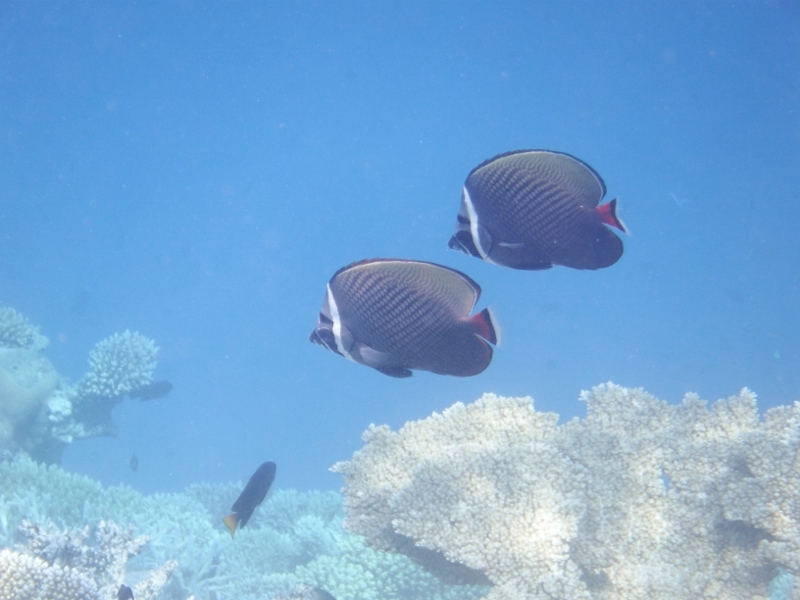 Can you spot the Angel fish. 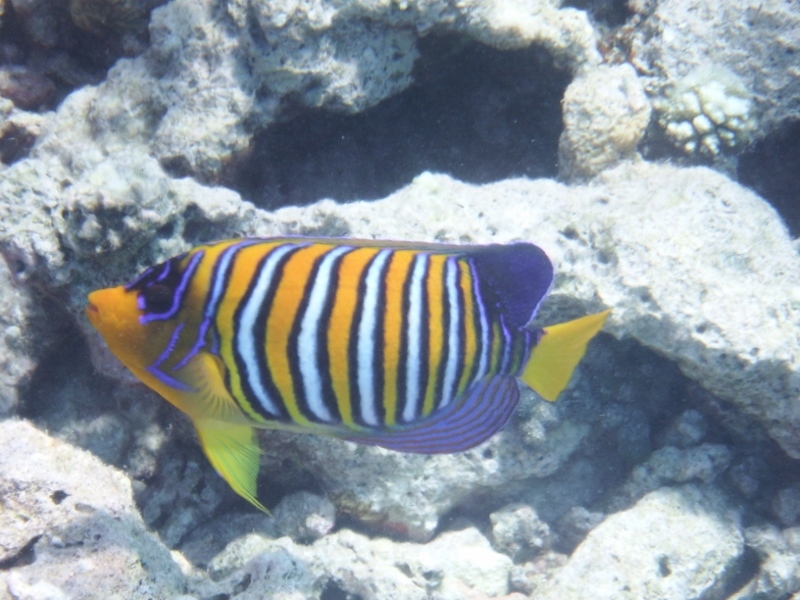 All of these photos were taken at the reef to the east of us. 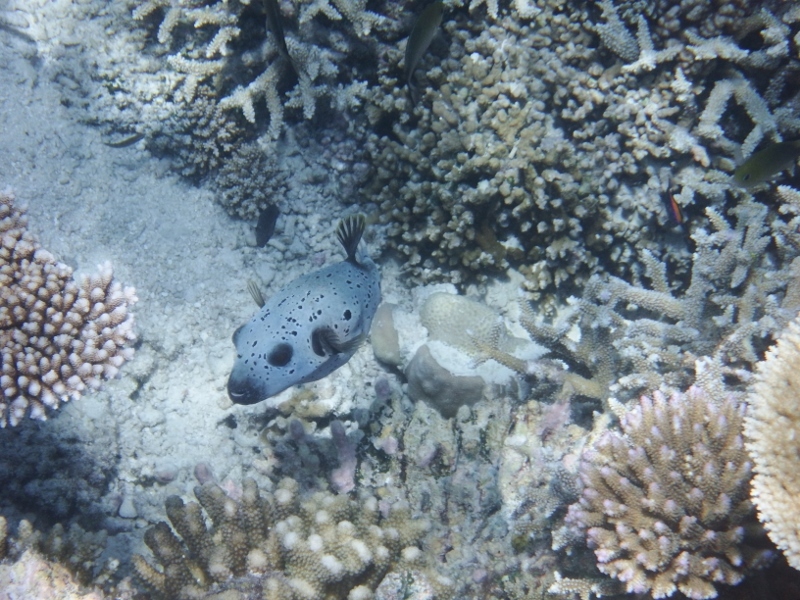 The next day we went forward to the reef to the south and west of us and the fish life was astounding. 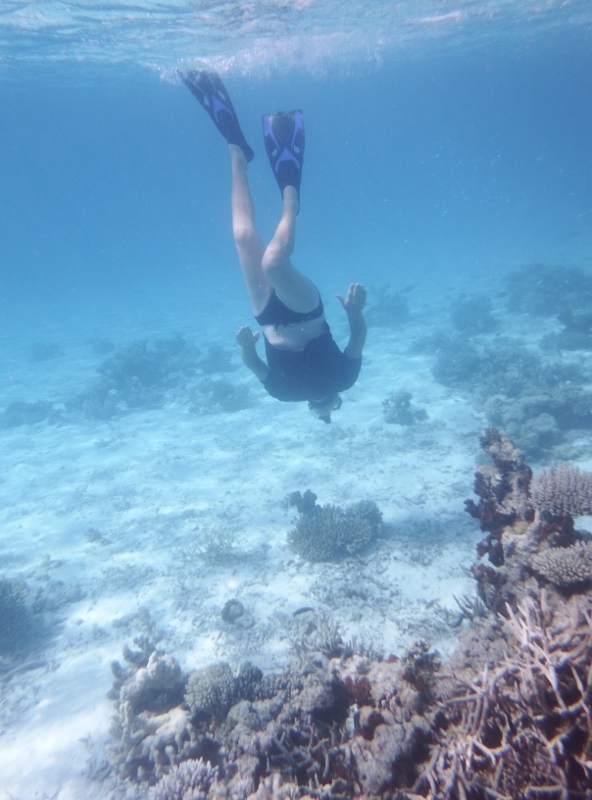 Snorkeling along the edge of the dropoff was the best. 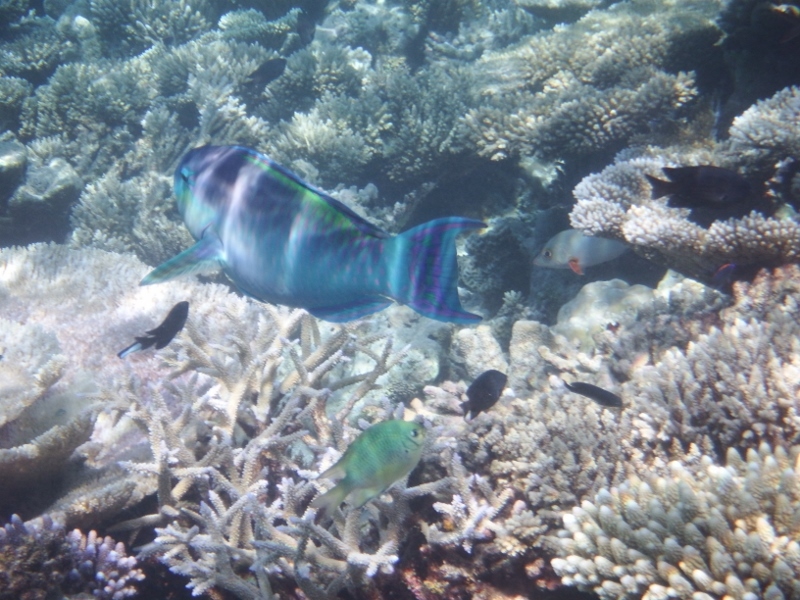 The fish hang around waiting for the nutrients to float off the reef. So many fish. 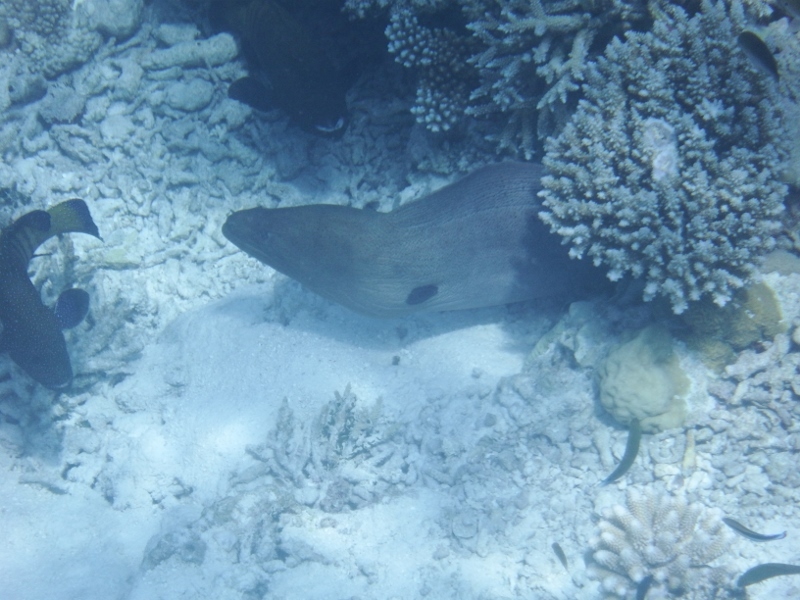 Then we spotted this big boy lurking under the rocks – a moray eel. Quite lucky it see it because it blends in with rocks and it was quite a way down, about 4 or 5 metres. He came out of his hiding place and slithered under the next rock. It was a good metre and a bit long. 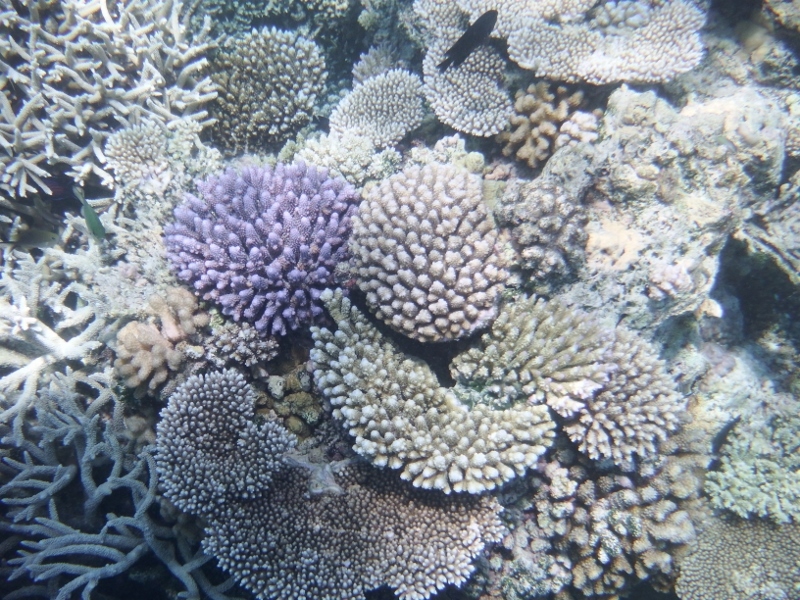 Some of the little coral heads are so pretty and colourful. This one was mauve, pink and white. 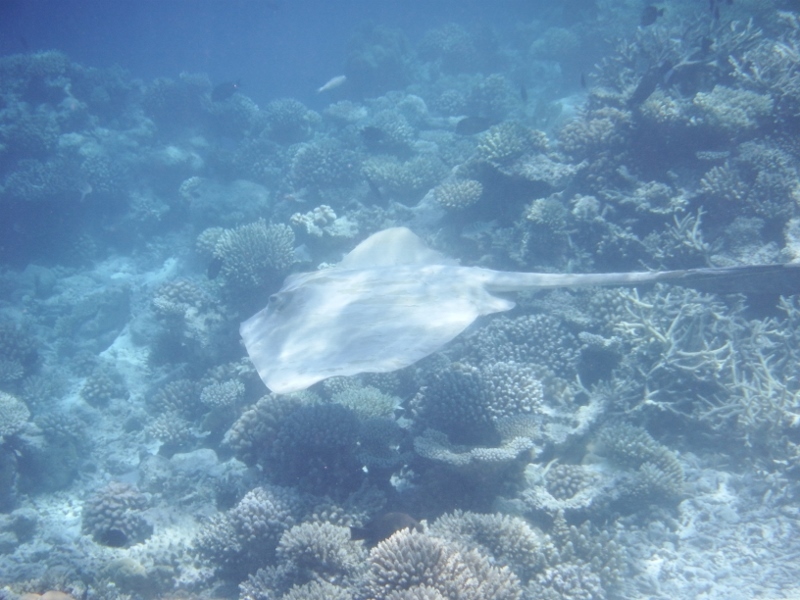 Then we spotted a big 3 metre nose to tip of tail sting ray. This wasn’t one of those tame ones you can feed in the resorts but a real wild one. A bit scary really. A large stingray with a long tail. Bill swimming with 100s of fish following him. 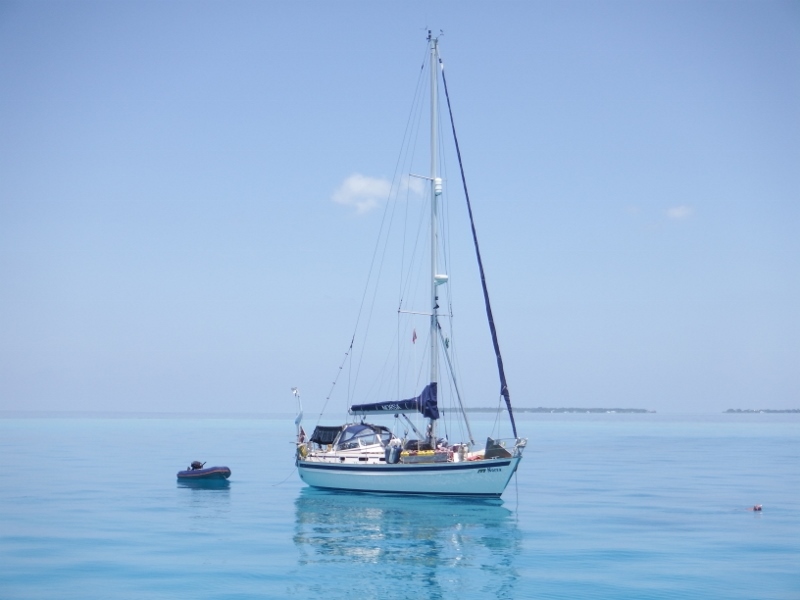 Back in the dinghy and motoring to the reef to our south. 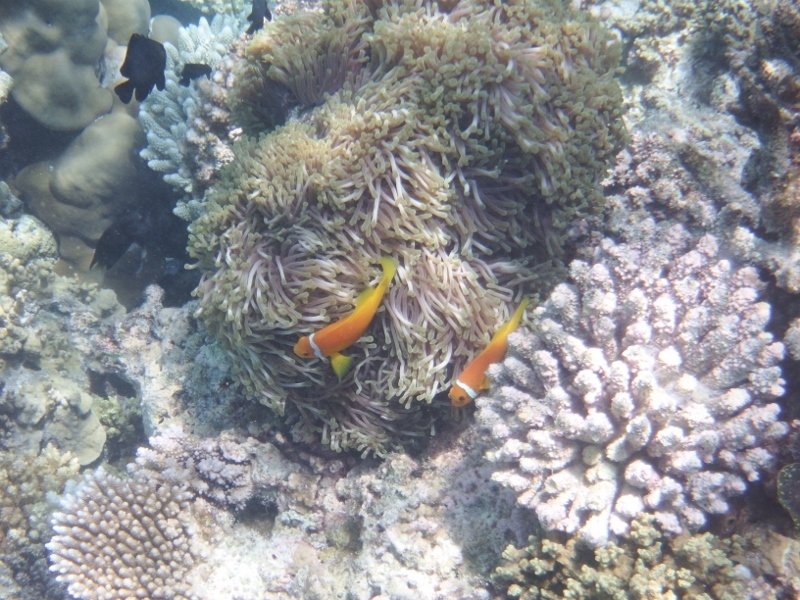 The colour of the water here is astounding The bommies were further apart in the middle of the reef. 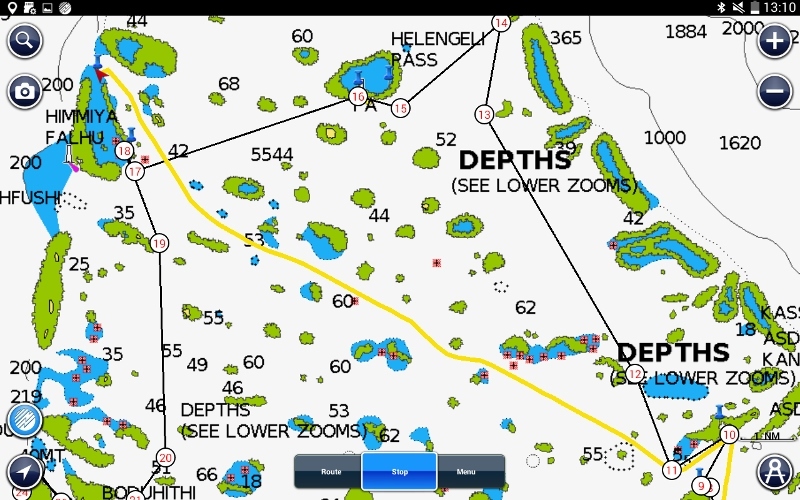 While motoring over the lagoon we could see a spot where we could have anchored in 3metres in sand but getting over the reef is the tricky bit. I think we’ll leave Camomile where she is. She’s quite happy watching us have fun. For the boats coming behind us. 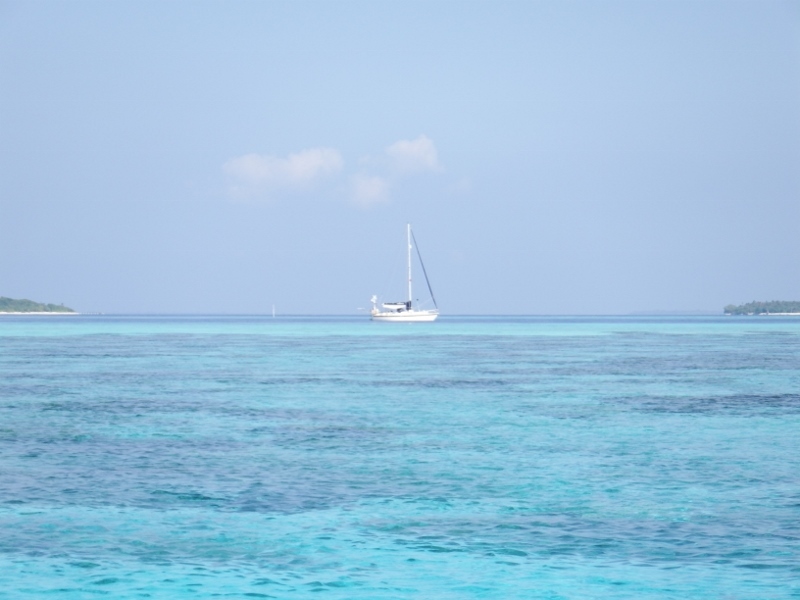 From the anchor spot look to the south west you’ll see a red dinghy buoy which the fisherman often use with a white buoy near it (hope it hasn’t gone) when you’ve travelling in your dinghy on the west side of the reef keep those two buoys in line and head directly south. You’ll come across another buoy just before you get to the reef (it’s difficult to see) that reef in front of you is the best. An amazing drop off. 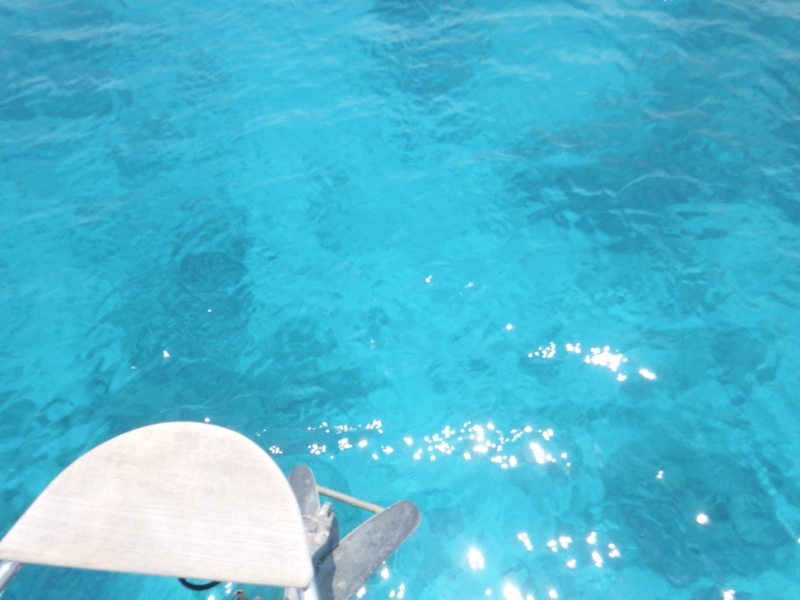 When you’re swimming along the reef looking over the edge it feels like flying as you look down 10 to 20 metres into the deep blue. It’s a divers paradise. 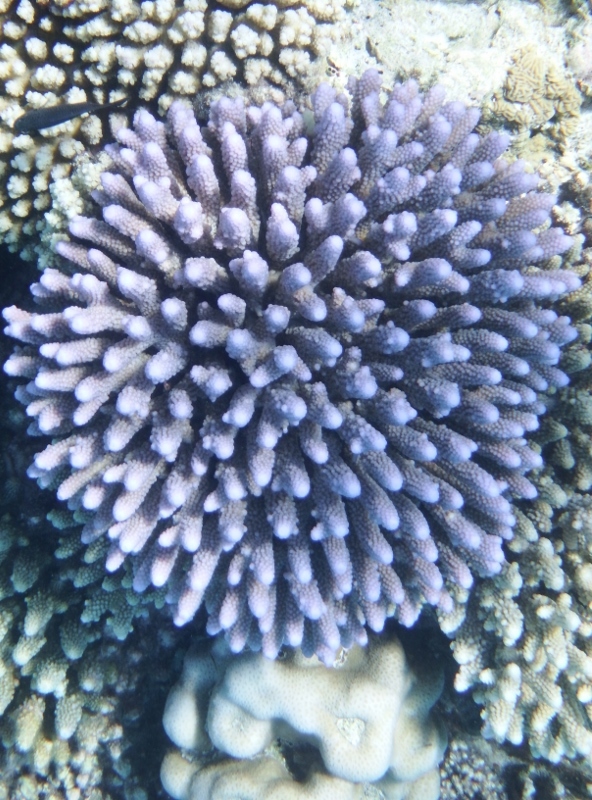 Last coral picture. Looks like a sea monster with horns. 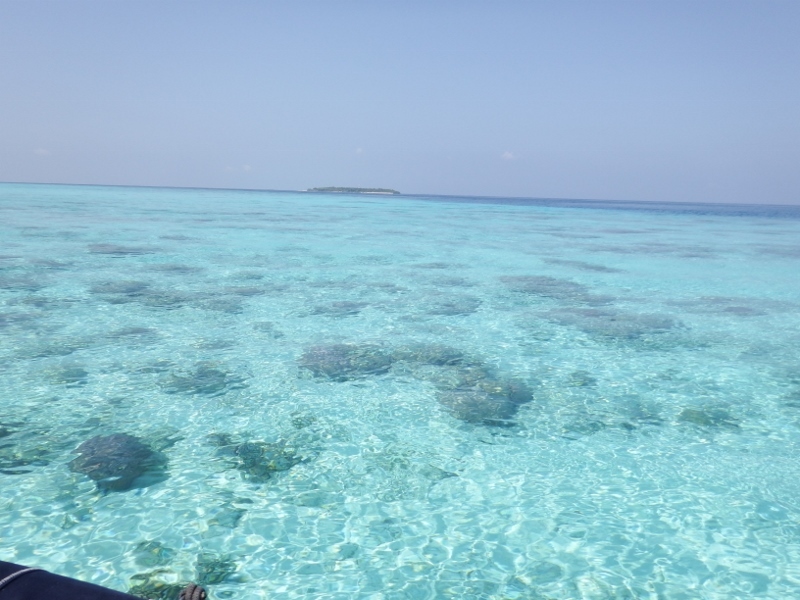 Saturday 12th we left the Rasfushi reef on our way to Kulhudhuffushi where we were meeting up with Inspiration Lady and Tintin again. After an early morning start we got to the harbour at roughly the same time as Inspiration Lady. It’s possible to tie to the wharf but Bill wasn’t happy doing that so we went in and dropped our anchor. Unfortunately we were drifting too close to the shallow area by the wall. Bill tried to bring the anchor up quick but it jammed and wouldn’t go up or down. Gary was planning to go up against the wall and suggested we tie alongside them which we did so Bill was able to sort out the anchor chain. Tintin came in about an hour later and also tied to the wall. It was only US$12 to go into the harbour which was very reasonable and saved us anchoring in the deep water outside. The town wasn’t very big but had an ATM so we were able to get some local currency. It also had some groceries stores and a couple of places to eat. It was Jackie’s birthday and we all went out to celebrate (camera left behind). The tide dropped overnight and unfortunately Inspiration Lady’s rub rail managed to get under the big rubber fender that is permanently attached to the wall of the wharf and as the tide was coming back up it ripped part of it off. The fenders had bounced out of the way. Poor Gary. Bill helped him remove the old wood but he has a serious repair to do. 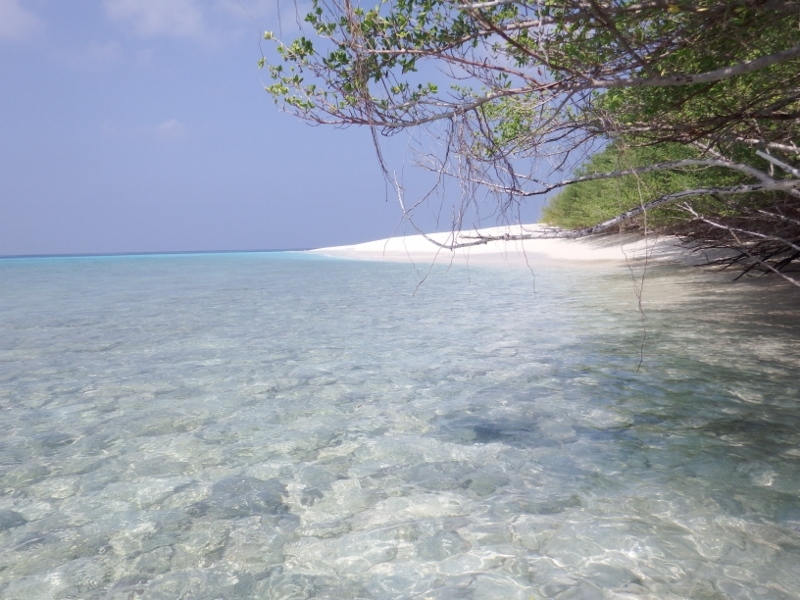 We stayed there two nights then headed out on 14th March to continue south and into Miladhunmadulu atoll. 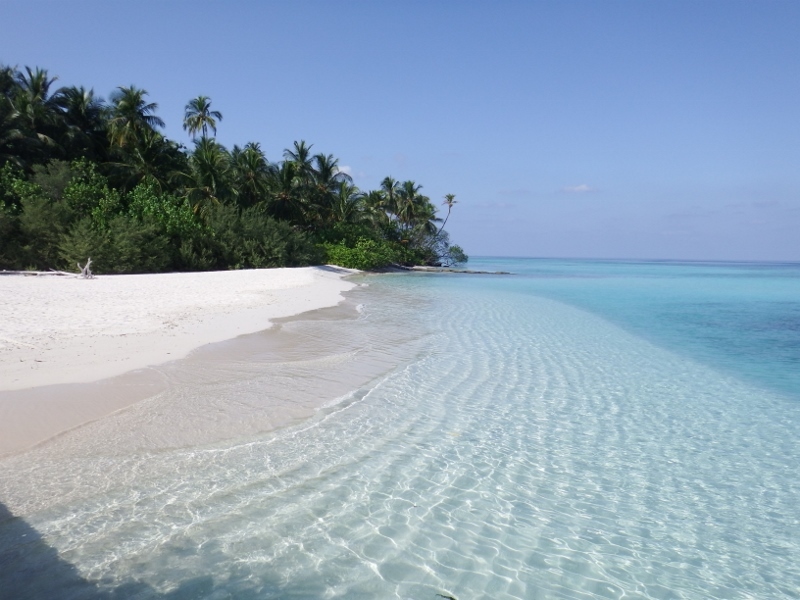 The northern atolls are the least developed regions of the Maldives and are almost unknown to foreigners. 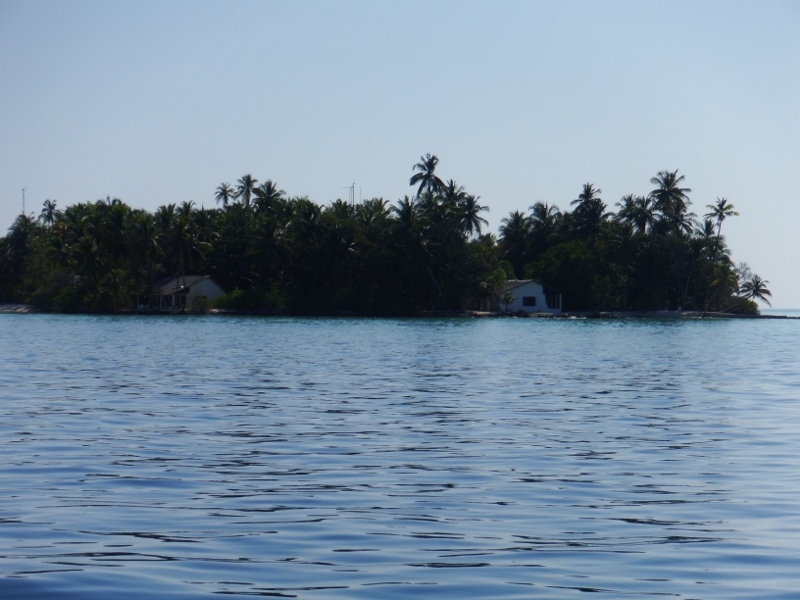 The traditional Maldivian life is virtually untouched. 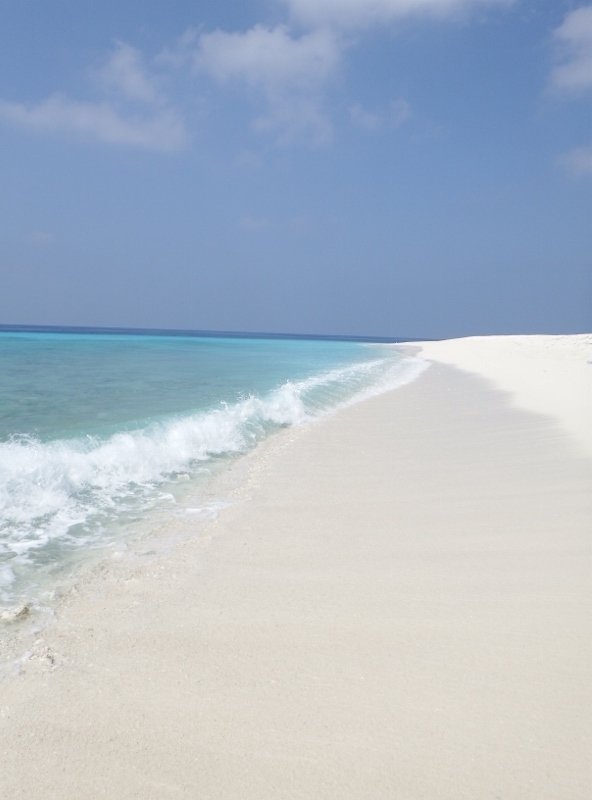 The Ihavandhippolhu atoll is generally known as Haa Alifu atoll, possibly because of it’s unpronounceable name. 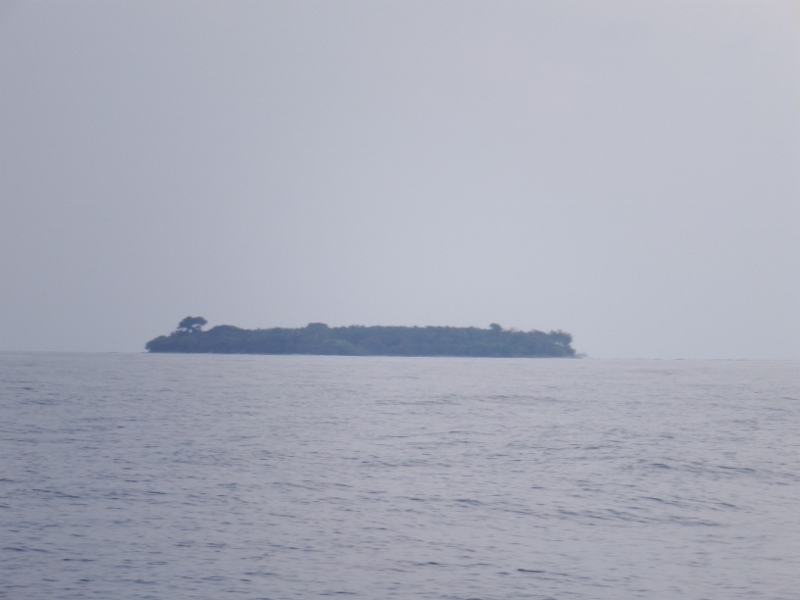 The island of Uligamu, where we checked in, is right at the top of Haa Alifu. Sunday 6th March was Mother’s day in the UK and I was feeling sad because I couldn’t spend it with our sons so we went for a walk around the island instead. Having walked around the village several times now we knew our way around. 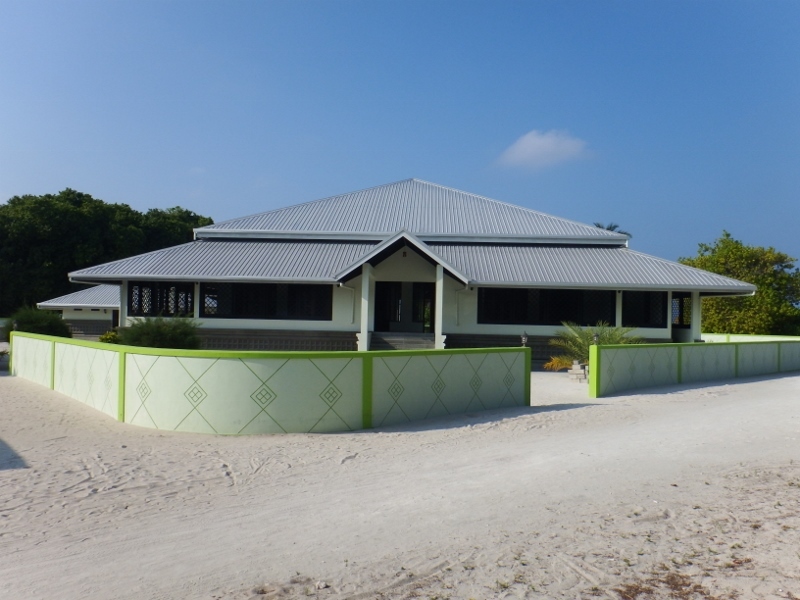 This is their lovely mosque on the waterfront that has been recently built. 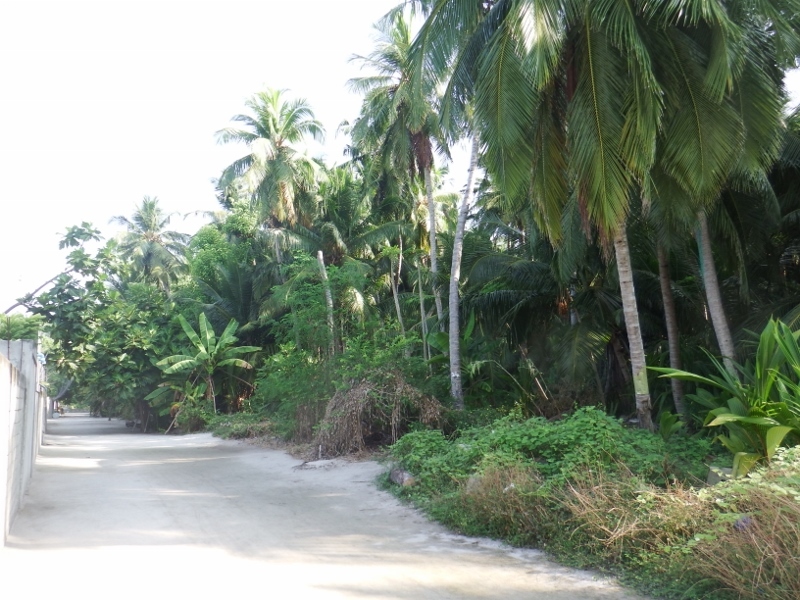 We walked past and through the village to the jungle edge and kept going across the middle of the island to the beach on the other side. It’s only a 20 minute walk. There was quite a small beach but we headed south and started walking around the island. The beach became rocky and difficult to pass so we walked back into the jungle. Bill discovered this well by the path. 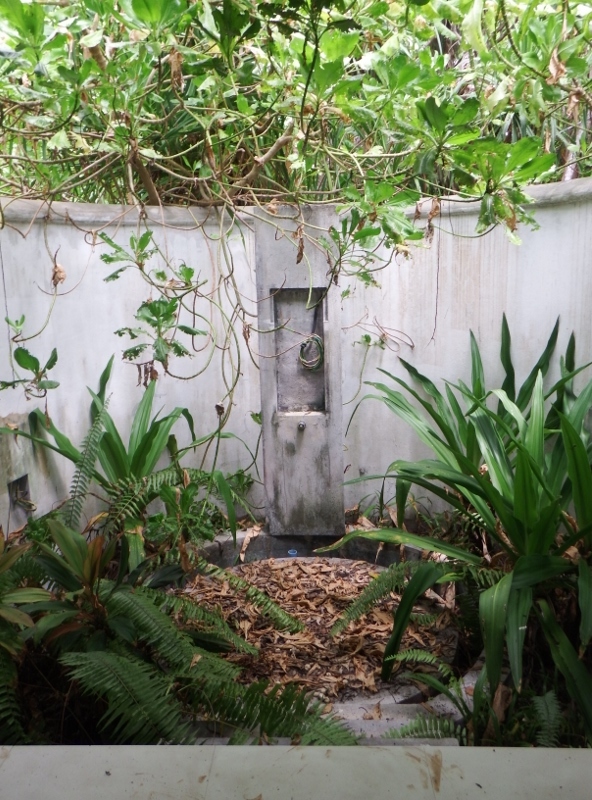 Most of the islands have a fresh water table running under them and this well had been dug to access the water. Not sure I would drink from it. 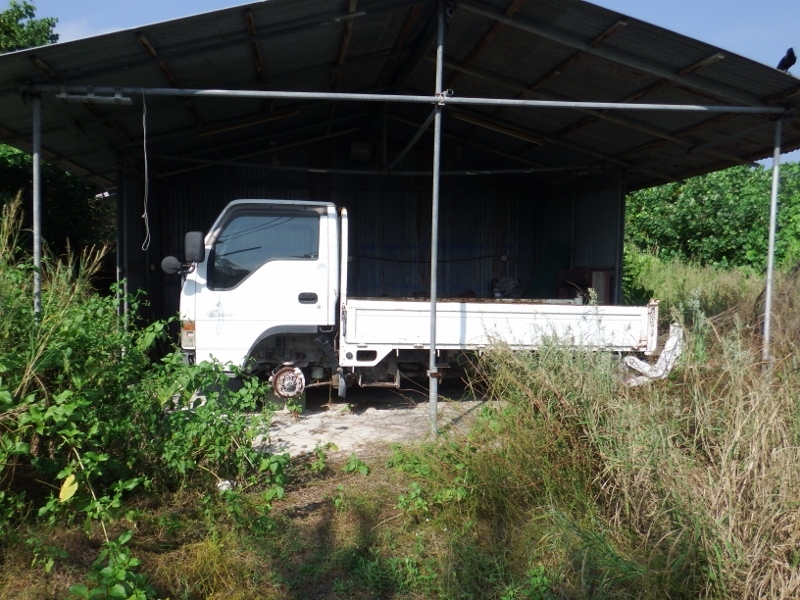 There aren’t any vehicles on the island but we discovered this old truck a bit worse for wear. Needs a new set of tyres to start with. 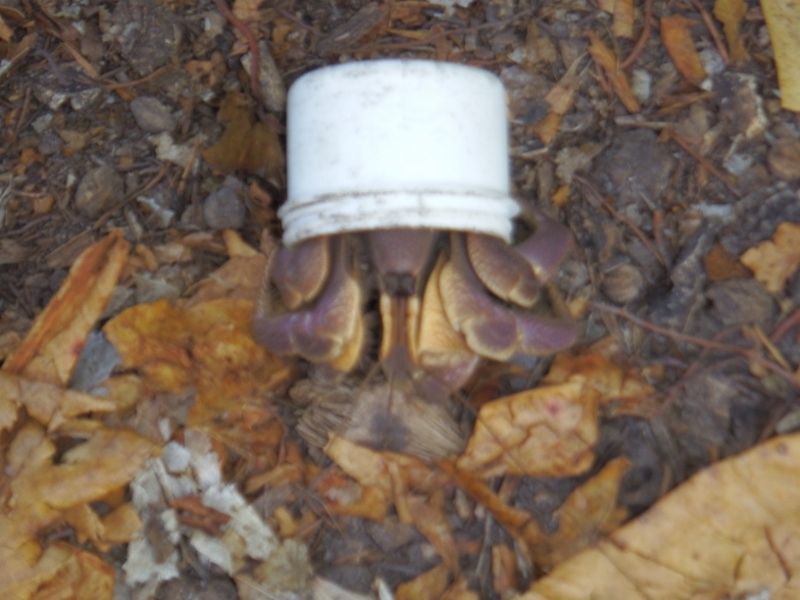 This crazy hermit crab is using an old aerosol top as a shell. Eventually we got back onto the beach. The sand was so soft under our feet; our footprints were the only ones on the beach. 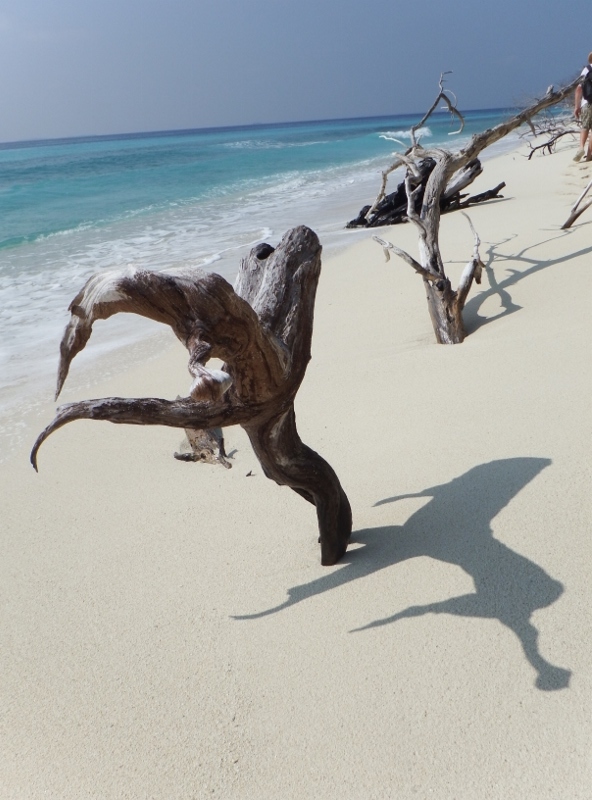 The driftwood was amazing. Thinking of you Claire Fox, you would love this beach. 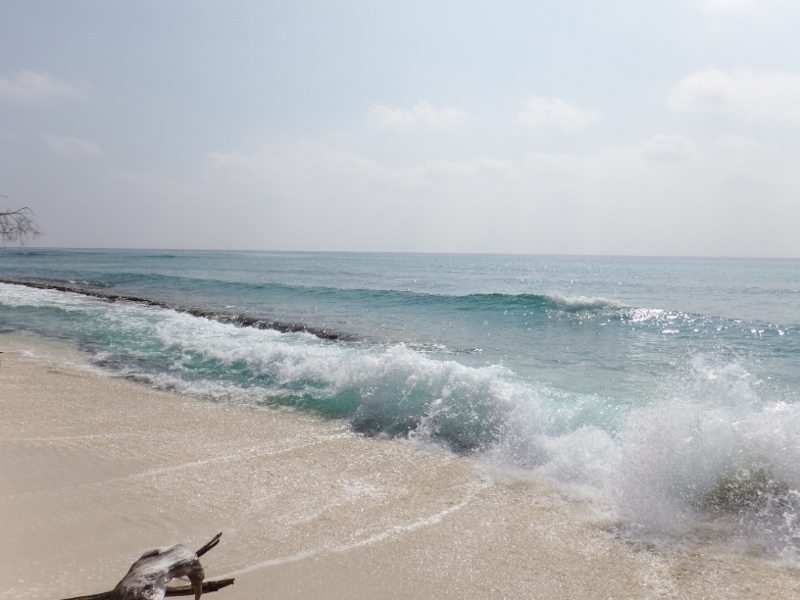 The waves were mesmerising as they crashed over a hard edge of coral all along the beach. Not so good for swimming but wonderful to watch. 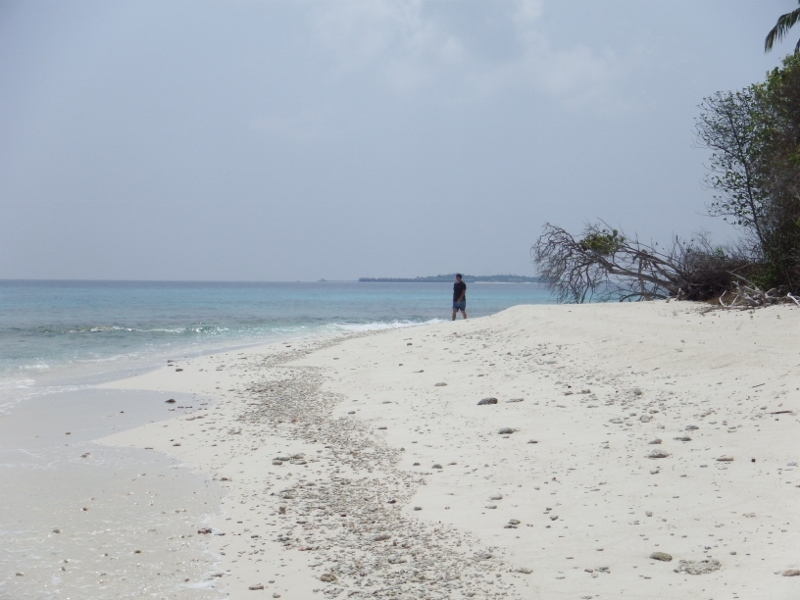 Eventually we came to the southern tip which formed a sand bar. Such beauty. 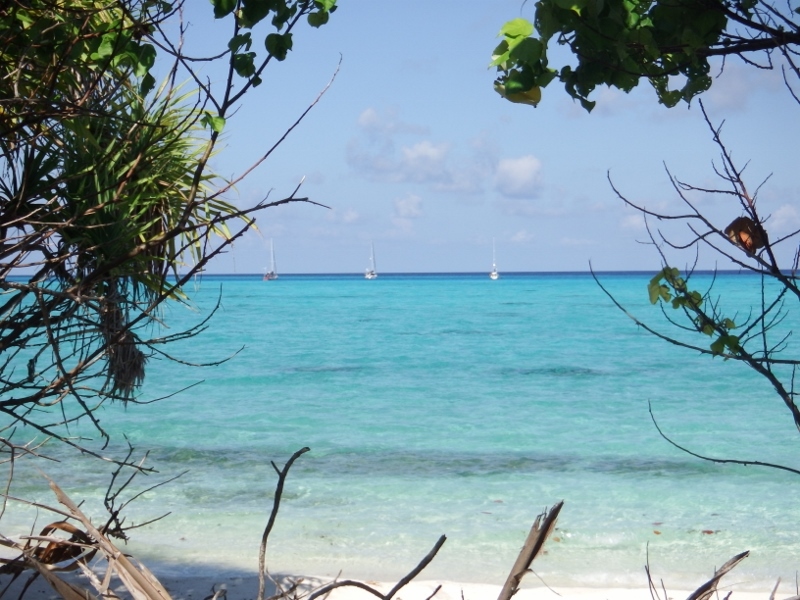 The western side of the island was calmer being away from the swells coming in from the Indian ocean. Bill managed to find a tree to sit under……. 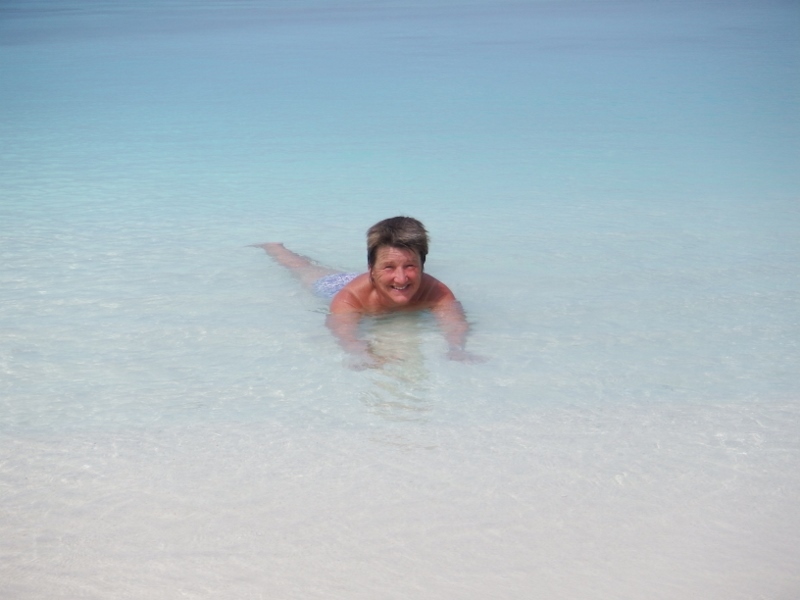 ….. while I played in the beautiful warm azure sea. Monday 7th I did some writing and we stayed on the boats waiting for the grocery delivery from an island further south. I had ordered some bread and wasn’t sure what would turn up but some very nice fresh brown bread arrived in the afternoon. Happy Birthday to my sister Amanda today. Tuesday 8th was the day we decided to leave Uligamu. After having been there for 5 days it was time to move on. 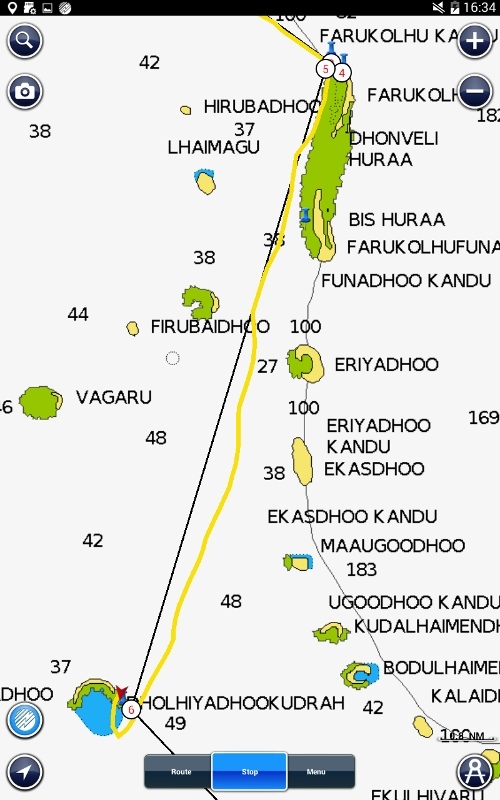 We didn’t go far just 5 miles south to the island of Govvaafushi. We gradually crept in until it was shallow enough to anchor. 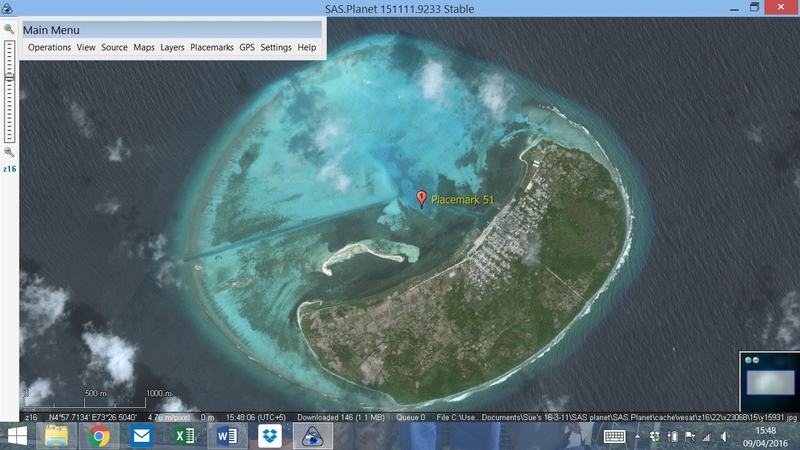 It was still inside the Ihavandhippolhu atoll. 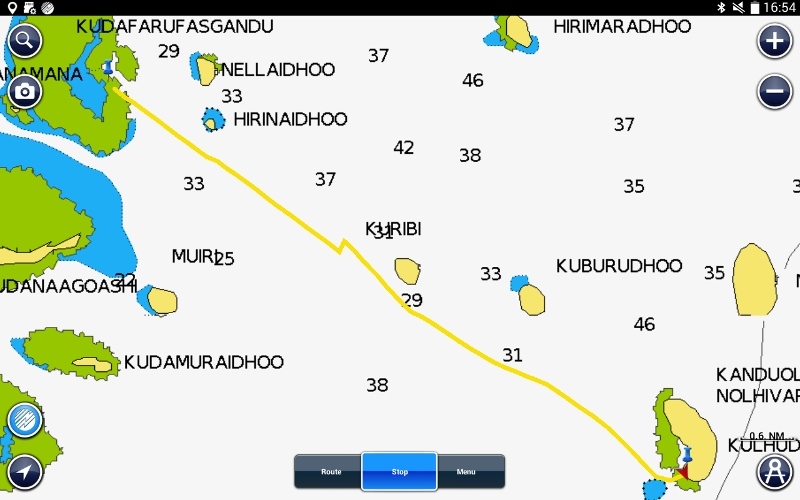 The yellow line is our track. 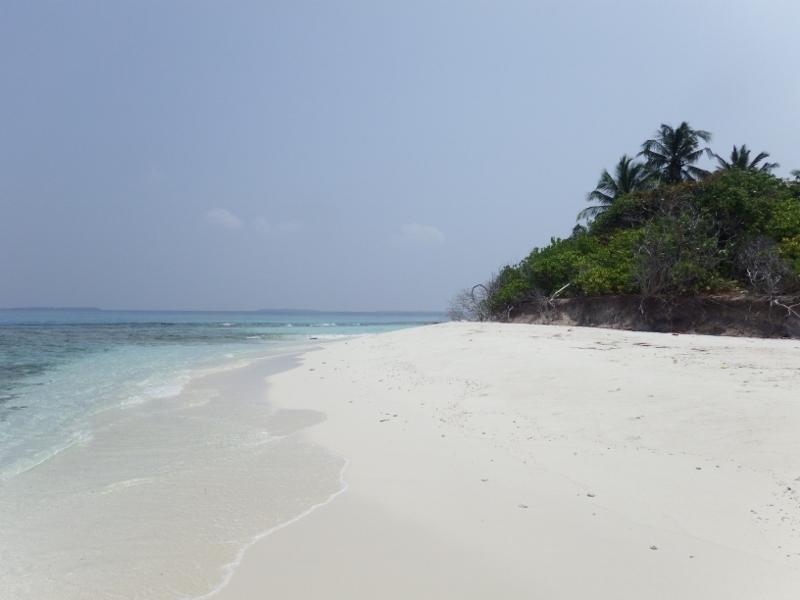 The island belongs to the Waldorf Astoria whose resort, which is the most northerly resort in the Maldives, is on the next island. We went ashore and discovered the most romantic hideaway hidden in the sand dunes. I took a video but failed to take any pictures – how silly of me! 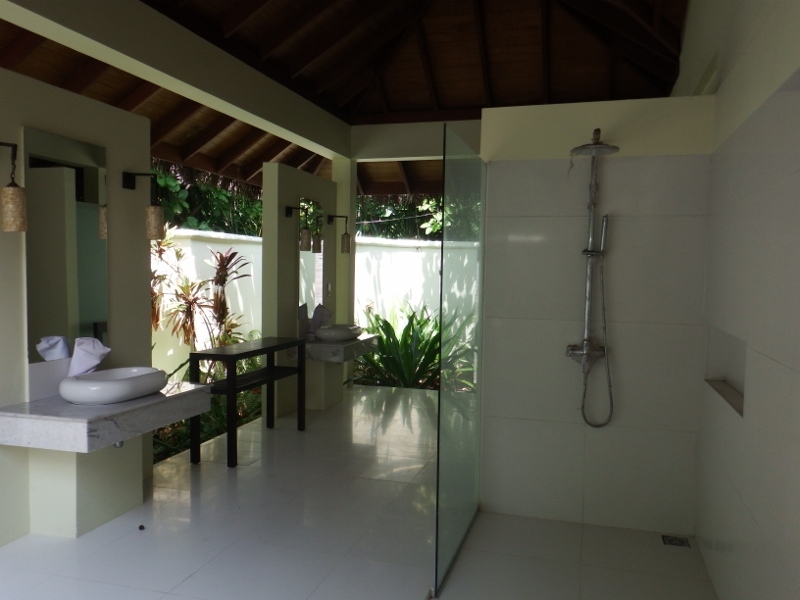 Any way there was a little hut with a table and 2 chairs on the patio with an outside shower room behind it. Next to it was a circular outside bed surrounded with mosquito netting. 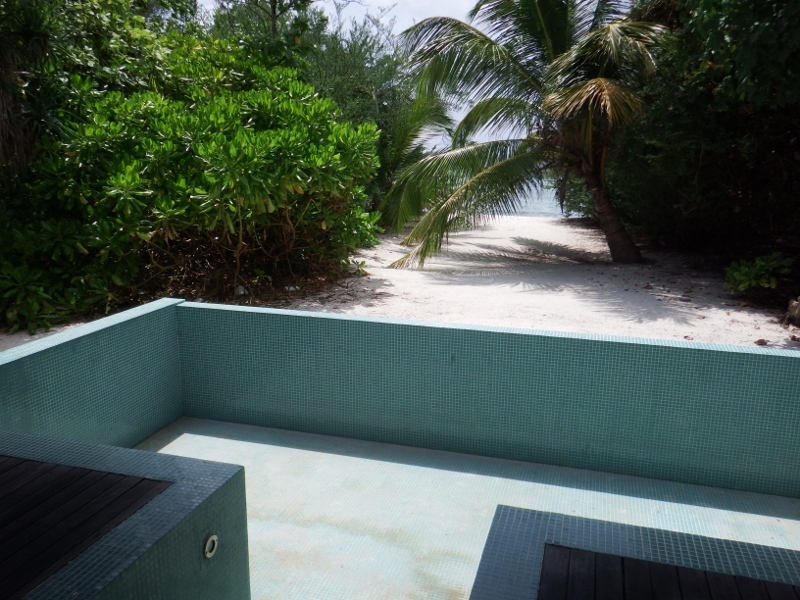 As it’s US$1300 a night on the main island goodness knows how much the ‘Castaway island’ experience would cost but it looked beautiful. I’ll post the video on facebook. The island was very small and you could walk around it in about half an hour but what an amazing half hour. The beach was stunning. Who is this walking around the island? 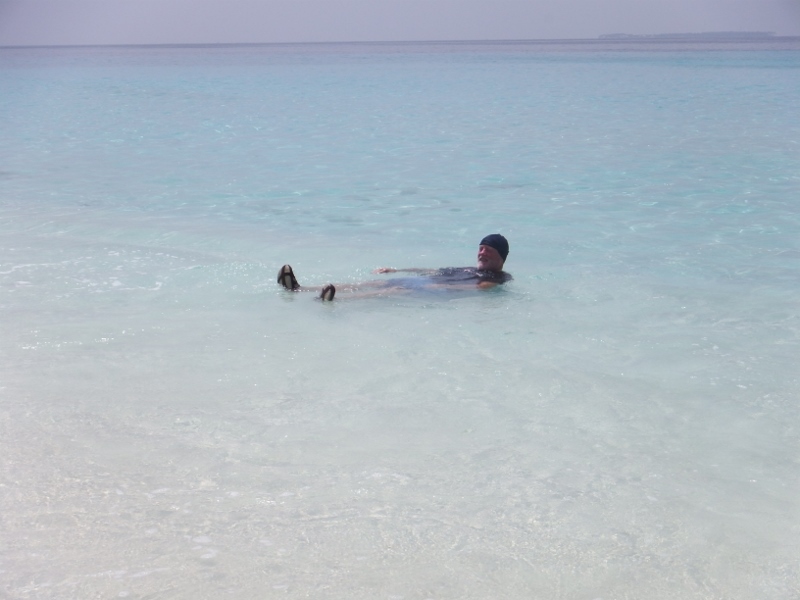 We spent the morning just relaxing and swimming in the warm waters before going back to the boat. In the afternoon a resort boat turned up with 2 island workers followed by another boat 10 minutes later with 2 resort guests. After serving them with cold drinks on the beach they were left on the island to enjoy lunch and a swim . They only stayed a couple of hours, I wonder how much it cost them. 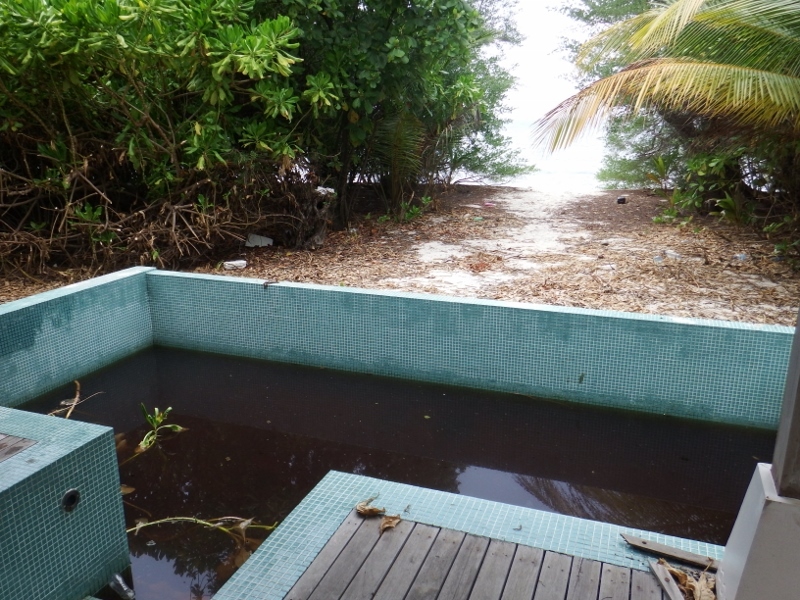 After the guests were taken off the island the resort staff returned and cleared everything away, mattress, mosquito netting, picnic, towels, even the shower gel. The spoil sports even turned the water off because I was going to have a shower. 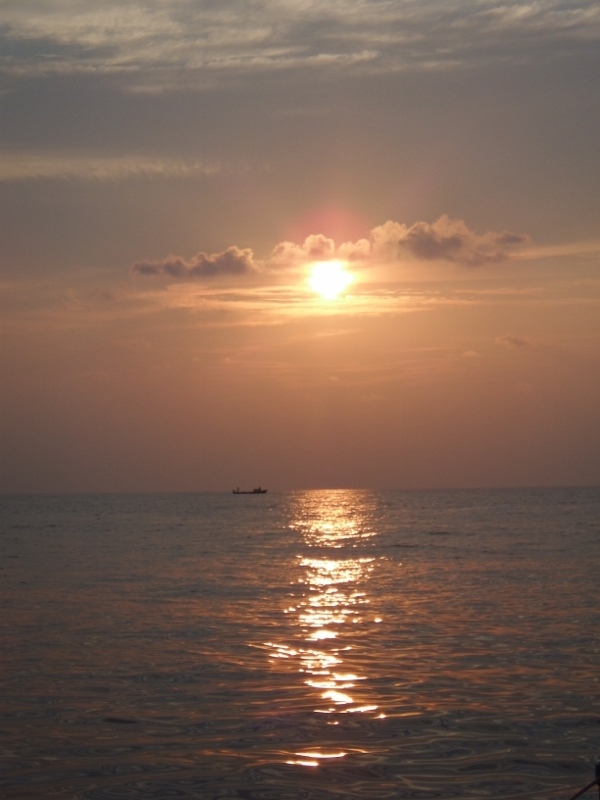 We had our sundowners on the beach and watched the sun go down. 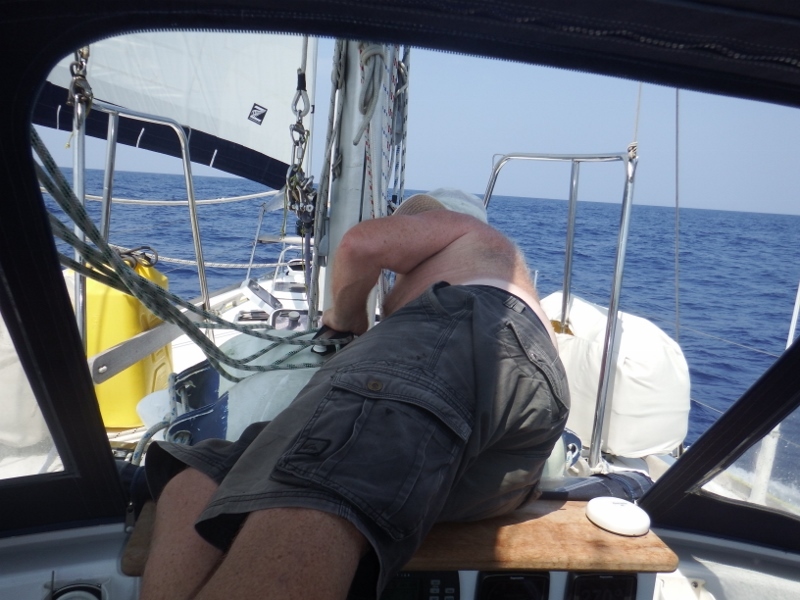 Our last 24 hours at sea was motoring the wind died completely and we took the sails down. It wasn’t so bad because the water maker was on so we could have showers and clean the boat when we arrived. It was exciting seeing the first islands during the day although they are made of sand with jungle covering them and aren’t very high. Some of them have villages on them but a lot of them are uninhabited. The last part of the journey saw an amazing sunset. Not so good because we wanted to be anchored before it got dark. We came into the anchorage as the sun went down. 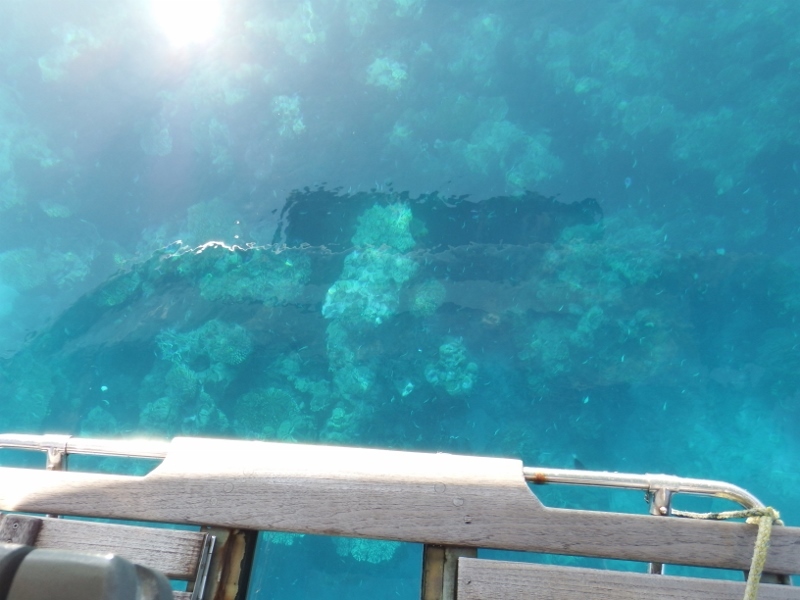 There’s a ‘shelf’ inside the reef to anchor on but as we were approaching I could see coral over the bow. It was far too late to play that game so we anchored in 18 metres further out. Bit exposed but we could move in tomorrow when it was safe with the sun overhead. Our journey of 715 nautical miles had taken 5 days 8 hours giving us an average speed of 5.58 knots not bad considering we were travelling at 2 or 3 kts the first few days with the current against us. Our agent Assad brought the customs, immigration, etc out to us to check us in along with a tub of ice cream! How good is that? Check in took about half an hour then it was showers and bed. We were tired. 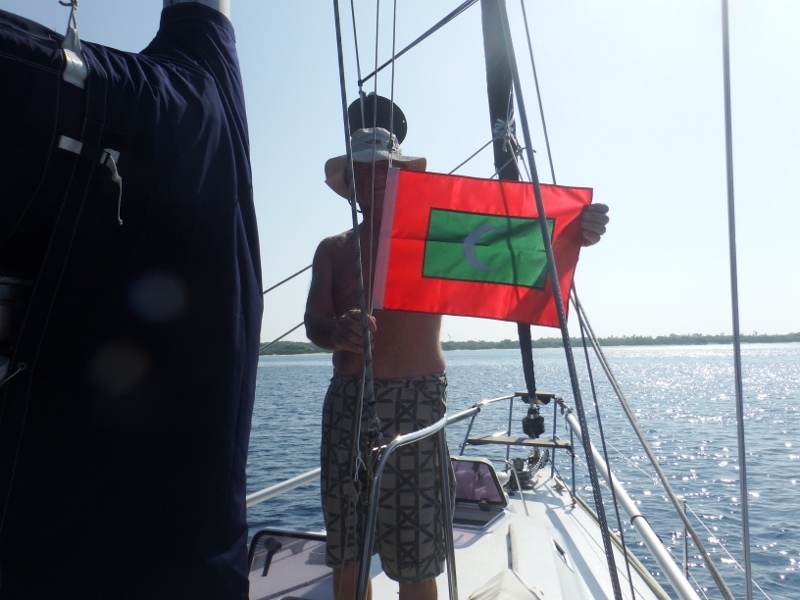 The next day Bill raised our Maldives courtesy flag. As the next day was Friday we stayed on the boats. 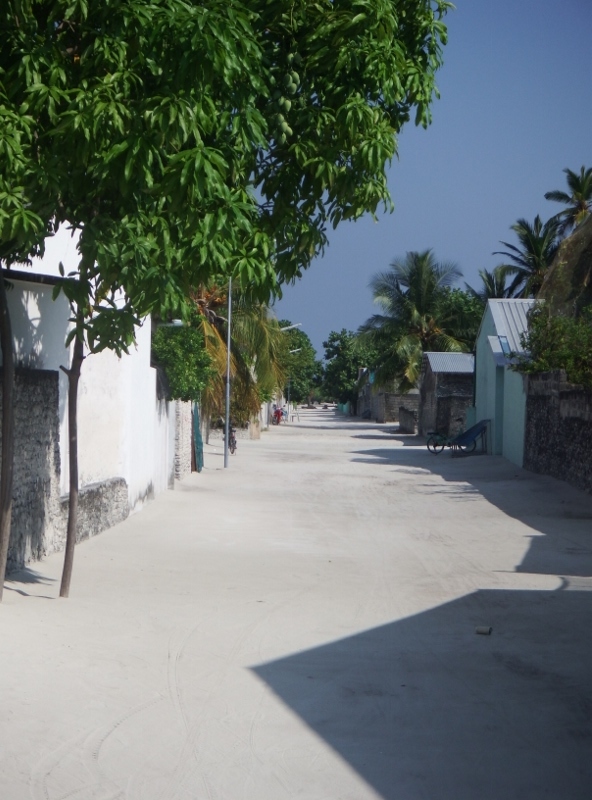 The Maldives are 100% Sunni Muslim so Friday is their Sunday. The fact that they are muslims also means there’s no alcohol sold here, only very expensively in resorts!!! Now you can see why we stocked up. Assad came out to the boat to get our sims sorted for the phones and to set it up as a modem. The internet seems quite fast here so that’s a change. 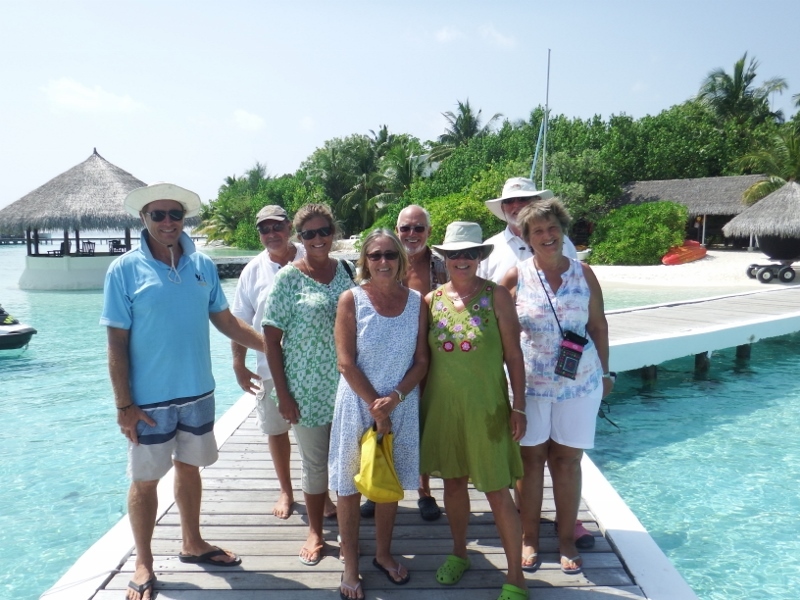 On Saturday Inspiration Lady, Tintin and Camomile crews went ashore for a tour of the little village. There are only 500 people on the island and they basically belong to one of two families. There aren’t any cars. This is the main road through the village. Some of the villagers have lived on the island all their life. The land is mostly sand so not very much grows here but they do have some wonderful trees. 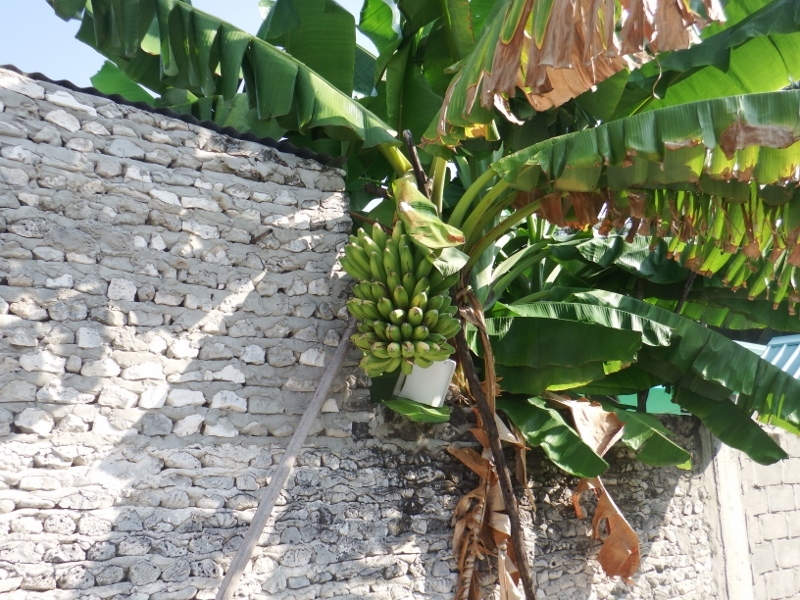 This banana tree was laden with fruit. Take a look at the wall, it’s made of dressed coral which means they cut it and shape it before using it to build houses and walls. It’s not allowed any more but there are still some beautiful pieces around. 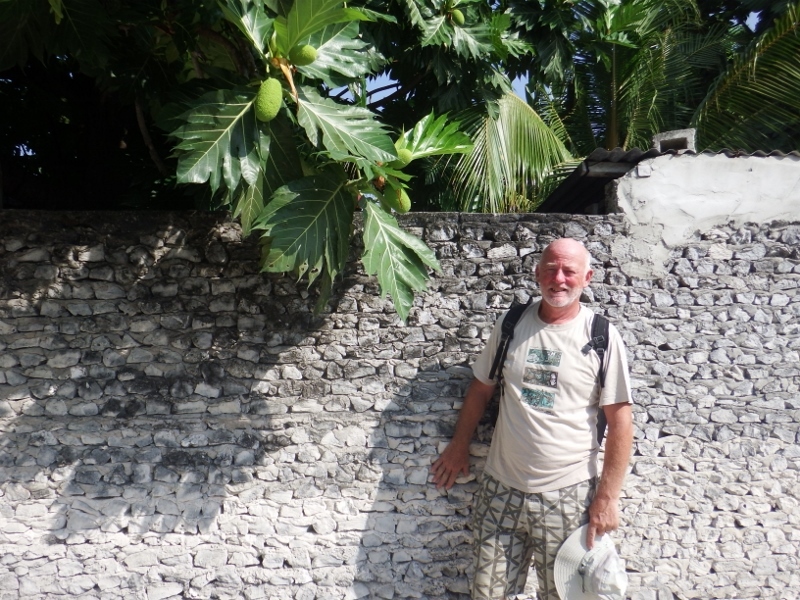 A beautiful bread fruit tree with another lovely coral wall. This was the end of the village. Just jungle beyond here. 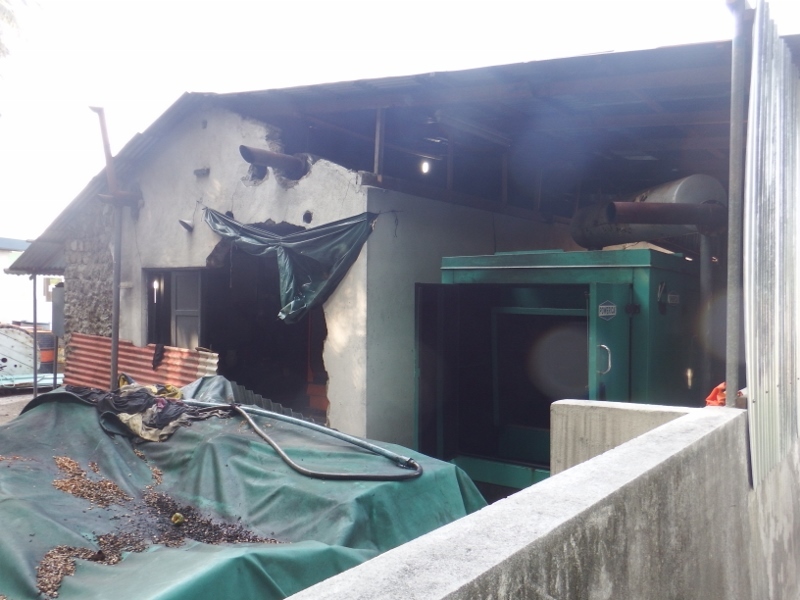 Right next to the end of the road is the generator housing. Pumping away 24 hours providing power for homes of the people. 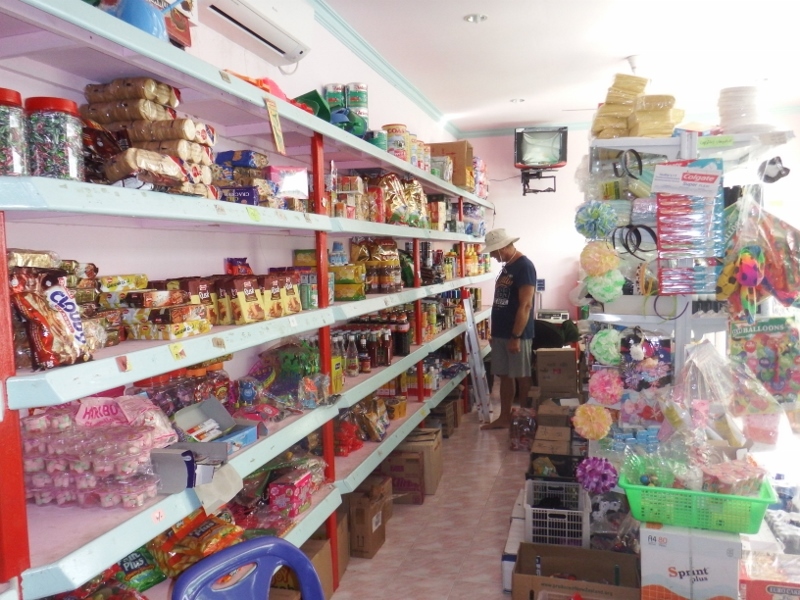 There are 2 shops on the island, this is the bigger one of the two. 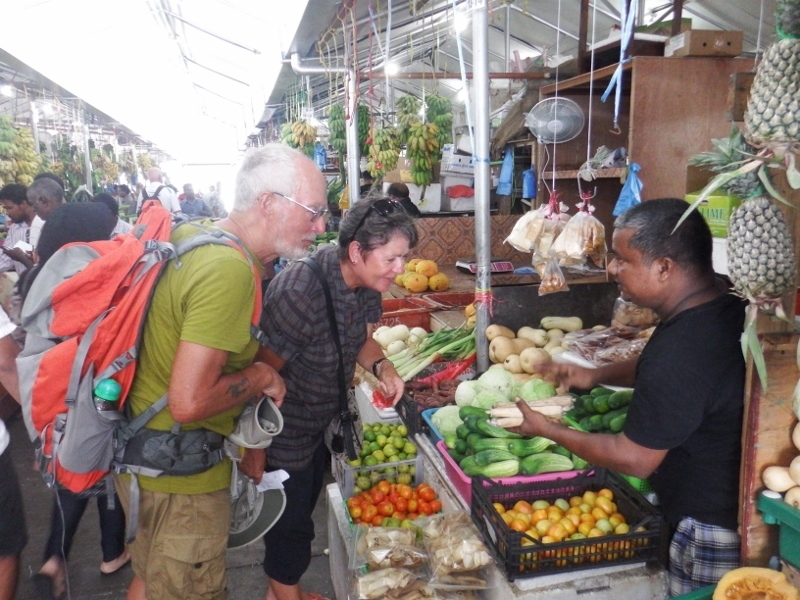 It seemed to have a fair sized selection of goods but very little in the way of fresh stuff. I’ve ordered some bread which is coming on the supply ship on Monday. I still have quite a lot of supplies from my Sri Lanka stock up but I could do with some lettuce and apples. Will be interesting to see what else turns up. I found these adorable little girls at Assad’s house the one on the left is his daughter. They were like a pair of dolls. So sweet. Assad took us to see the village school although being Saturday no one was there. 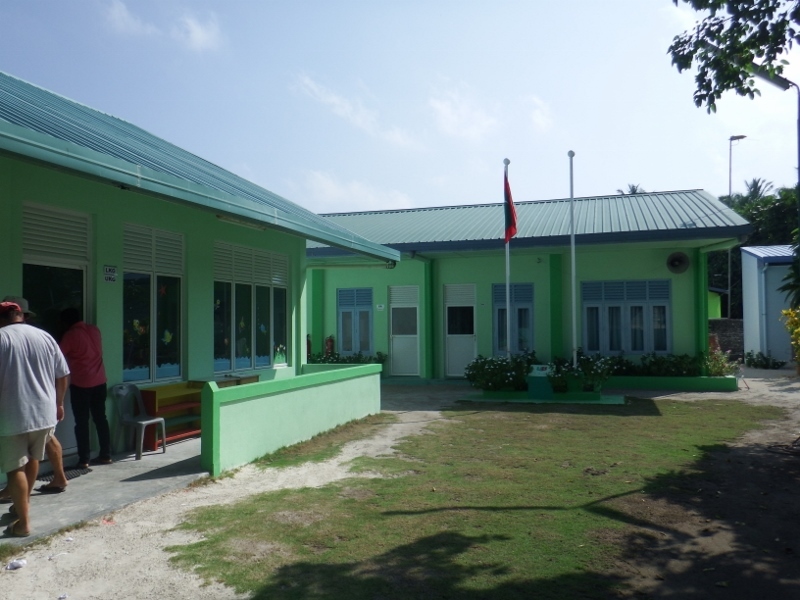 It was in very good condition but being run like the schools were 50 years ago. 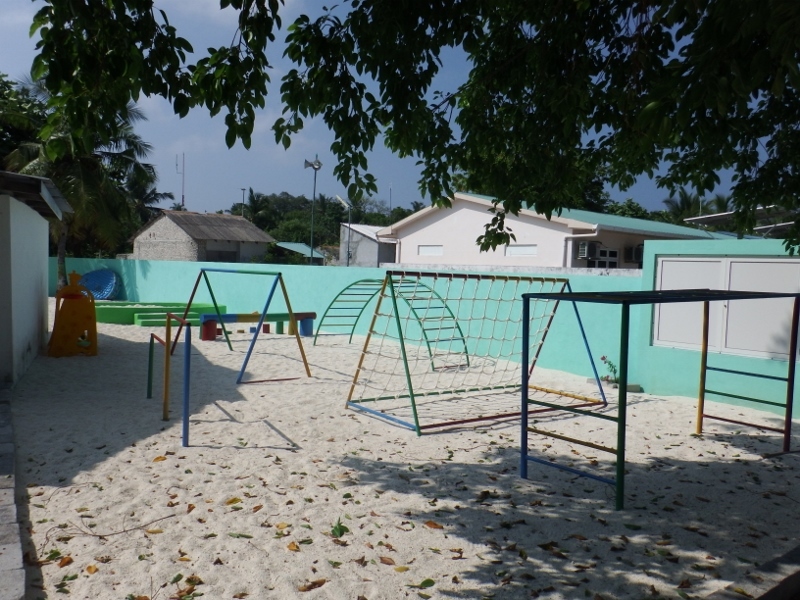 Ages 6,7 and 8 in one class room, 9, 10 and 11 year olds in a second classroom and a couple more classrooms for the older children. At 16 they take a Cambridge exam like a GCSE if they pass the government will pay for them to go to Mahe and at 18 they take further exams, A levels, for a place in University. There are also Btec courses for the ones who don’t pass the exam. There isn’t much for them to do on the island and I think most of them would probably stay on in Mahe once they had finished their education. That means the island will slowly die out if the young people don’t return but we’ve seen that so much in our travels. We walked back to the jetty and the dinghies. Assad invited the 6 of us to a meal at his house that evening to try some local food. Meanwhile Bill and I still hadn’t been in the water and we’ve been here for 2 days so we headed back to Camomile. Two of the other boats had left leaving two spaces on the ‘shelf’ so Camomile and Inspiration Lady took them. 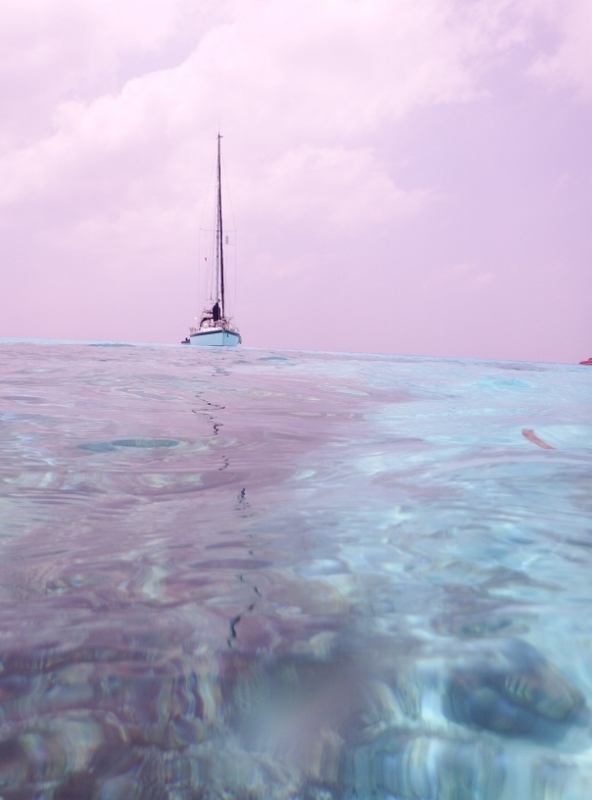 We are now anchored in the most stunning aquamarine colour. It’s like being anchored in a swimming pool. Meanwhile in the water ….. I tried to get a photo of Camomile with the coral underneath but it didn’t quite work but close. 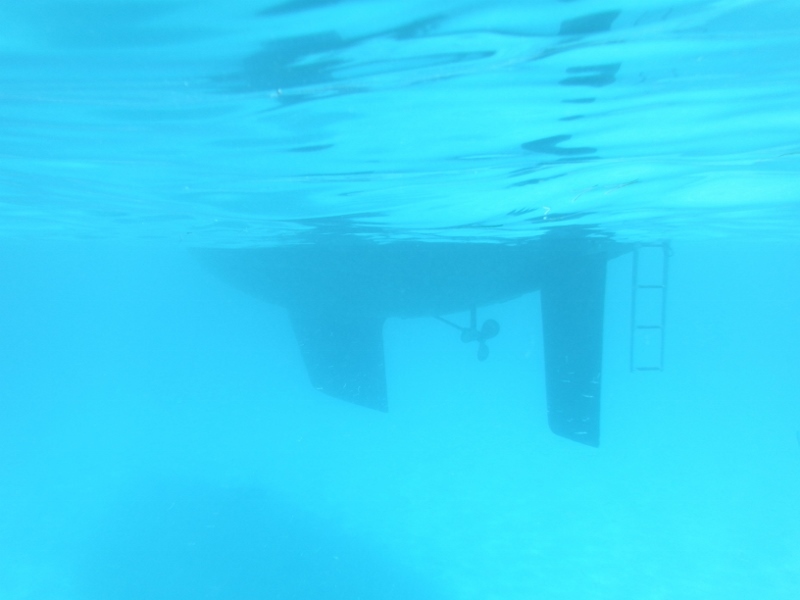 This is our keel under the water. 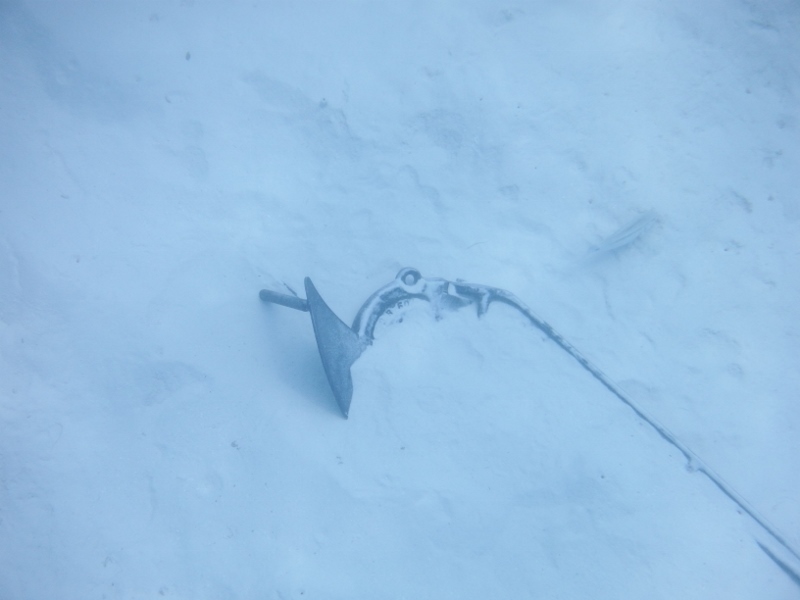 and the anchor in about 5 metres of water. So clear. 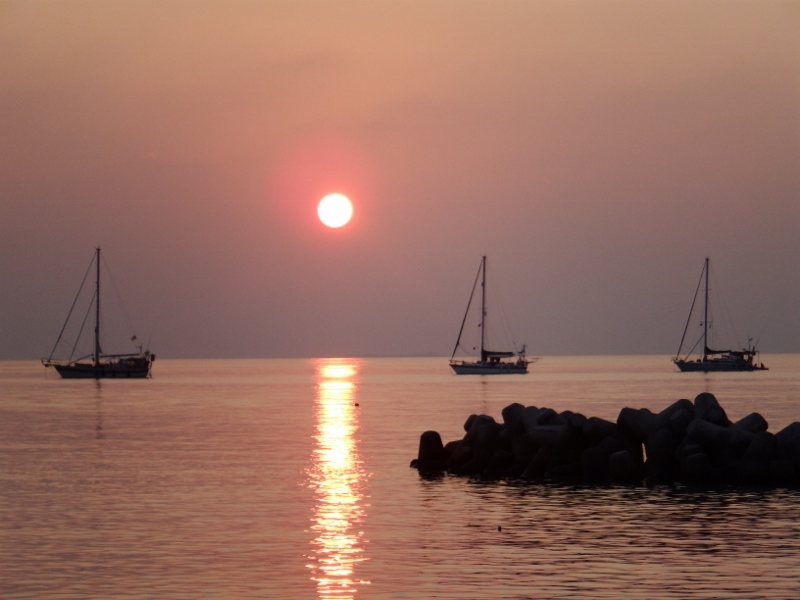 That evening we went back ashore for our wonderful meal. Sitting on the bathing platform with my feet in warm, clear, azure blue sea overlooking white sand beach eating my breakfast of fresh sweet pineapple, yoghurt and museli with a pod of at least 40 harbour porpoises (about half the size of dolphins) swimming in the water not 50 metres from the boat with one juvenile who had obviously just learnt to jump and pirouette in the air (wonder if his name is James) with them. 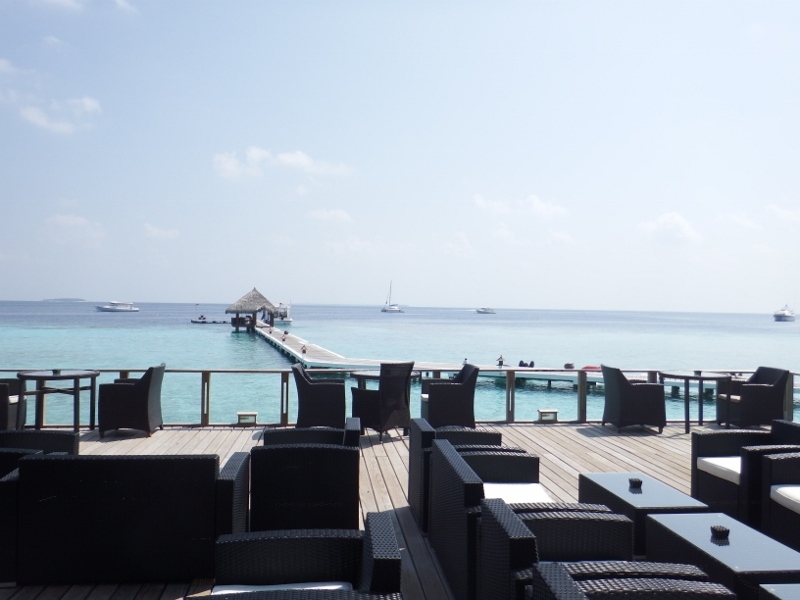 We have arrived safely in the Maldives. Can it get any better than this? Fishing boat coming really close, not the fisherman right up on the bow. It was a really good sail yesterday 15kts of wind on the beam. It means we were heeling quite a bit but we made good progress. The ships have stopped passing us finally, as they go further north, and no more fisher men asking for booze and cigarettes. They were quite harmless but when you see a fishing boat motoring directly at you it’s very worrying. It happened twice and each time we put the engine on and motored away from them as fast as we could, they soon gave up. The wind died completely at 7.45pm and we were down to 3kts. We’ve sailed that slow before but it would have meant we wouldn’t have arrived until the middle of the night which isn’t wise so the engine went on and we’ve motored since. At first, as there wasn’t any wind at all, the sails came down because they flog badly which doesn’t do them any good but this morning the wind picked up a little and we decided to raise the sails again. That’s when we noticed the boom vang was broken. 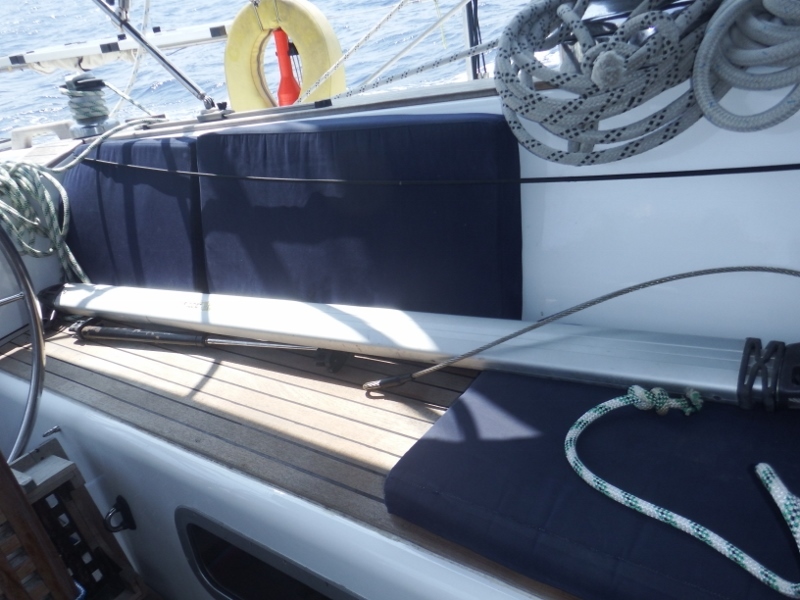 The boom vang or kicking strap holds the boom in position and is essential for sailing. Without it the boom can’t be pulled down and the sail flattened when necessary. It also holds the boom up and stops it crashing down on our heads or the bimini cover because it has a gas strut inside it. 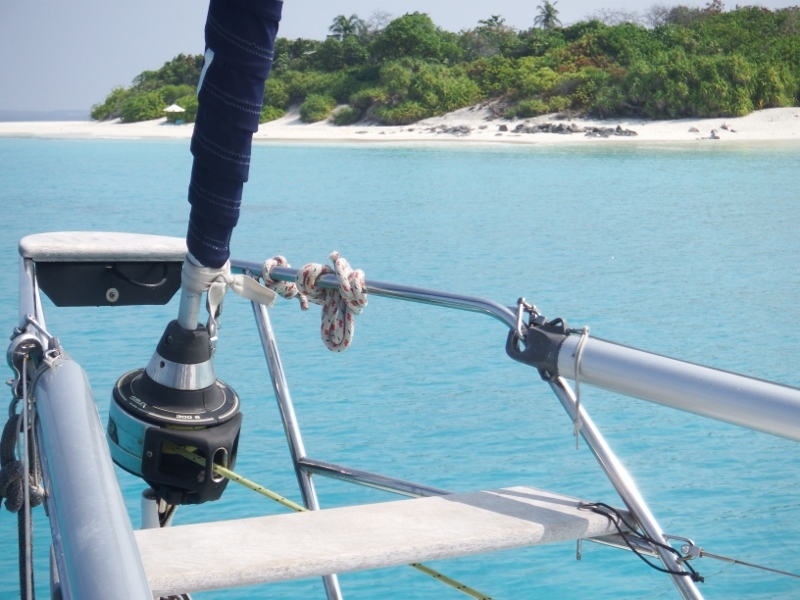 Yesterday I had noticed some black stuff on the deck at the bottom of the mast and had blamed the Tanna volcano dust again (we still find traces of that even though it’s almost 4 years since we were there). Bill managed to disassemble it and bring it in. 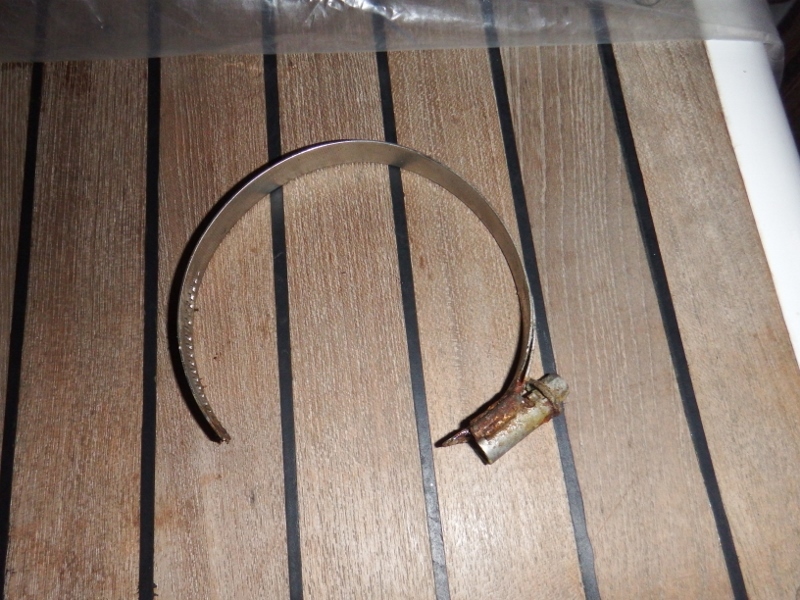 When he took it apart he found the gas had escaped from the gas strut because the seals have failed on one end. So for the time being the boom vane will be a passenger and Bill has rigged up a rope kicking strap temporarily. The black stuff on the deck must have been bits of the seal. Bill rigging a kicking strap temporarily. We continue to motor sail and should be in the anchorage this evening. Tintin are ahead of us so they’ll have to buy the ice creams again! Firstly apologies for not writing my report yesterday. I only get about 2 or 3 hours spare during the day when I’m not on watch or sleeping and it was write a report or make a banana loaf – the banana loaf won, and it was yummy! Going back to the 29th there was great excitement as we passed the southern tip of Sri Lanka and got a signal albeit for about 15 minutes. I was able to read my lovely messages from everyone – Thank you. The southern tip of Sri Lanka also had a lot of shipping, it reminded us of Singapore although not so many ships anchored. However there were a few ships anchored or hovering by the port of Galle and we watched several of them being loaded with personnel and goods. Then we realised what they were doing, they were loading mercenaries and weapons onto the ships that were going up the Red Sea. We have friends heading that way this year because they think it’s safe, if it’s safe why were these big ships going to the trouble and expense of taking guards on board? 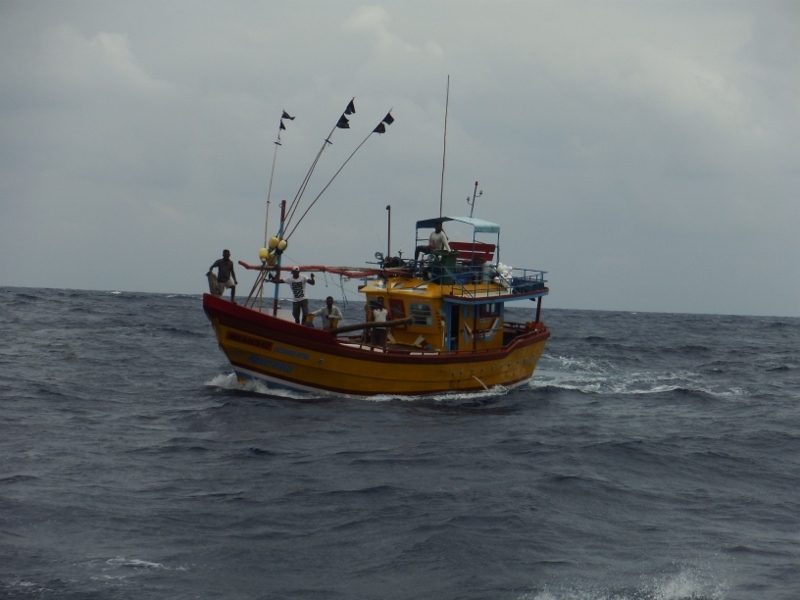 It also reminded us that we are heading into troubled waters and even fishing boats are looking suspicious. 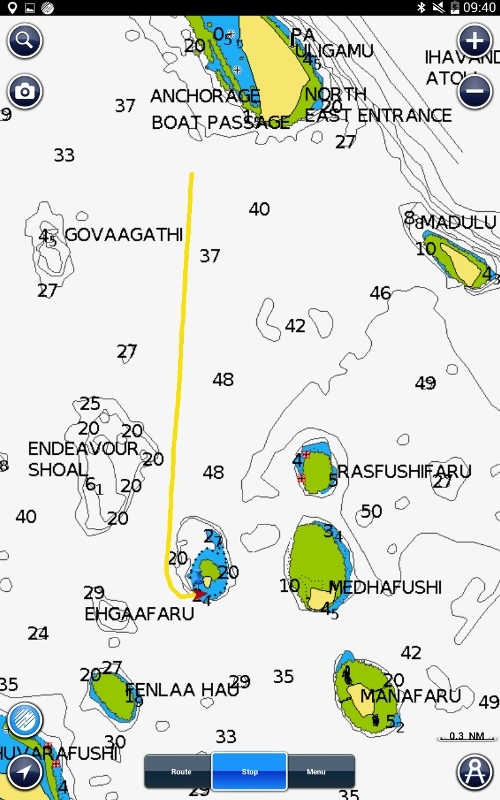 The Maldives have been taken out of the HRA (high risk area) so should be safe. 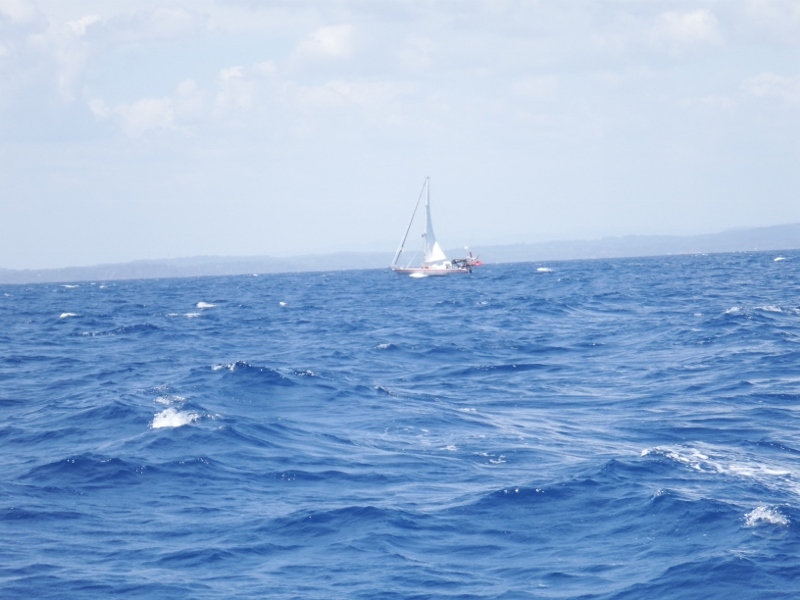 Once clear of Sri Lanka the wind started building and we were able to sail properly with 15kts of wind from behind so the twizzle was up again but this also built the sea up and there were 2 metre seas following us. The night of the 29th saw lots of lightening flashes but none near us thank goodness. 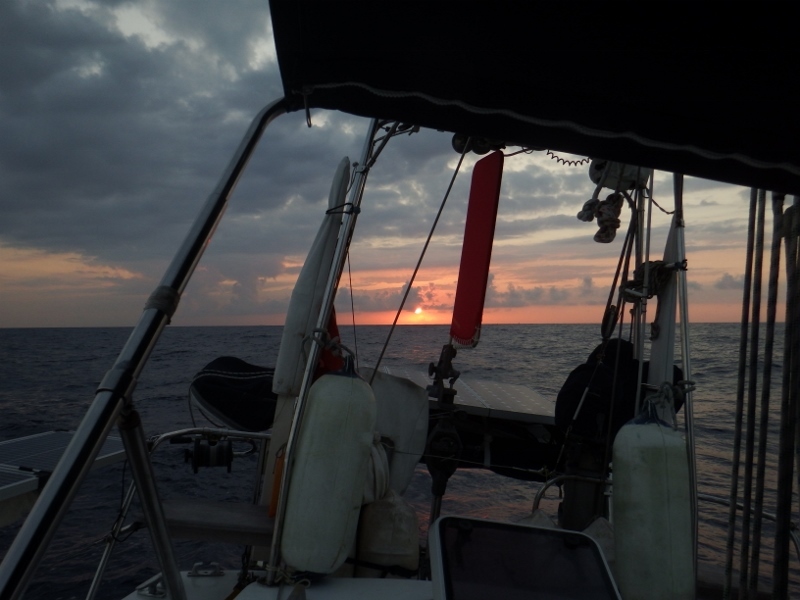 We sailed through the night with the twizzle rigged but by morning the wind dropped and we had to motor for 2 1/2 hours while the wind filled in from the north east giving us a beam reach. Deep joy every time I want to go to the loo now! 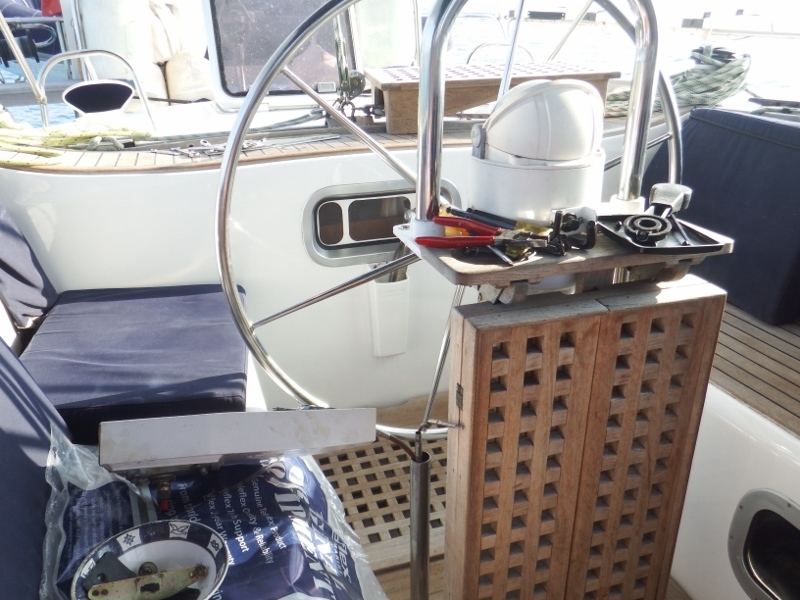 As I said I made a banana loaf on the morning of the 1st which isn’t easy wedged into my little galley but I seem to have got used to the movement of sailing again. Tintin and Inspiration Lady are ok and reporting their positions to me each day on the net. 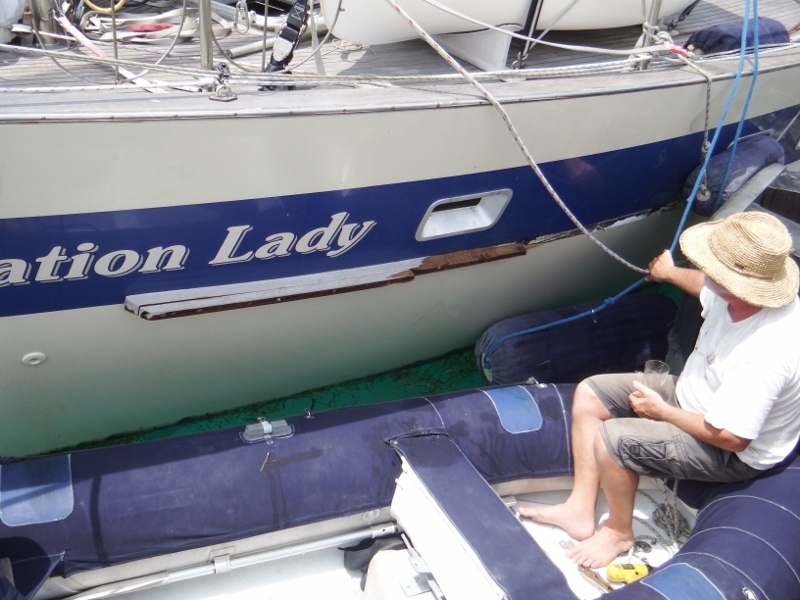 Inspiration Lady had a lot of trouble when the wind was building off the coast of Sri Lanka and managed to shred their code zero (big sail) getting it tangled with their genny halyard in the process. All is sorted now but Jackie will have some sewing to do when they get in. Tintin is about 14 miles away from us but Inspiration Lady is now about 80 miles behind us as they slowed down trying to sort out their rigging problems. They are sailing now so should be only a day behind us. We’re making good progress and might be in tomorrow afternoon but the wind is forecast to drop later today which will slow us down. If we arrive after dark we’ll have to wait outside over night. We won’t go through the reef in the dark it would be very foolish to try.